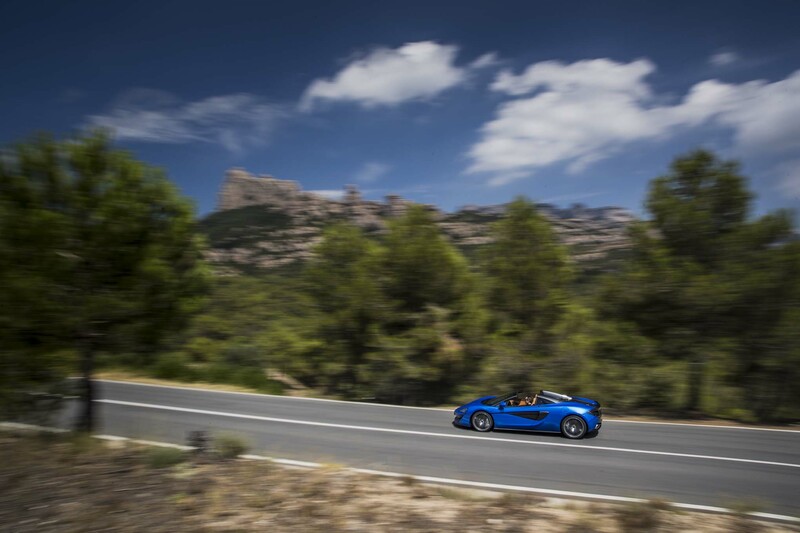 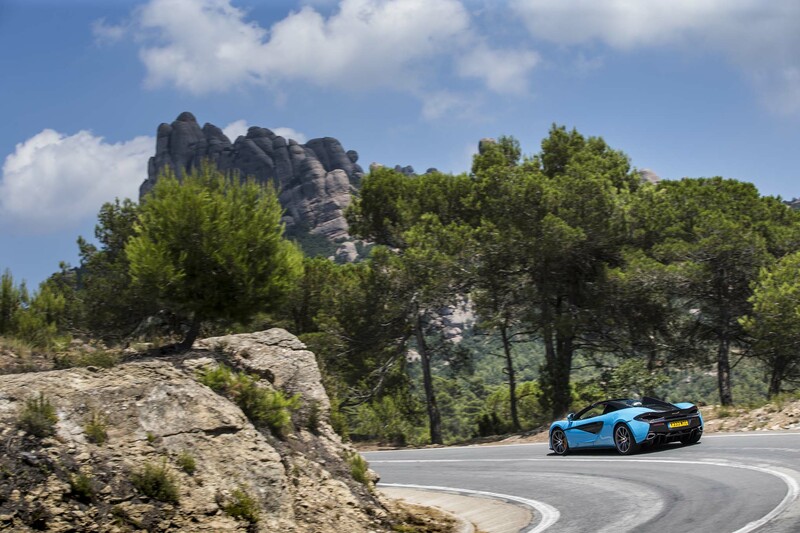 BARCELONA, SPAIN — Sometimes you find that sweet spot when a car and the road or track you’re experiencing it on are a perfect match. 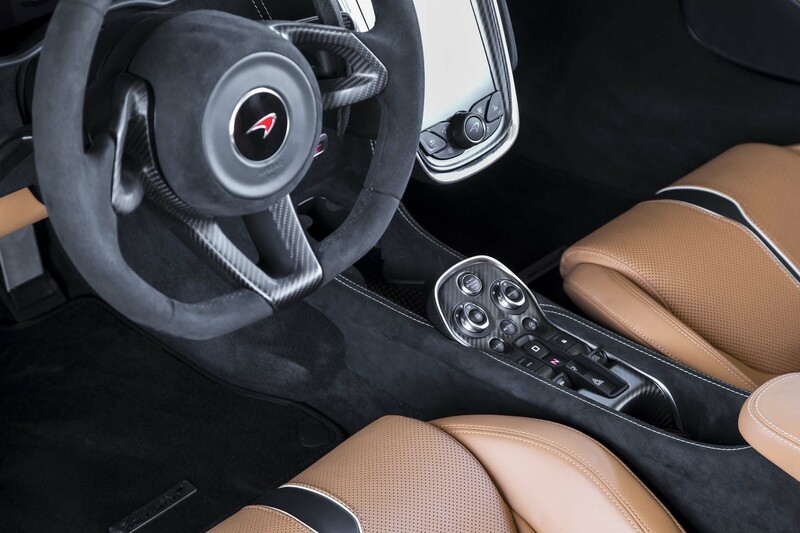 Everything flows and you seem smoother, cleaner, and more precise as a driver than ever before, the car dancing to your tune without a heartbeat’s delay. 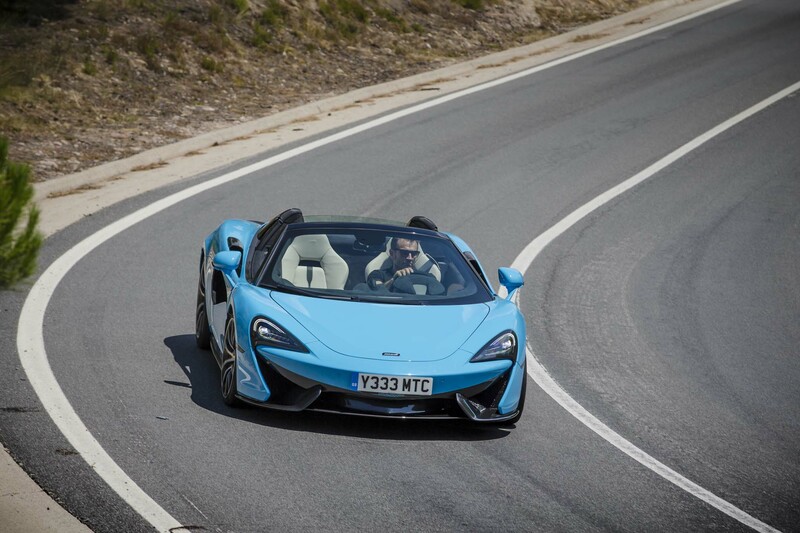 Back in October of 2015, I was in that sweet spot with the McLaren 570S on the Portimao race circuit in Portugal and the roads nearby. 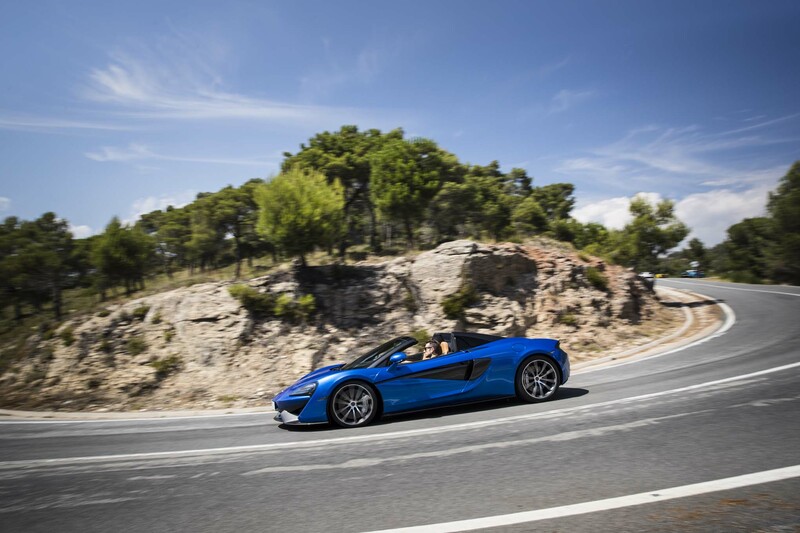 Something clicked that day and it was unforgettable. 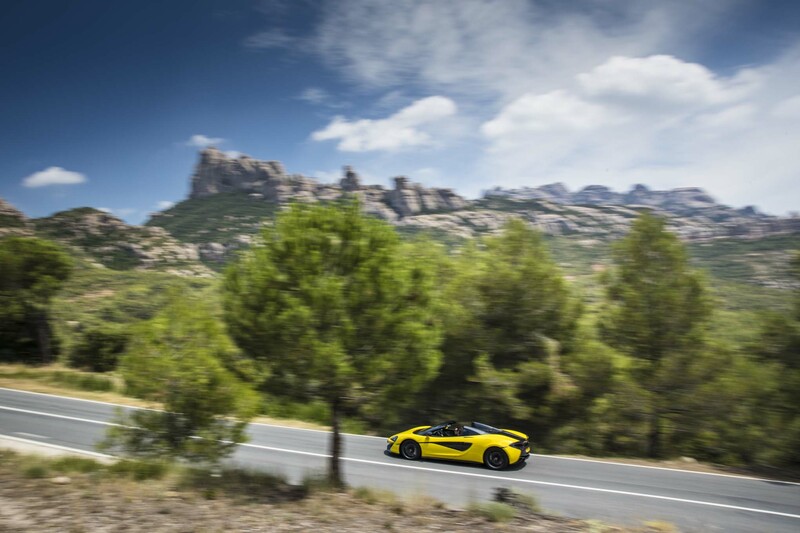 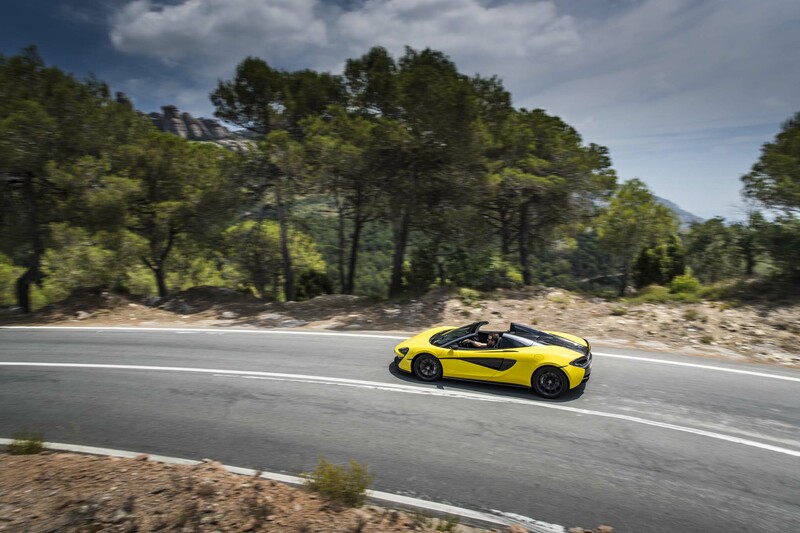 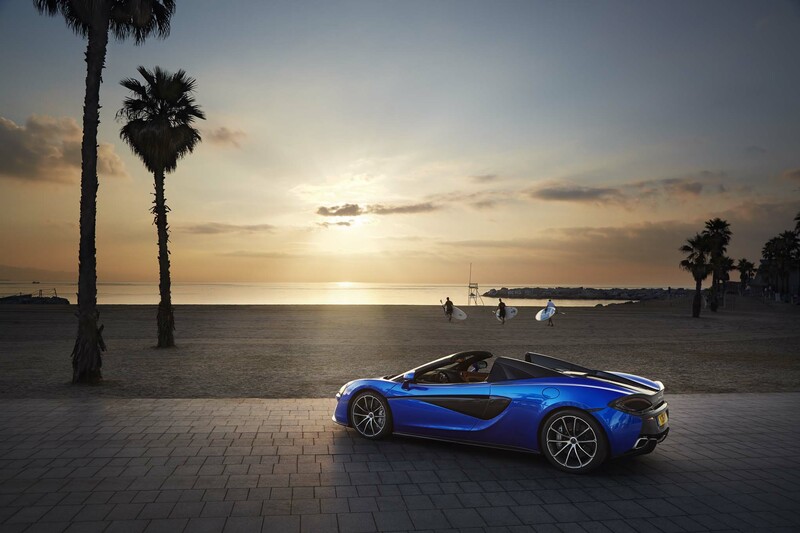 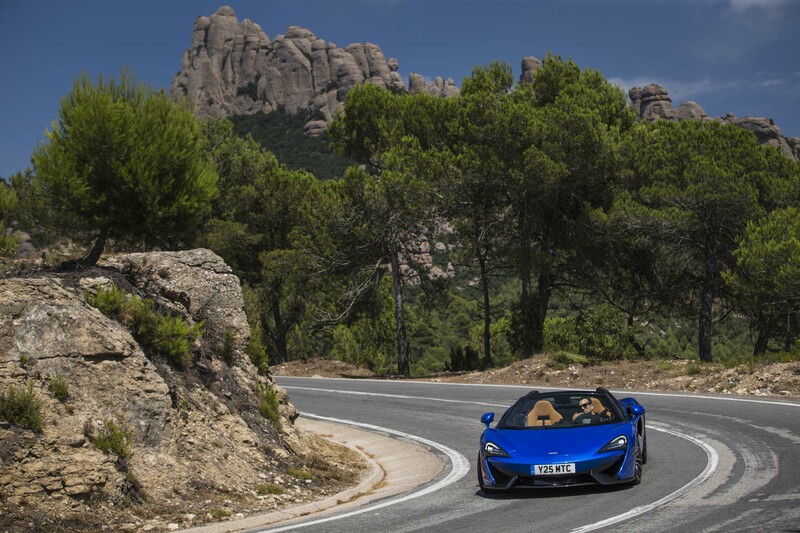 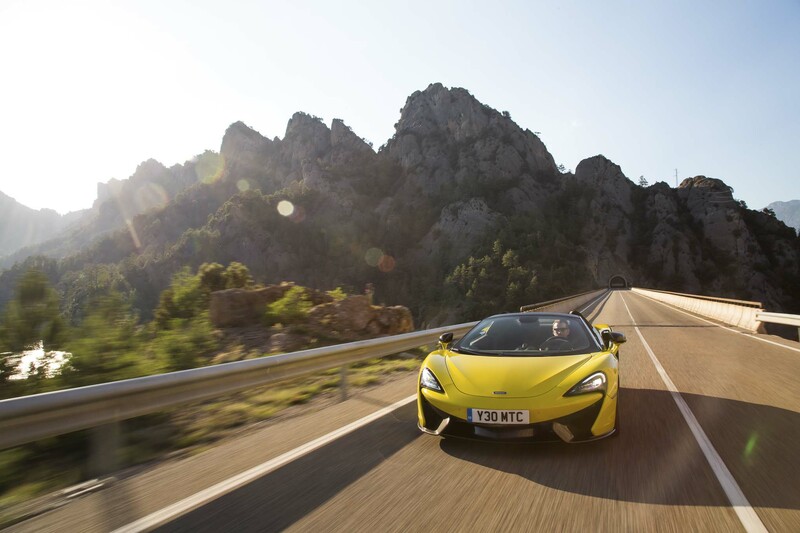 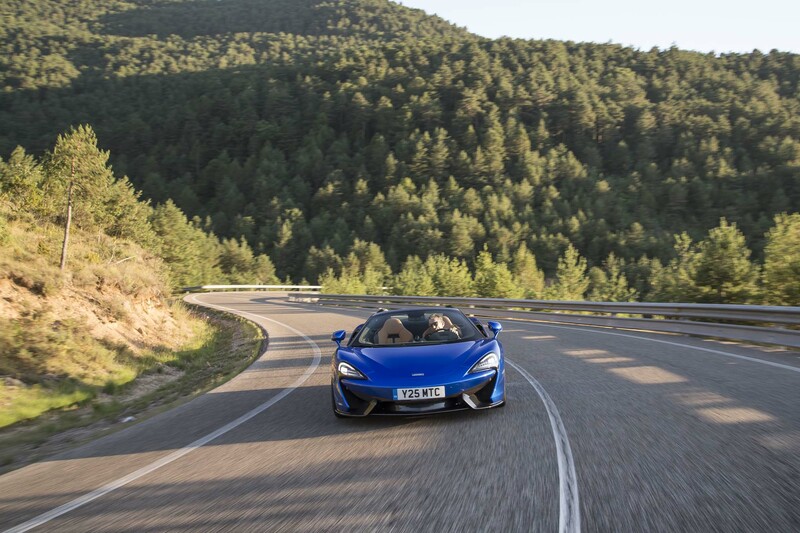 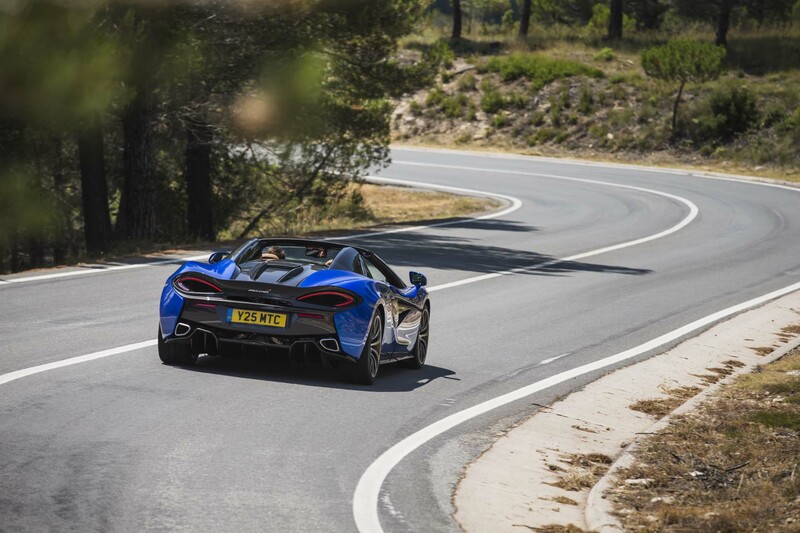 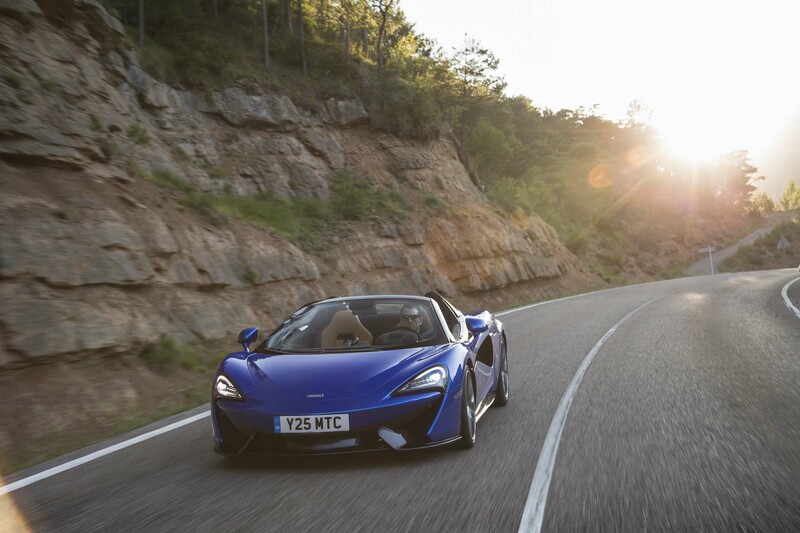 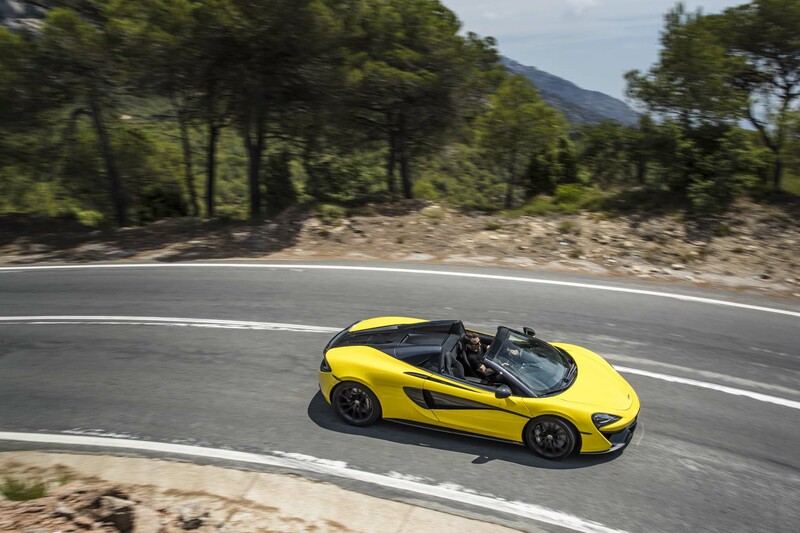 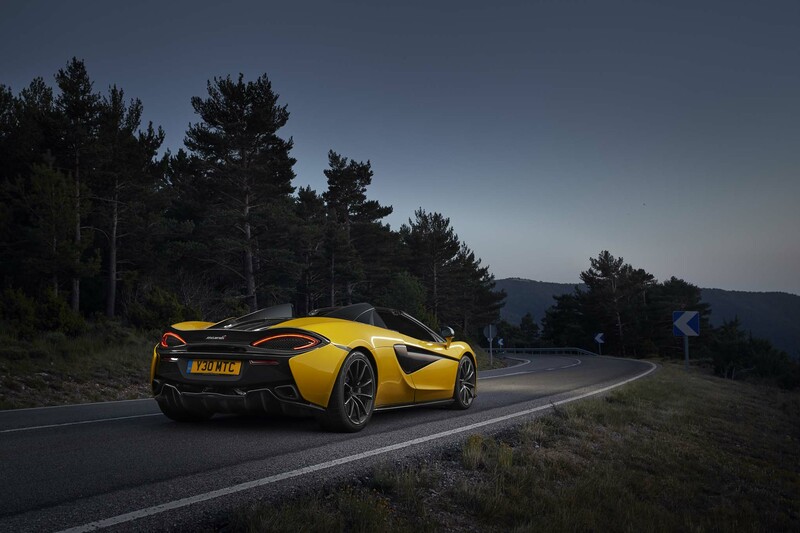 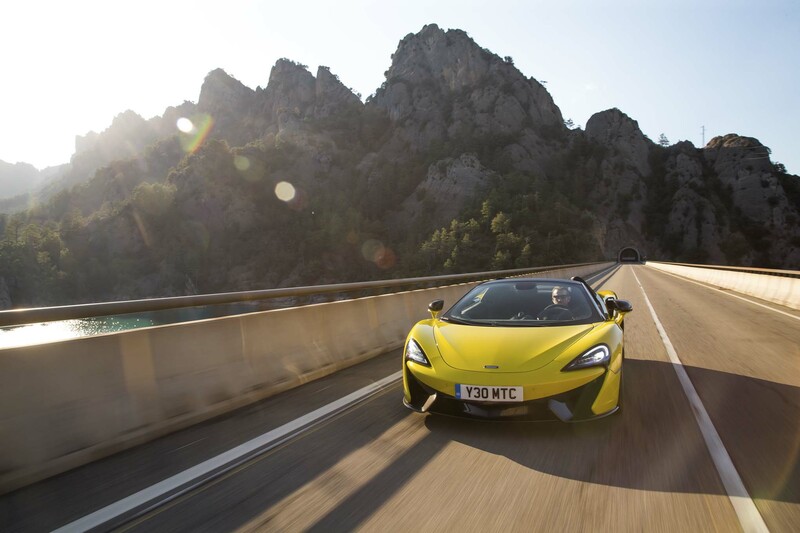 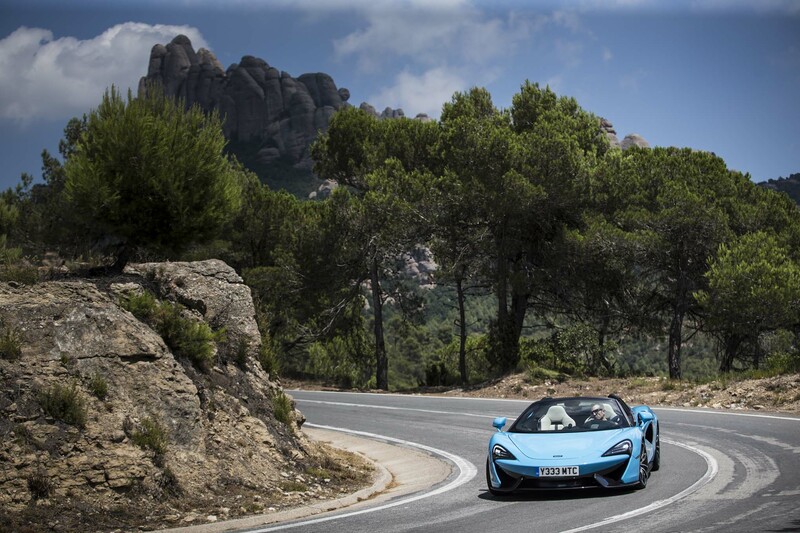 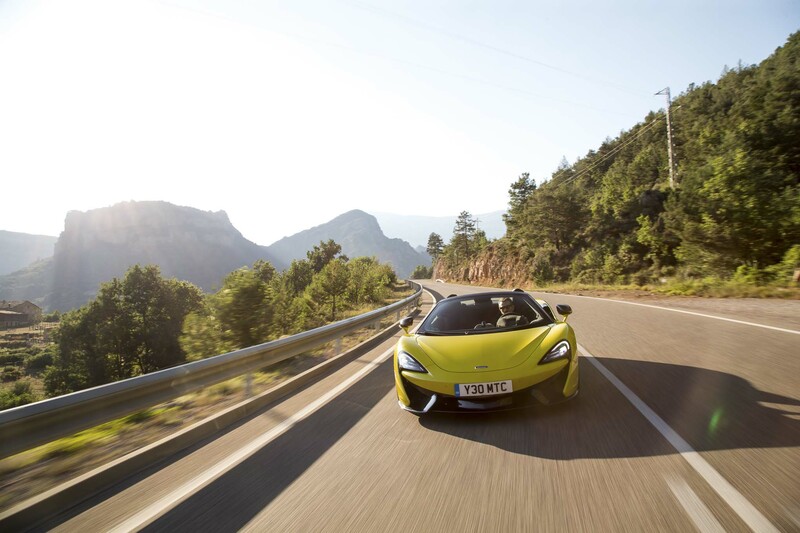 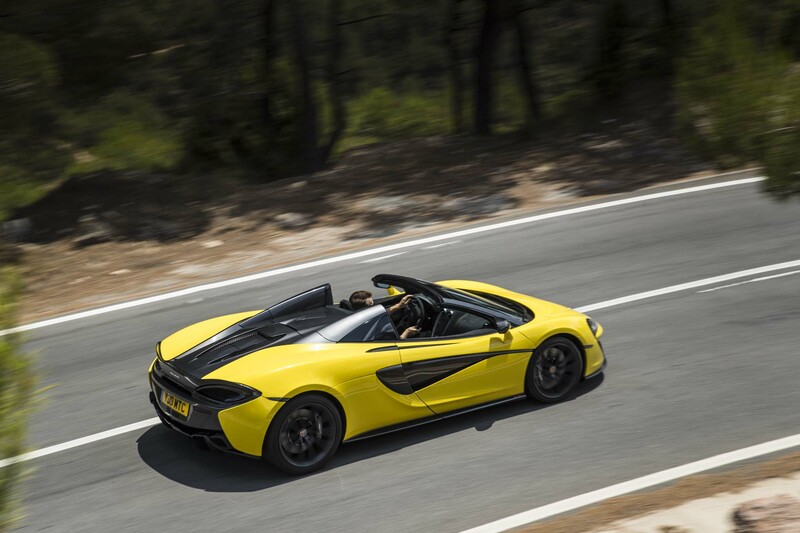 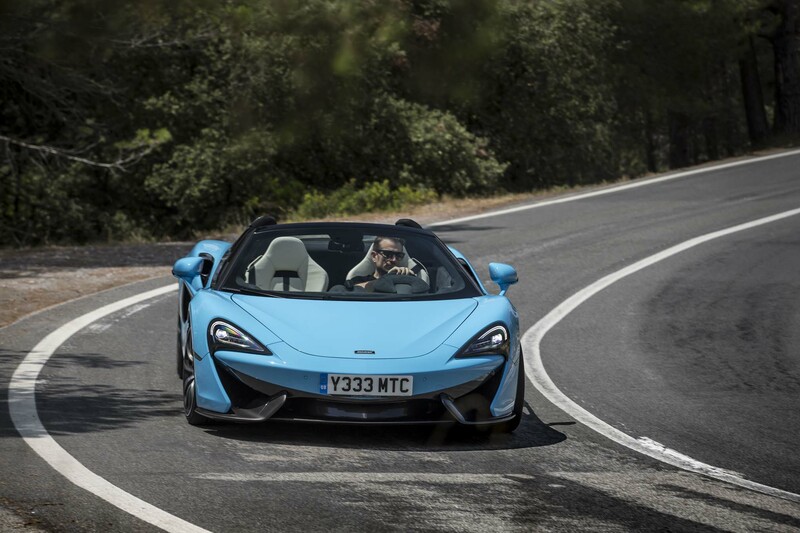 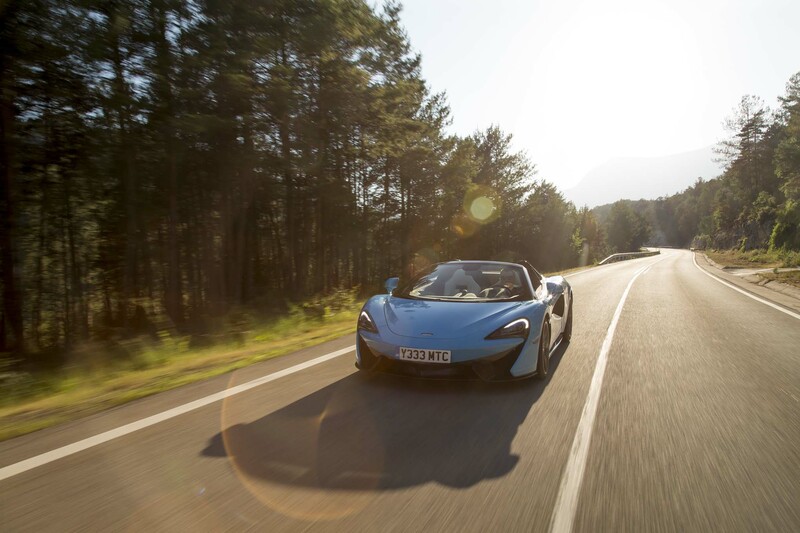 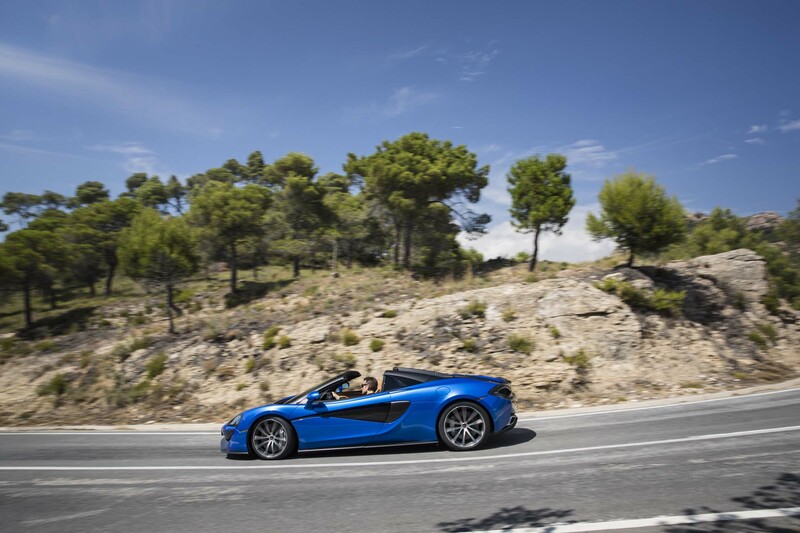 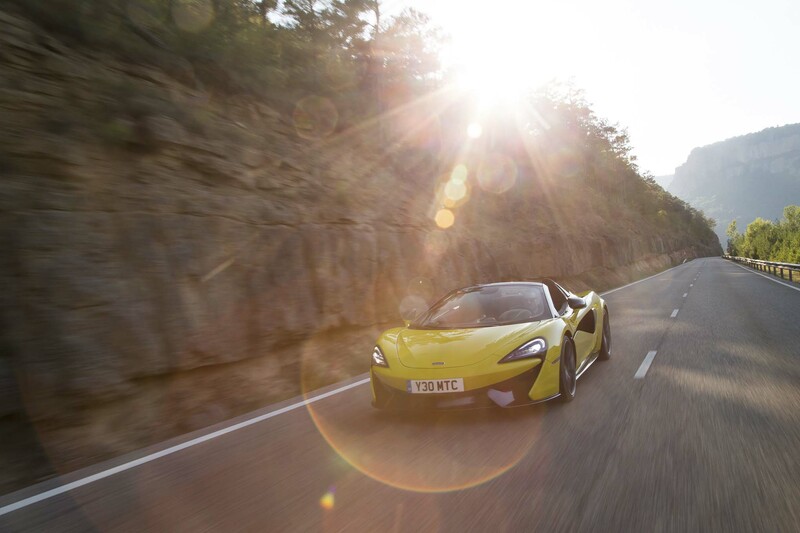 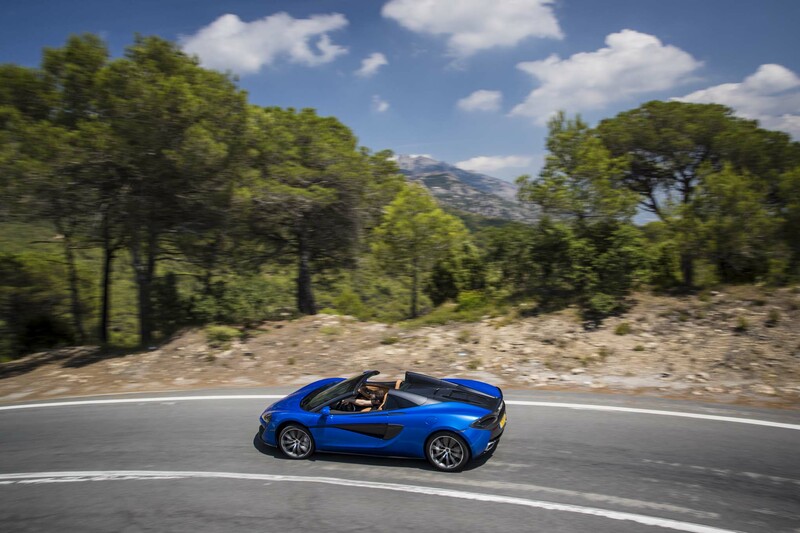 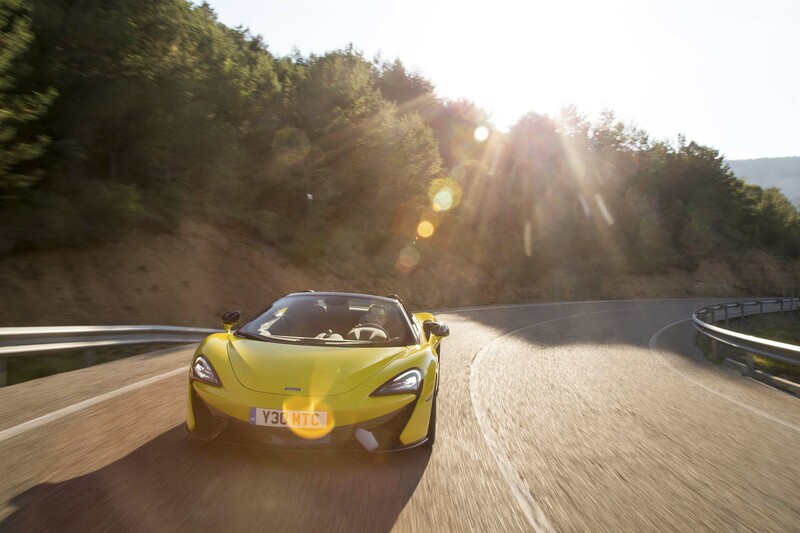 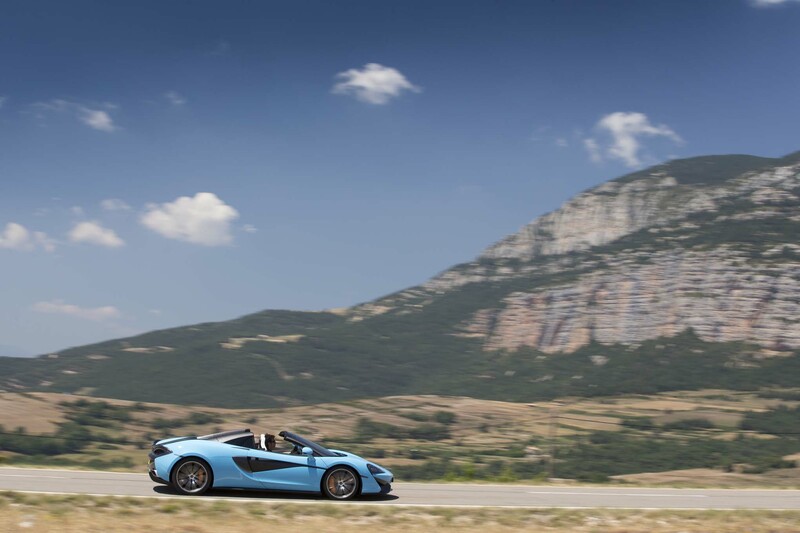 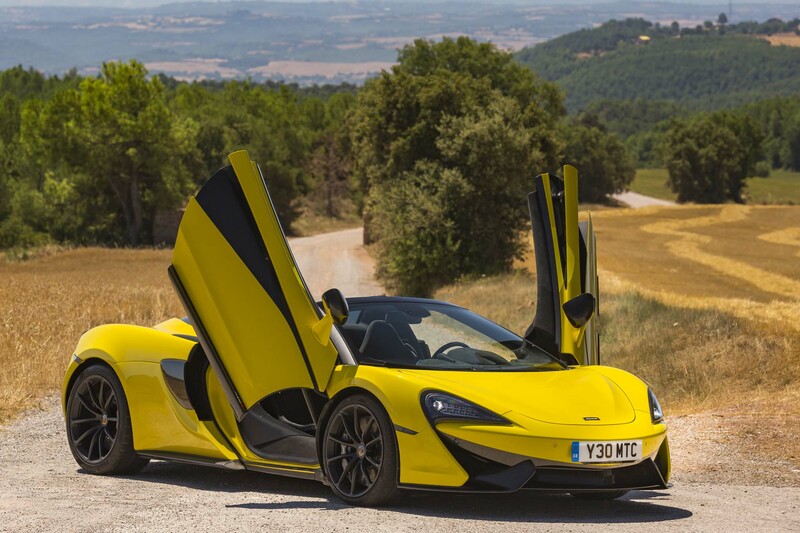 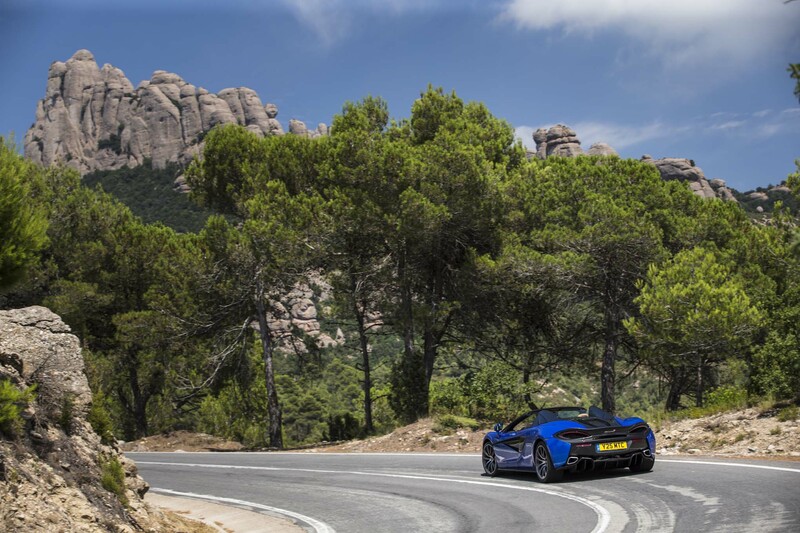 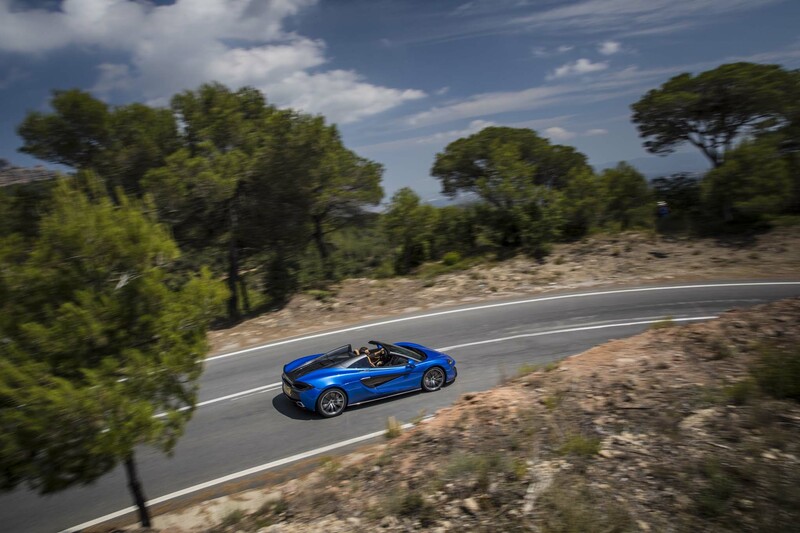 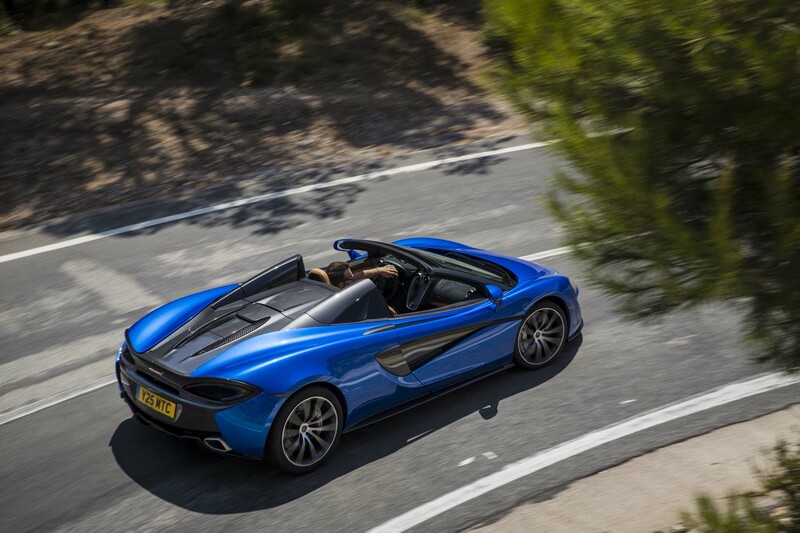 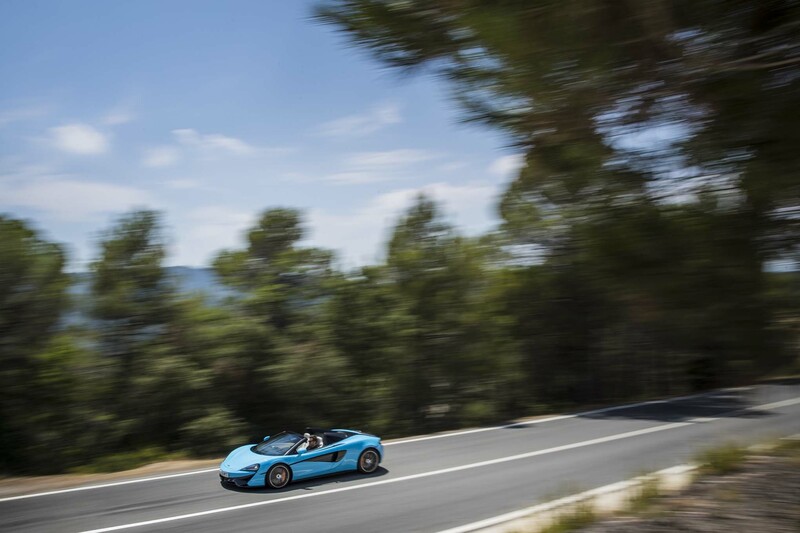 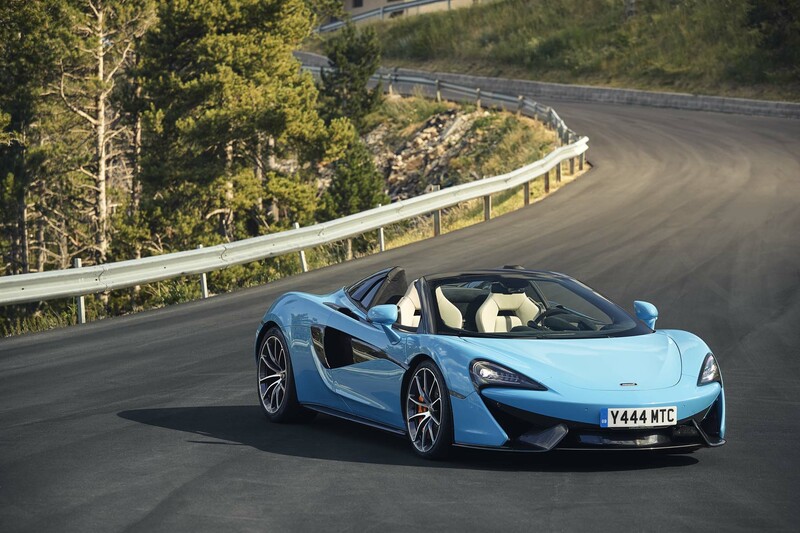 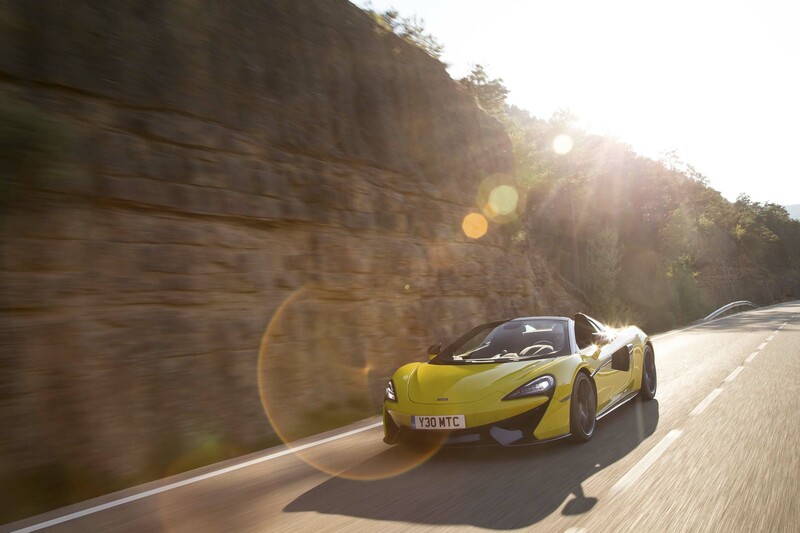 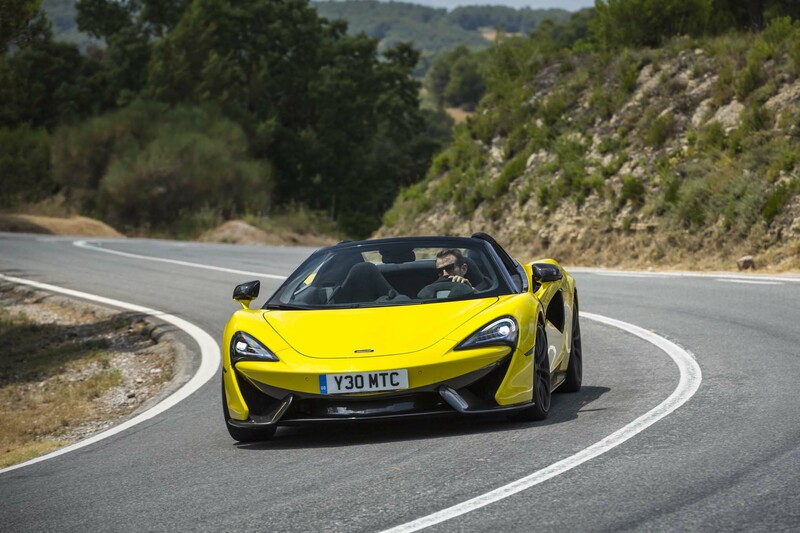 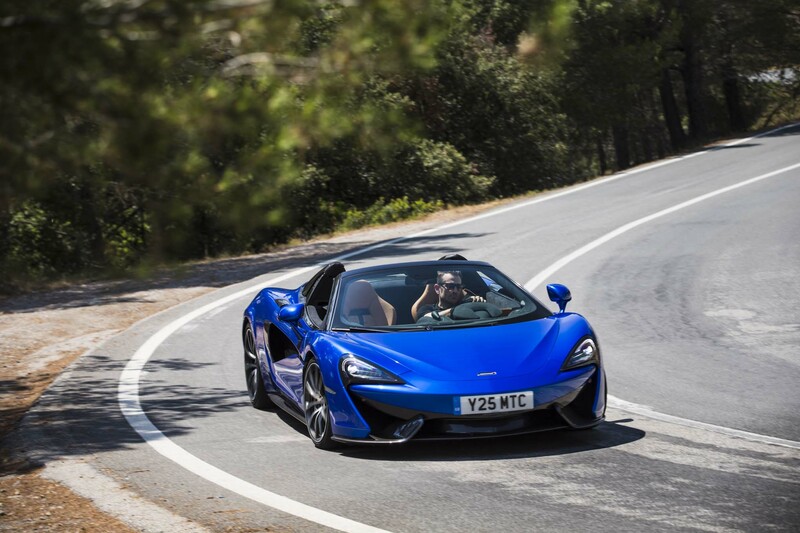 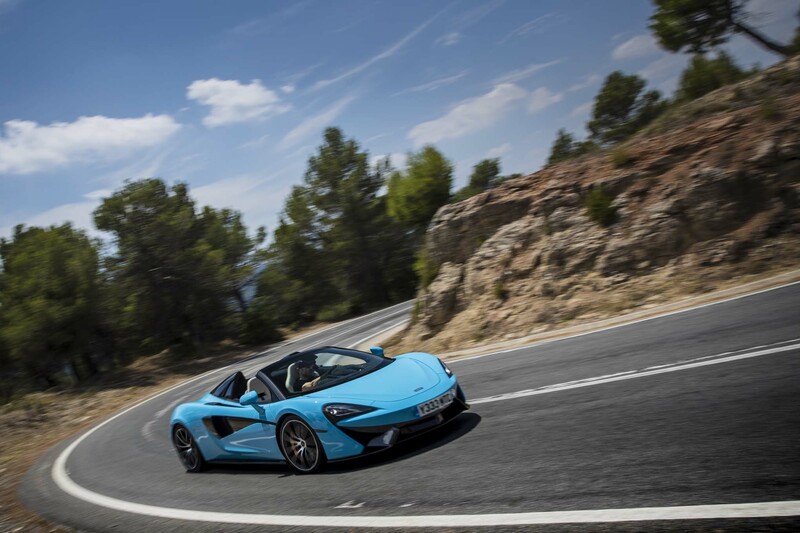 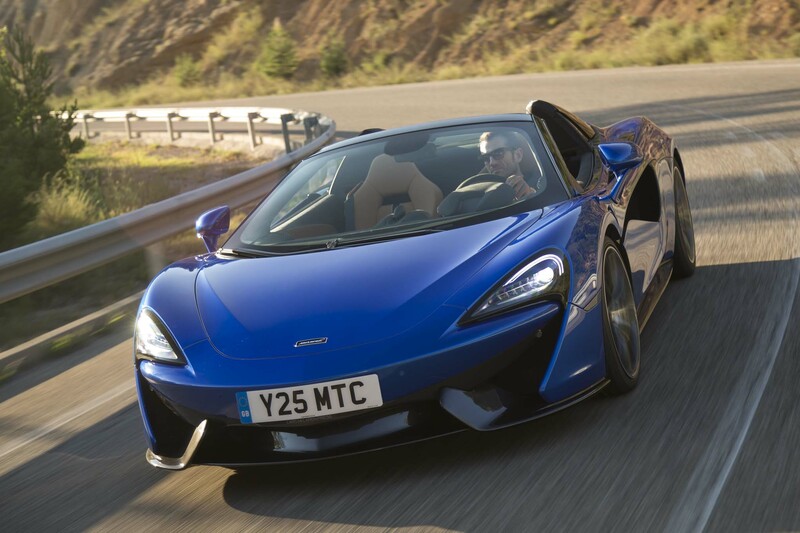 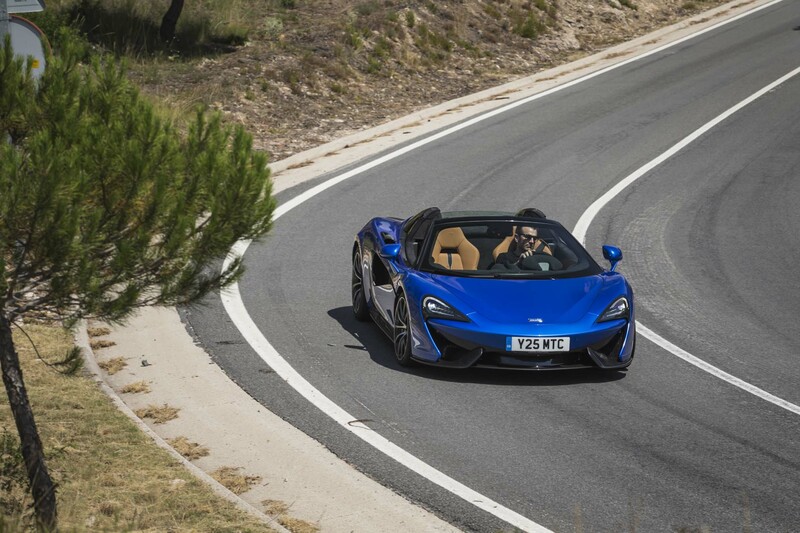 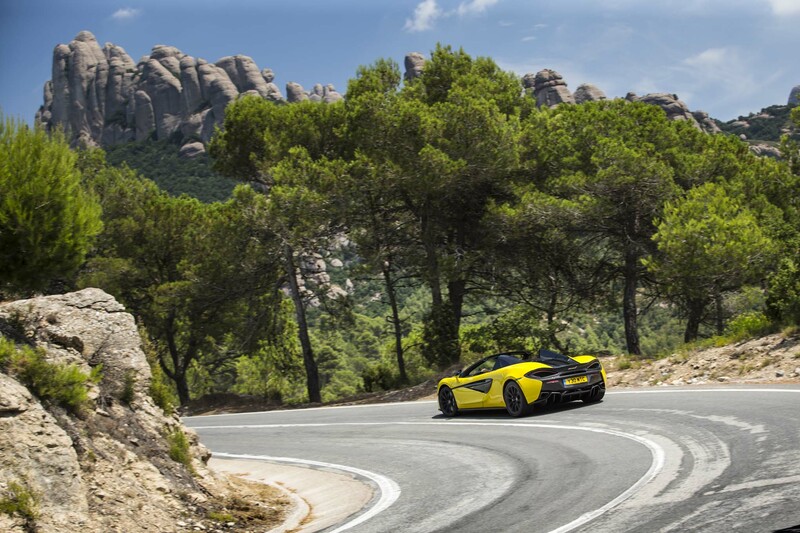 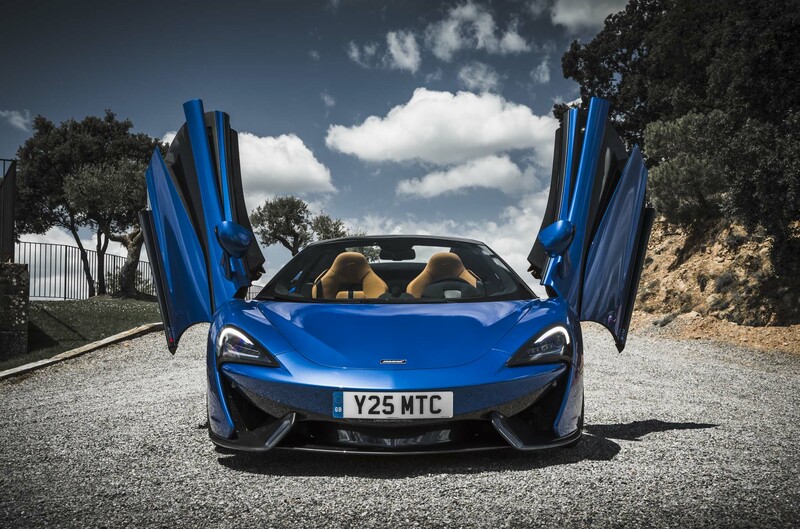 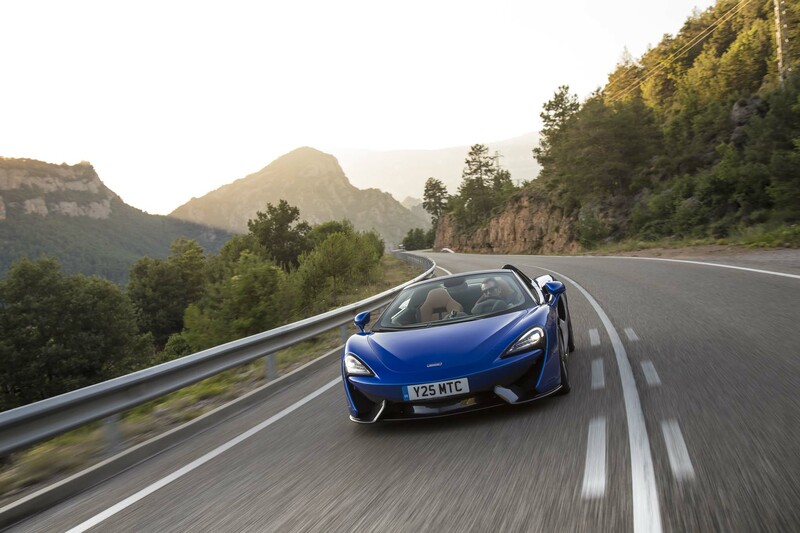 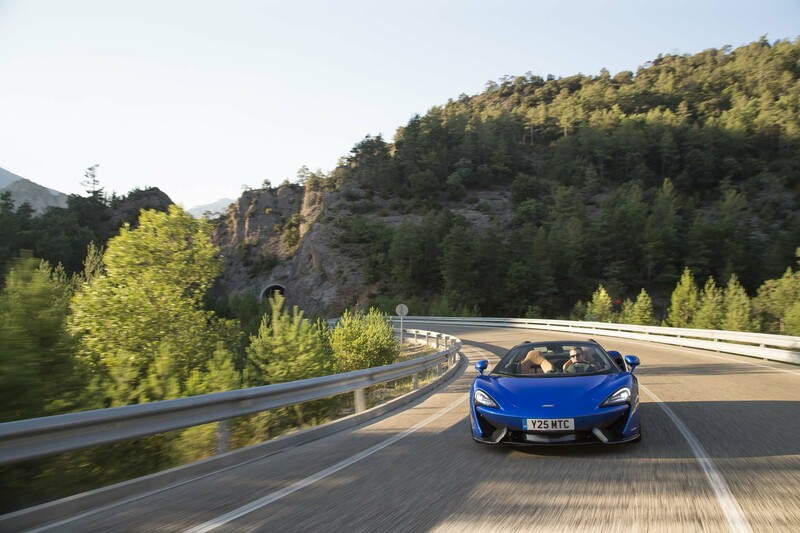 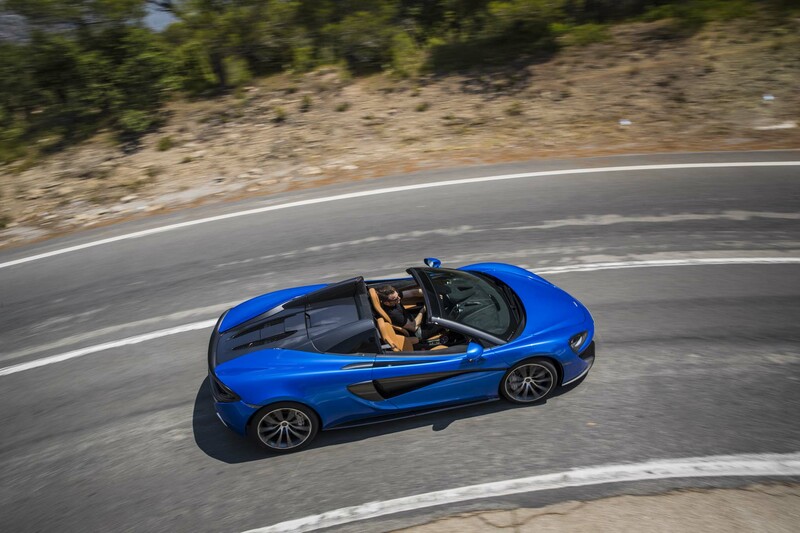 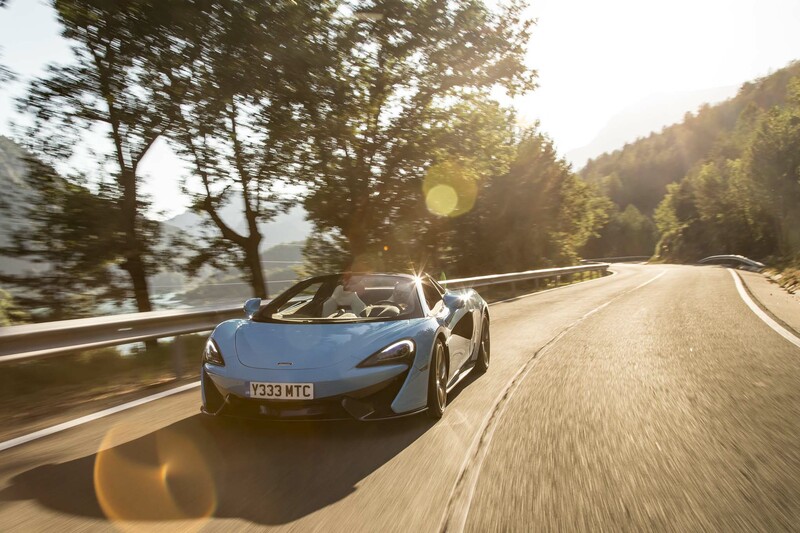 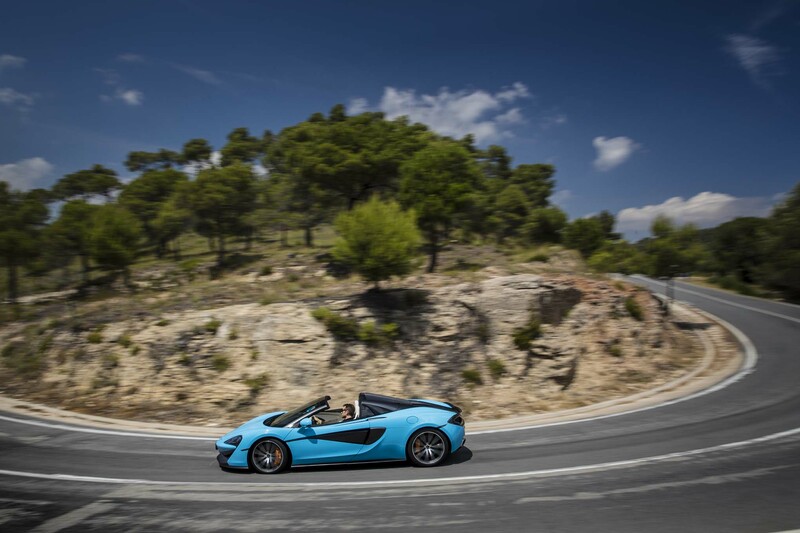 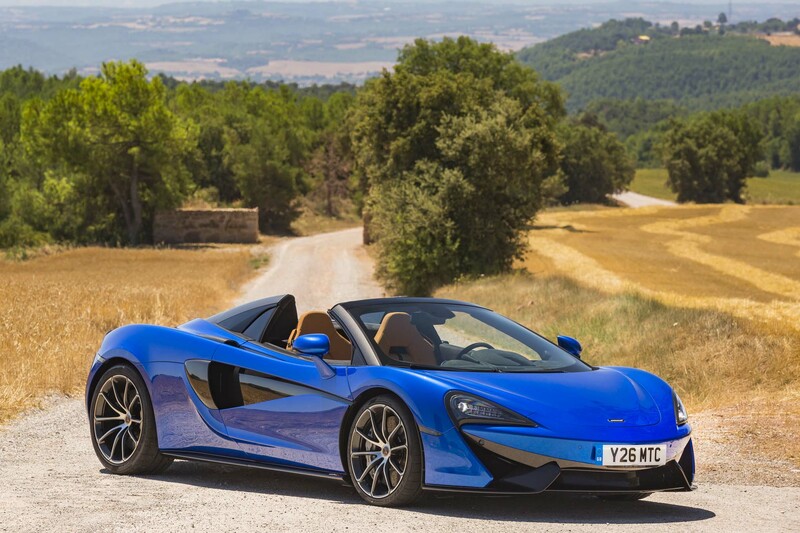 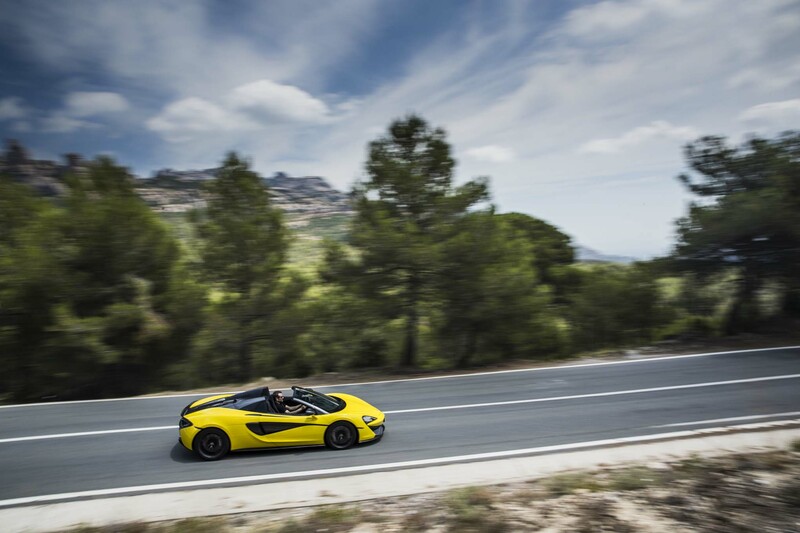 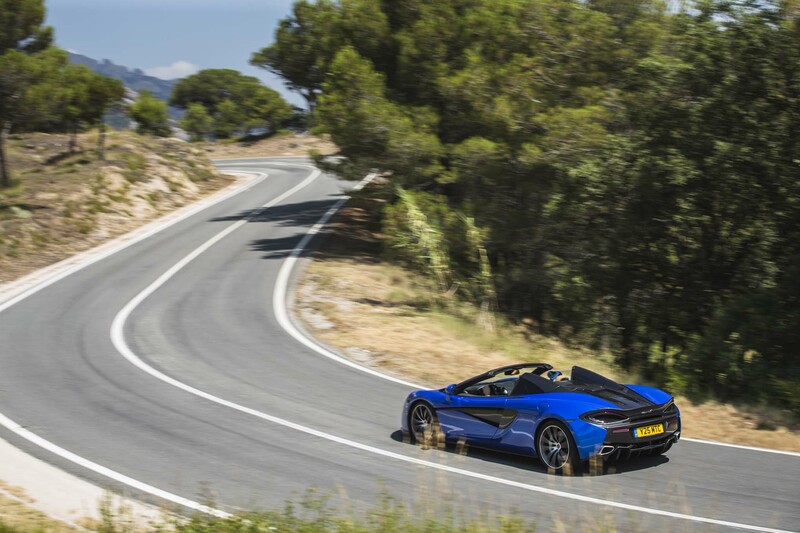 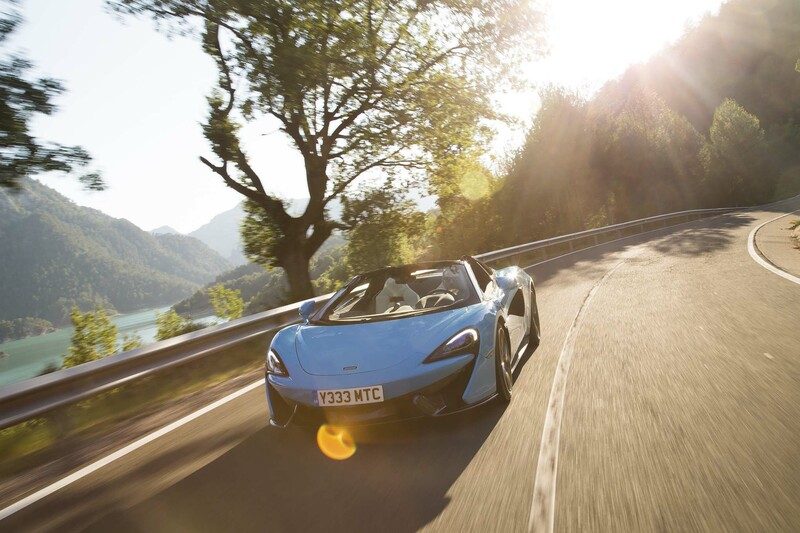 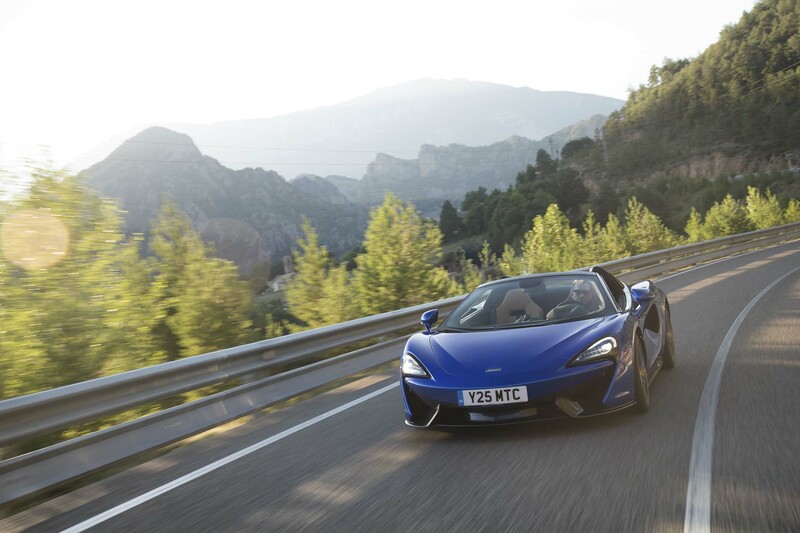 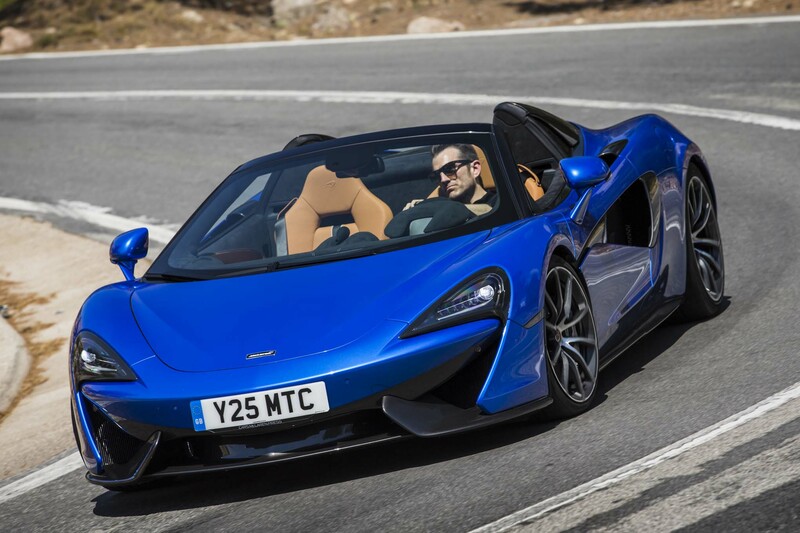 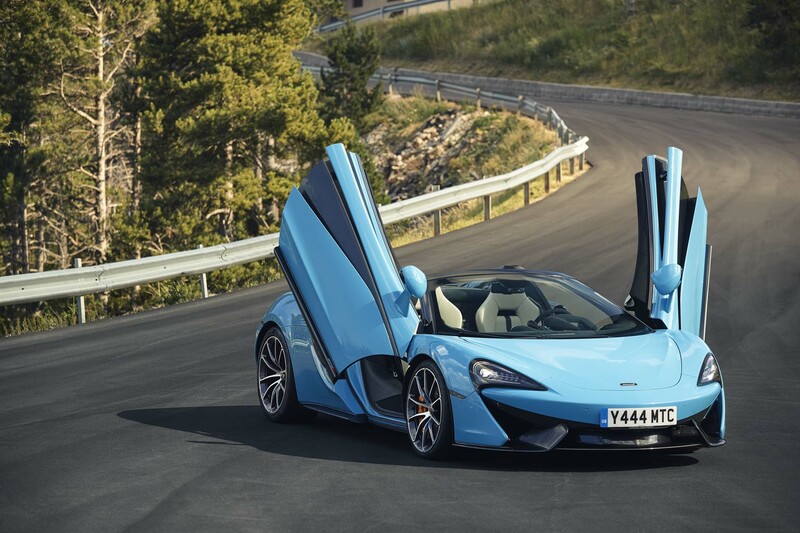 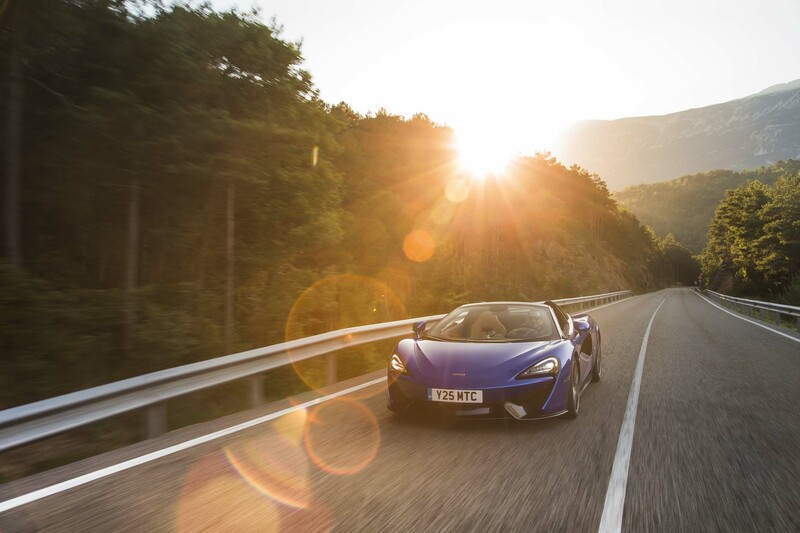 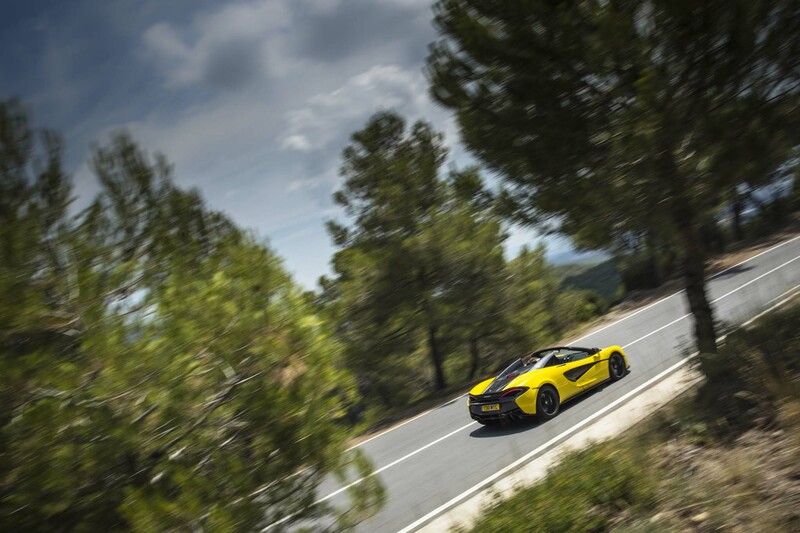 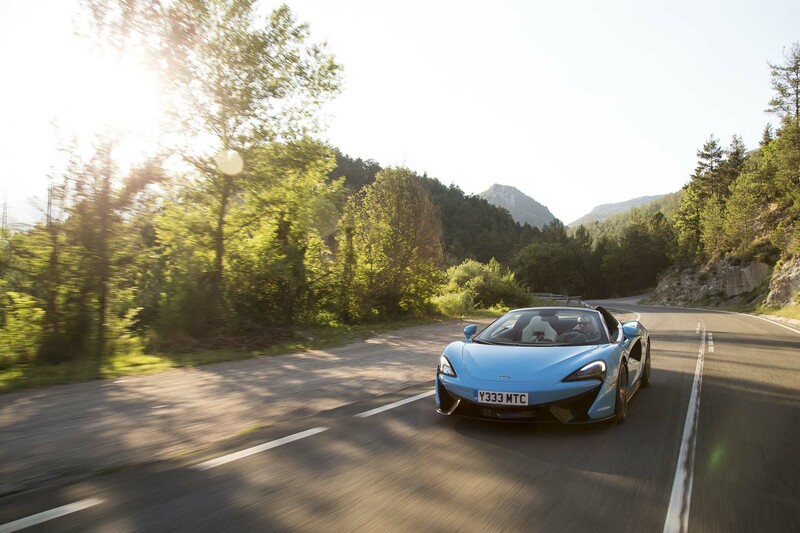 So surely, then, the new McLaren 570S Spider on sun-baked roads that sweep and roll over Montserrat near Barcelona is pretty much a foregone conclusion? 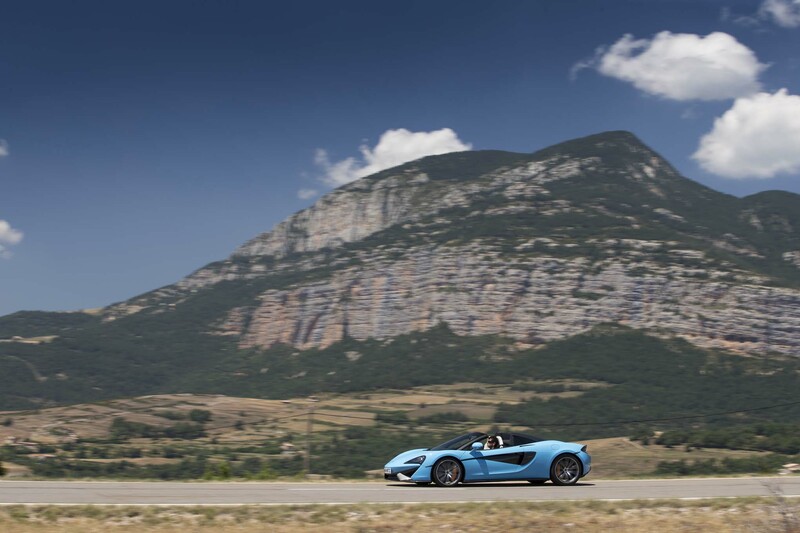 It’s going to be epic, right? 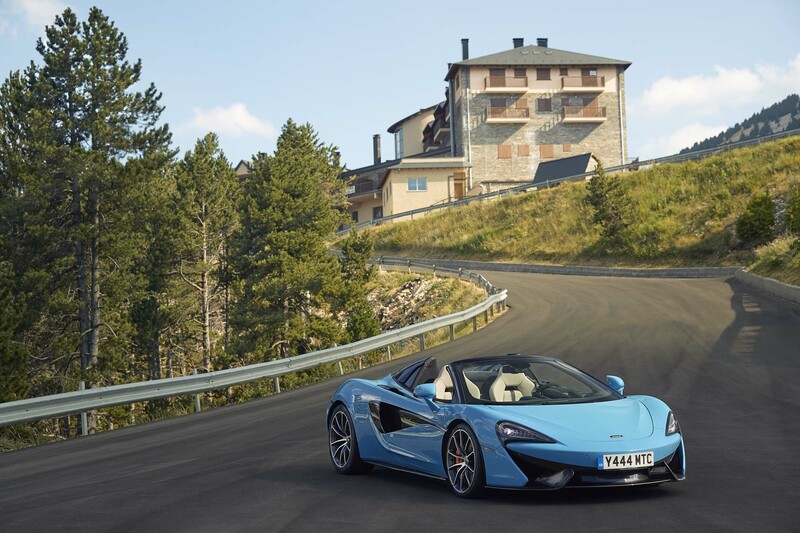 Nevertheless, I felt it was my duty as a journalist to be absolutely sure, and duly accepted the editor’s invitation to see if a 570S with its roof removed could possibly be as good in practice as it sounds in theory. 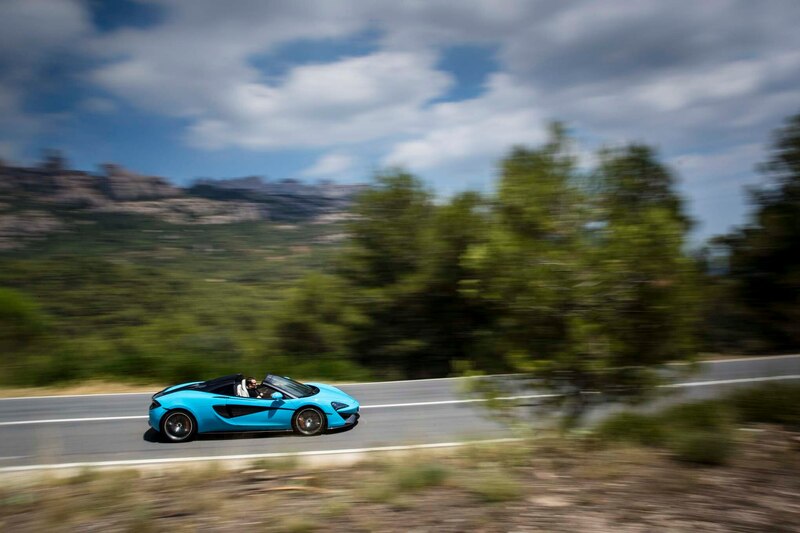 There would be no track element this time and the local Policia were, by all accounts, a little trigger happy with their radar equipment, but the 250-mile route over some incredible and varied roads should still reveal all there is to know about this enticing, almost mouth-watering proposition. 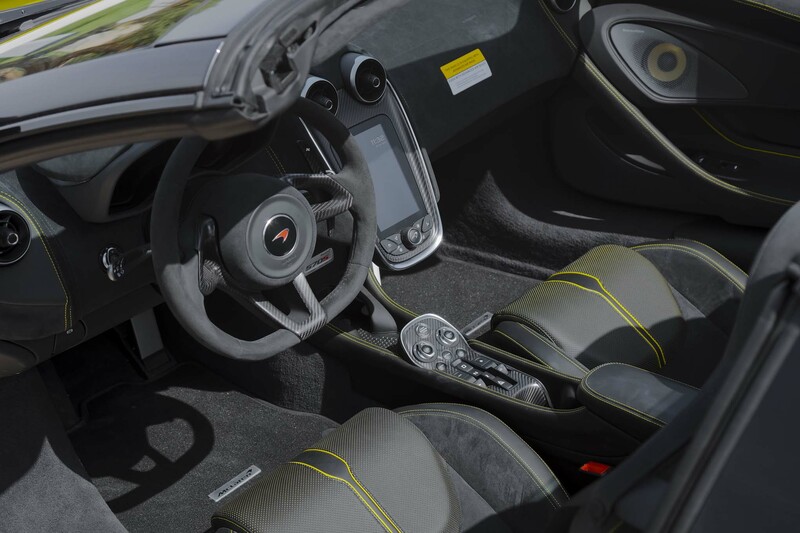 First, a bit of context. 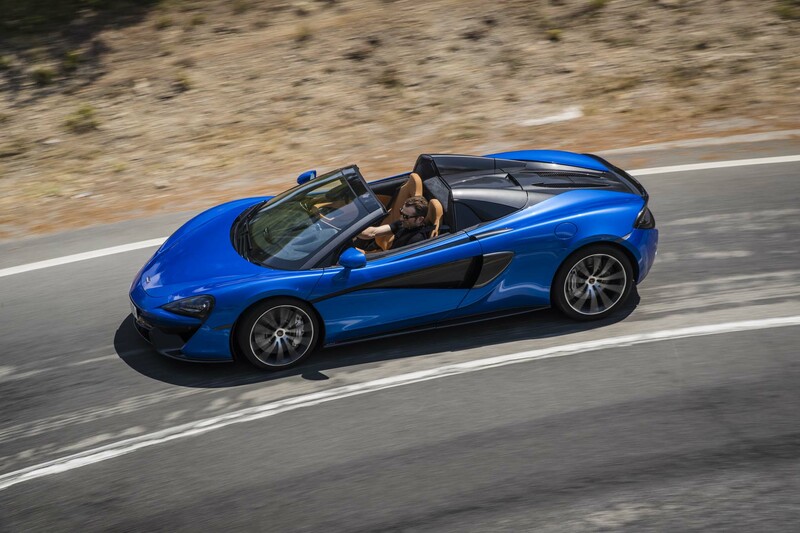 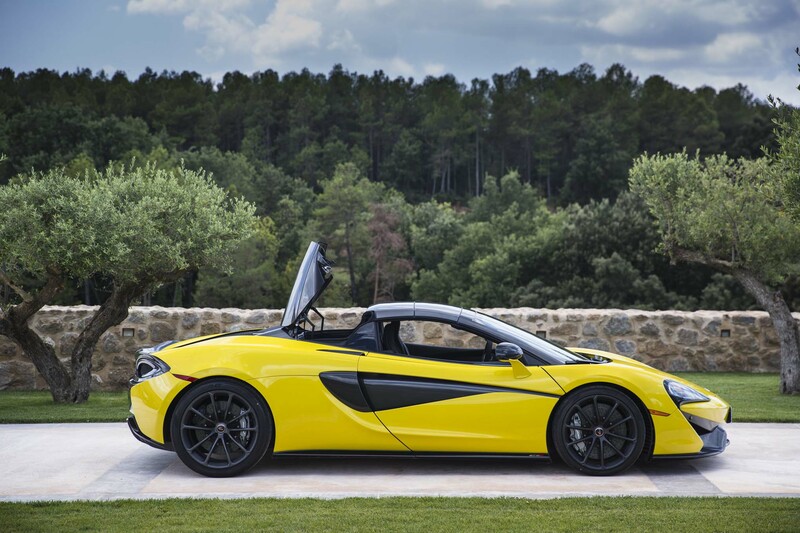 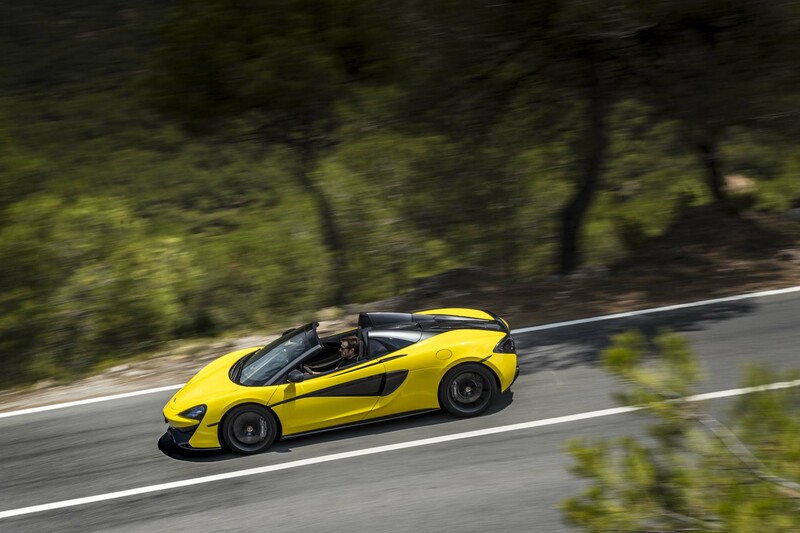 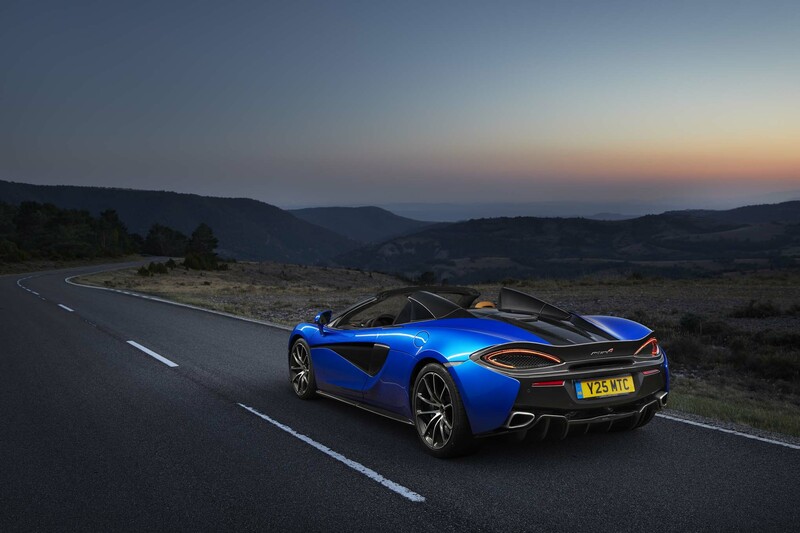 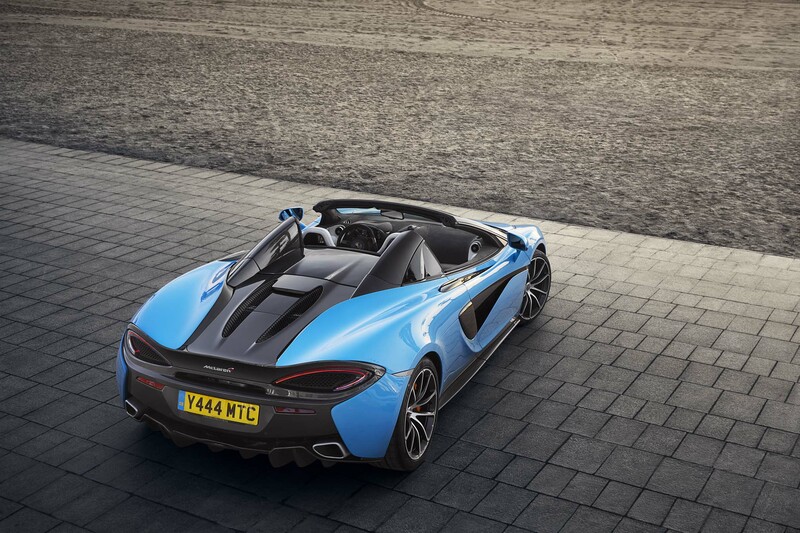 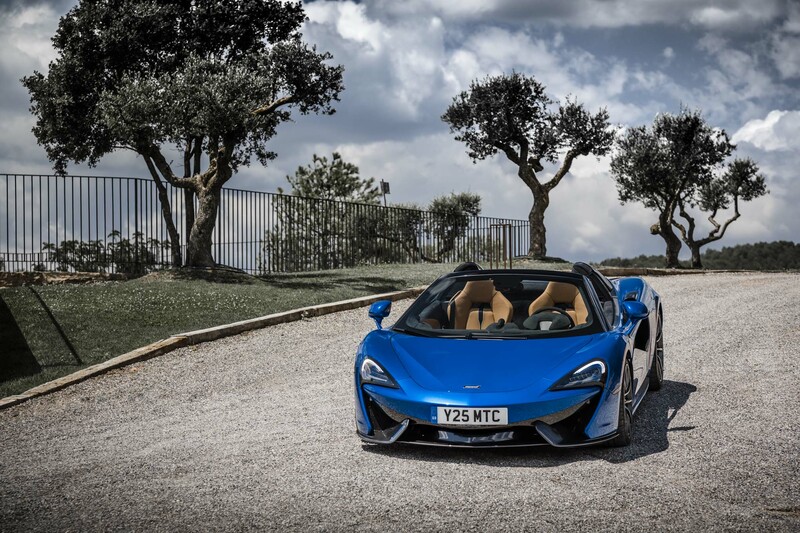 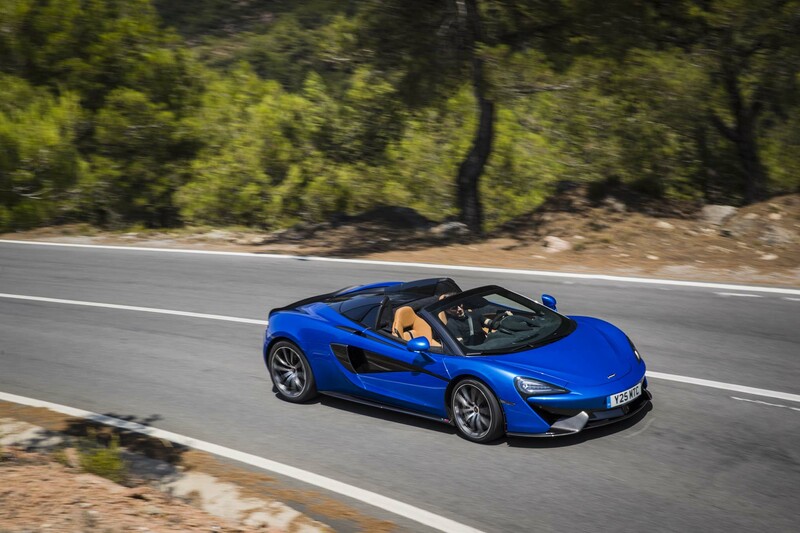 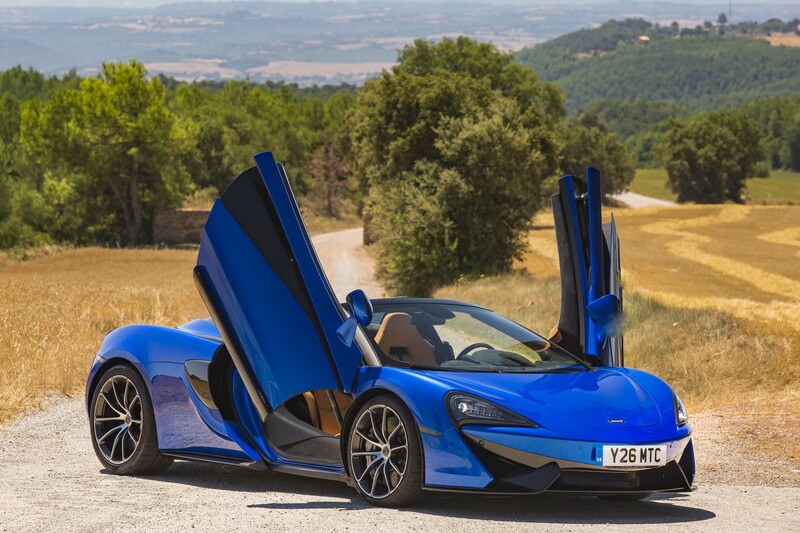 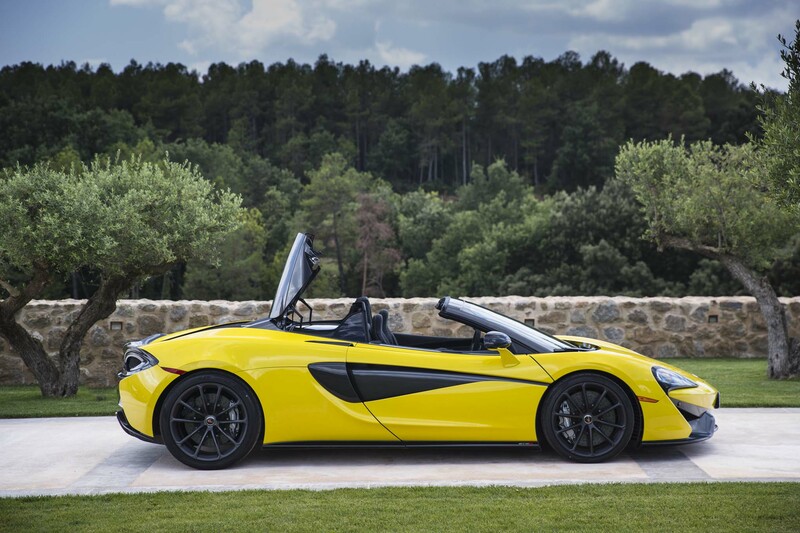 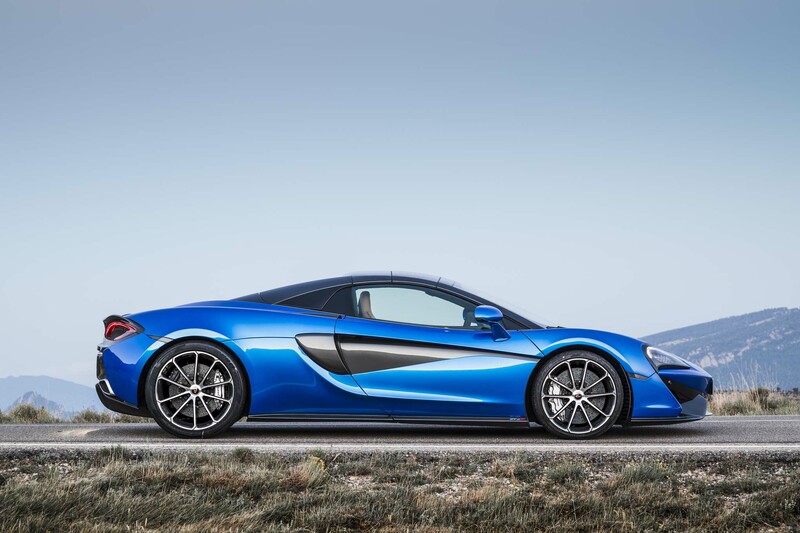 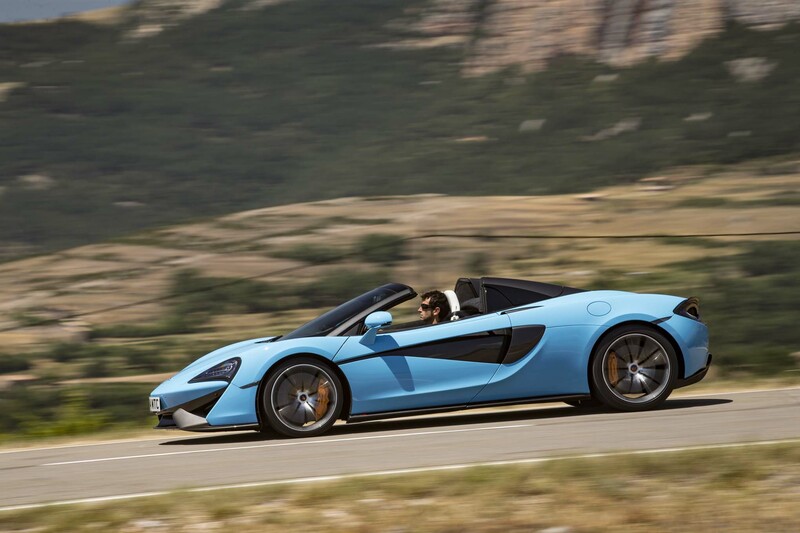 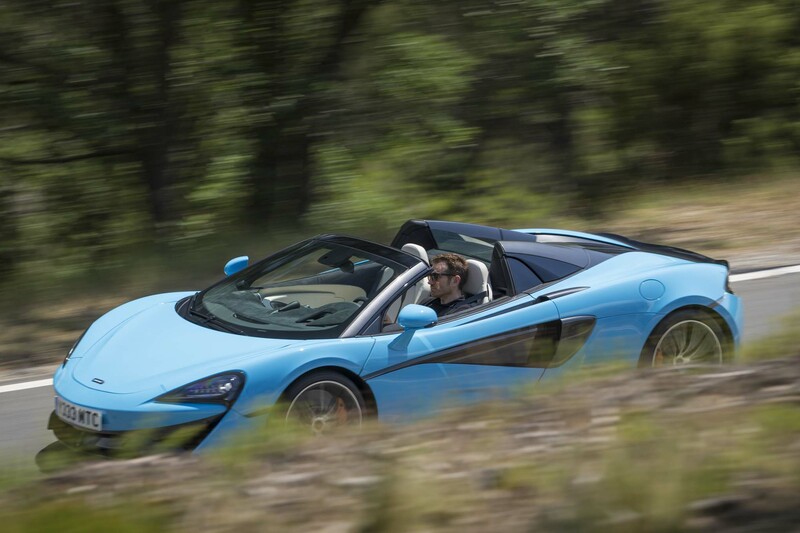 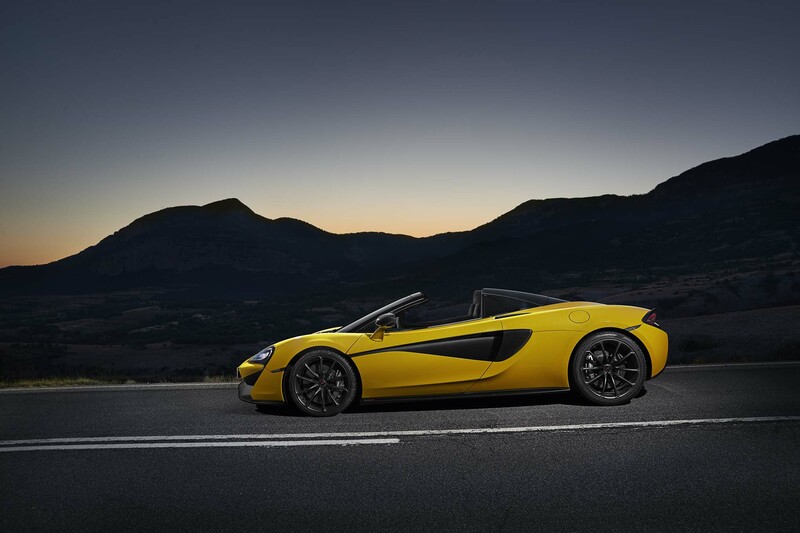 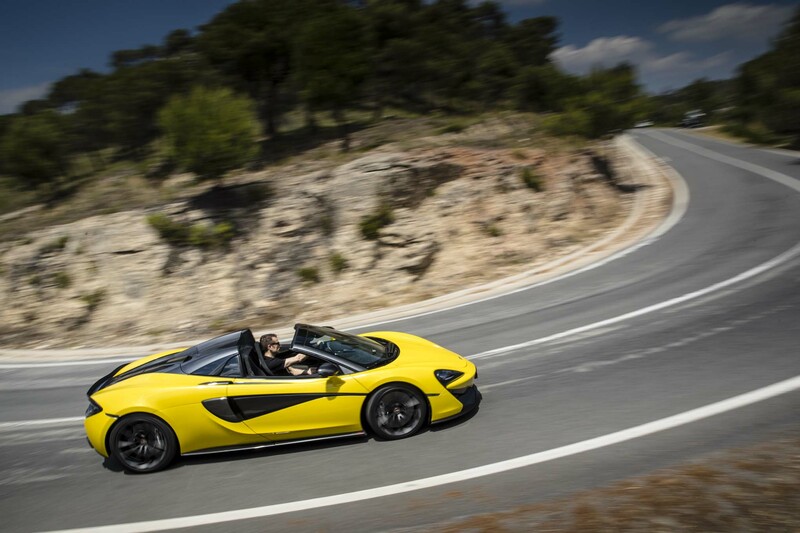 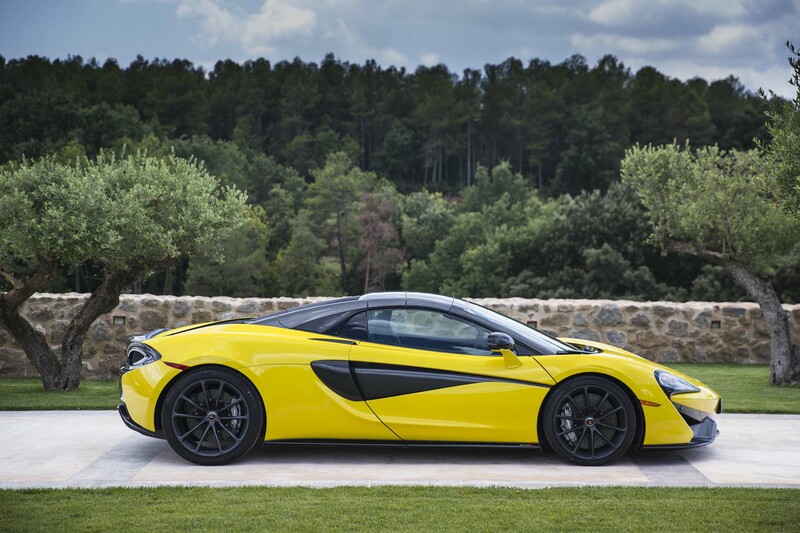 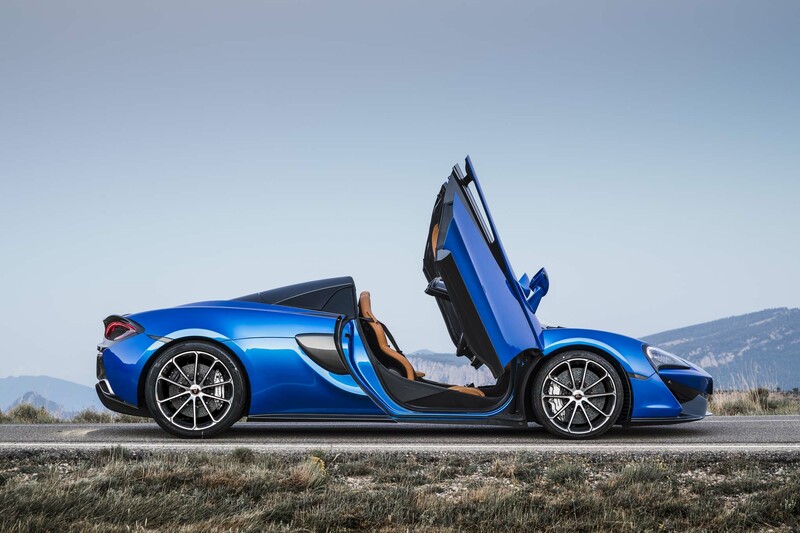 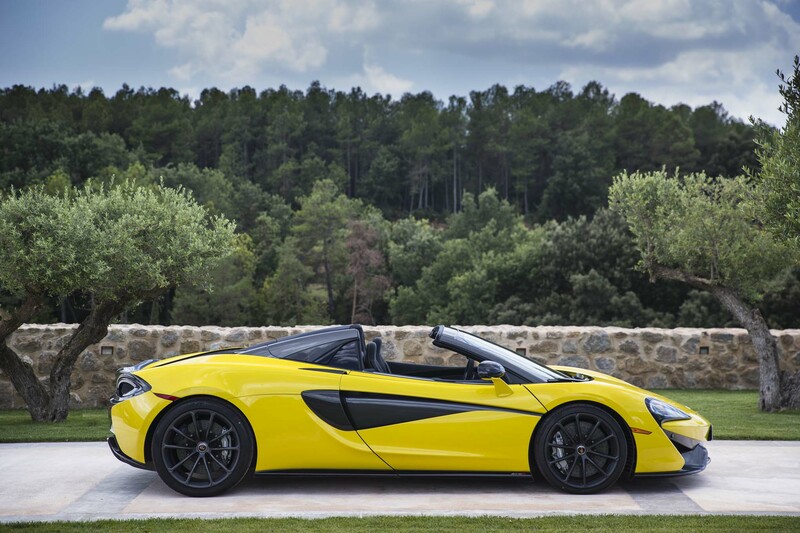 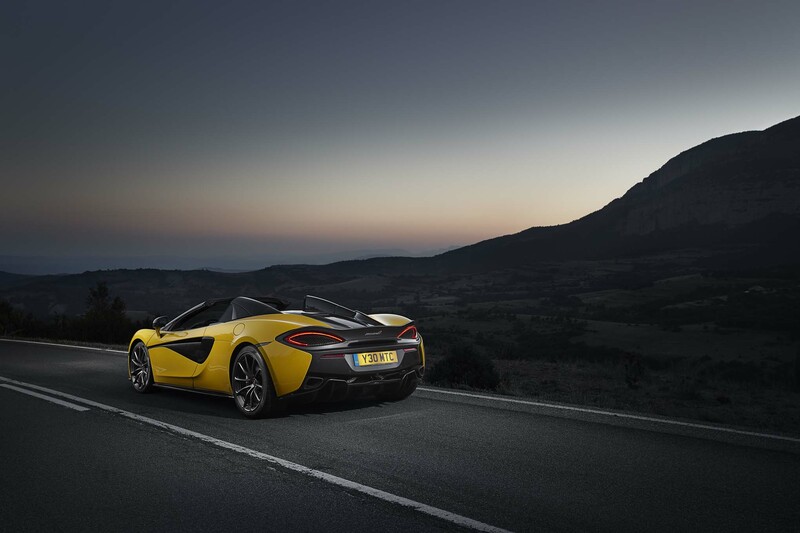 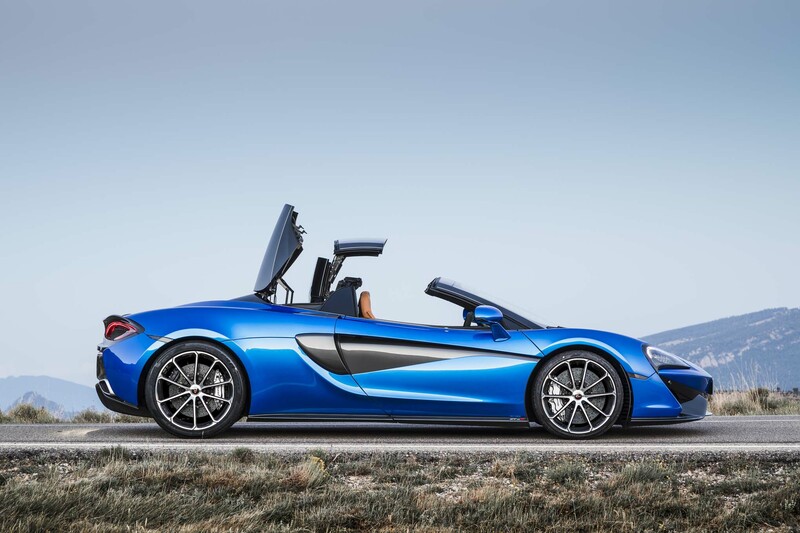 The Spider is set to become McLaren’s biggest volume seller. 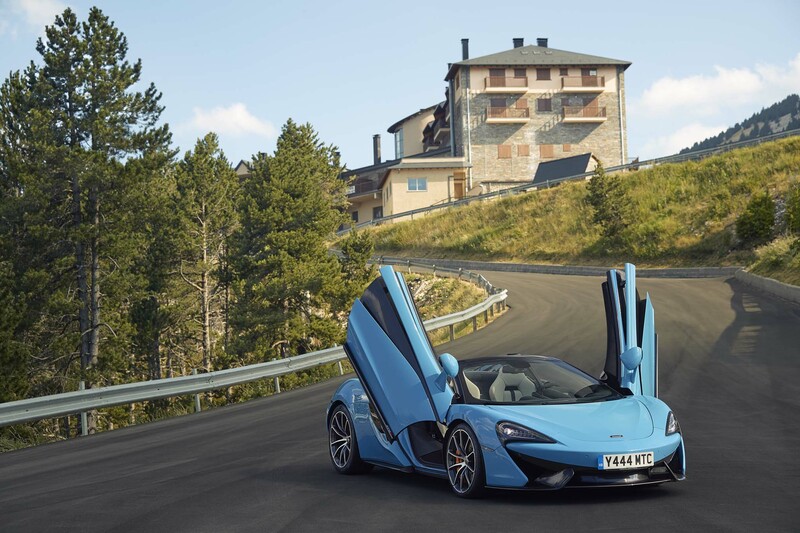 It joins the brand’s Sports Series range alongside the aforementioned 570S and the slightly softer and more capacious 570GT. 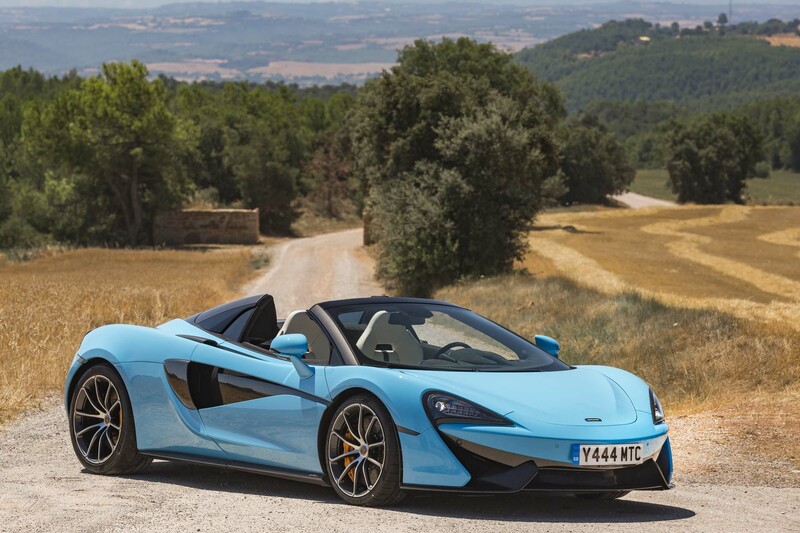 It’s also, like all McLarens, naturally predisposed to make for a hell of a convertible simply because of its carbon fiber chassis, dubbed MonoCell II. 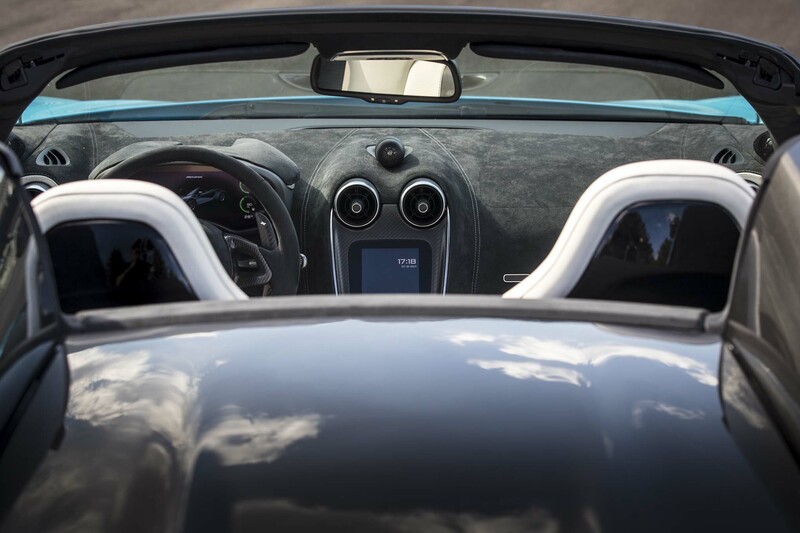 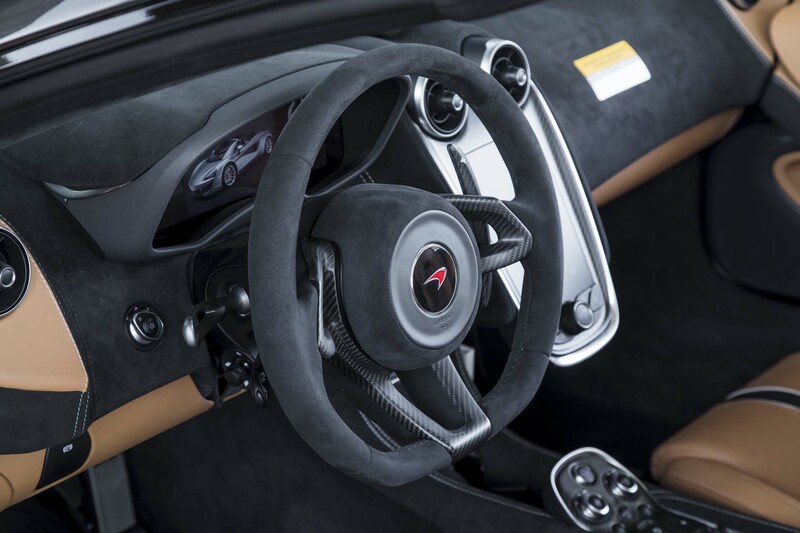 So stiff is this central structure that the Spider has zero additional chassis bracing and the steering, suspension, and electronics tune is almost exactly the same as the coupe’s. 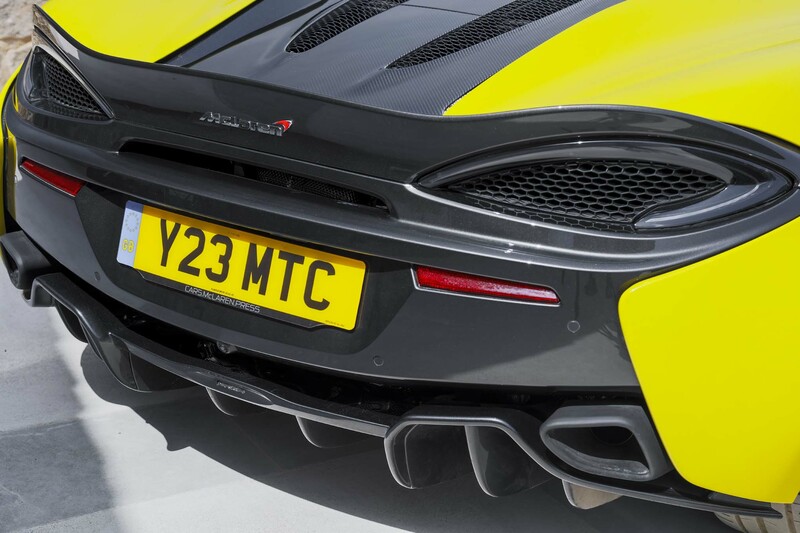 Changes are limited to “a couple of tweaks to the damper programming” according to Ben Gulliver, McLaren’s head of vehicle development. 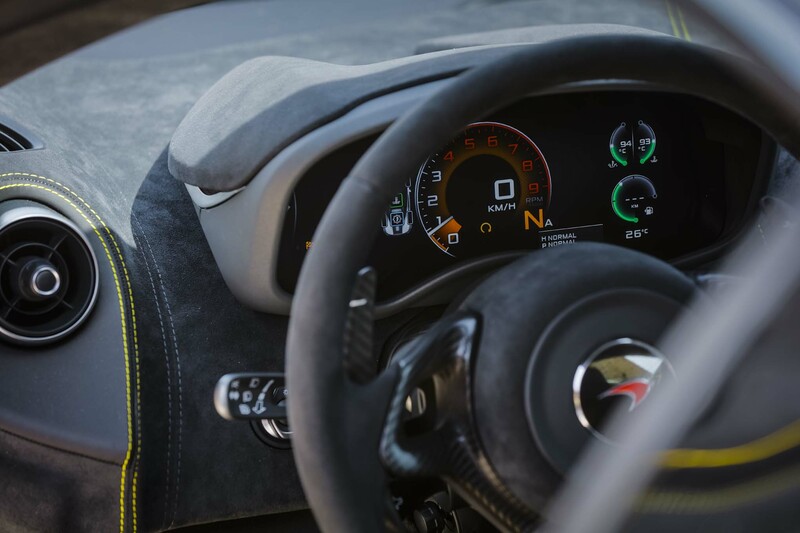 So the bald numbers go like this: $208,800 (a premium of $20,200 over the coupe), 3,302 lbs (up just 101 lbs) with fluids and 90-percent fuel load, 562 hp at 7,500 rpm and 443 lb-ft at 5,000-6,500 rpm, 0 to 60 mph in 3.1-seconds, and a top speed of 204 mph with the roof up or 196 mph with the retractable hard-top stowed away. 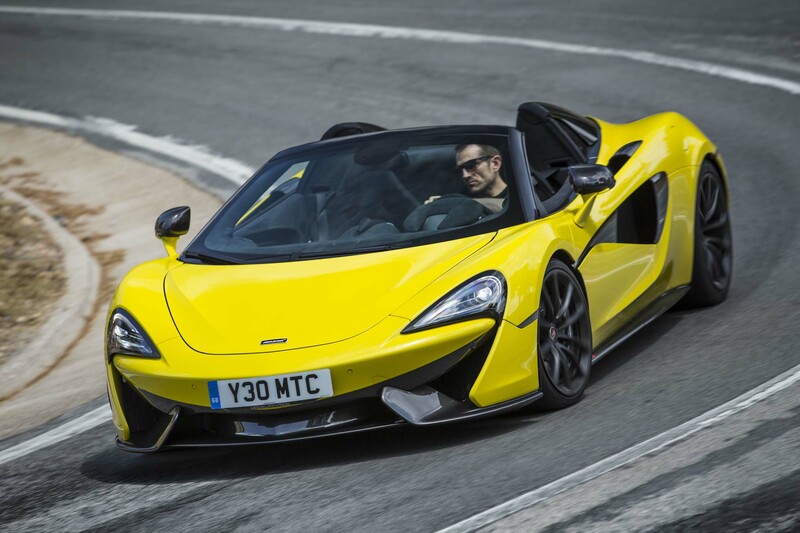 In case you’re wondering, that 60 mph time is identical to the coupe and the Spider is only one-tenth slower over the 0-124 mph (200 kph) European yardstick at 9.6 seconds. 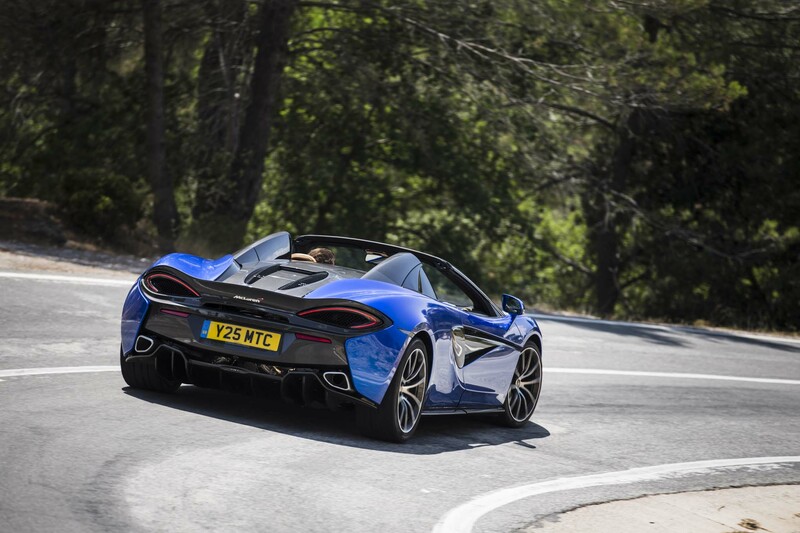 In performance terms then, it gives away almost nothing to the coupe and dynamically it should be virtually identical, too. 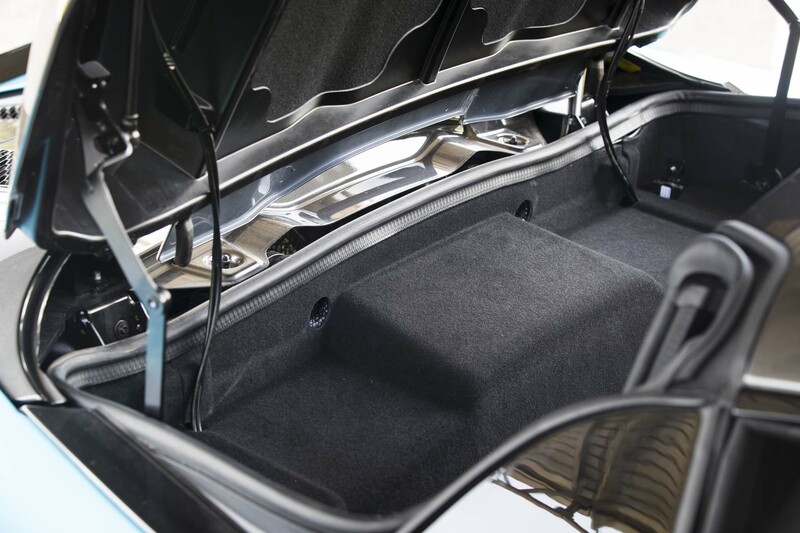 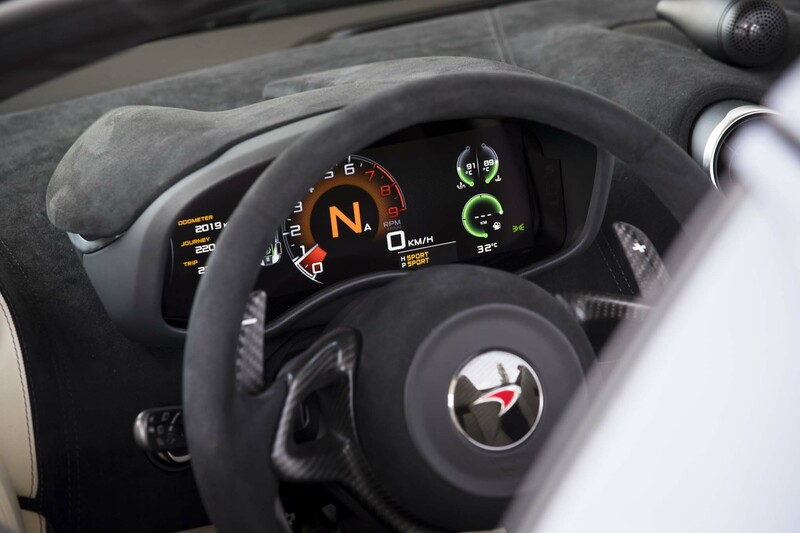 Perhaps the bigger question is whether the 3.8-liter twin-turbocharged V-8 will feel more characterful without a carbon-fiber barrier between driver and induction and exhaust. 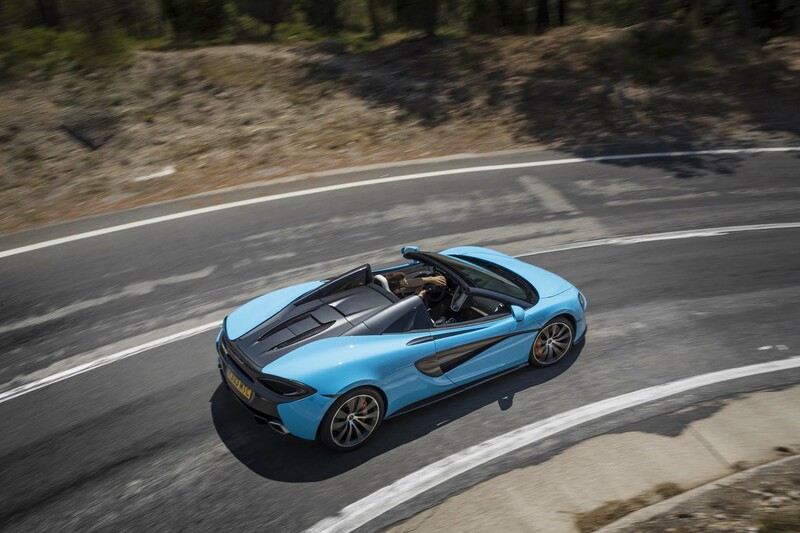 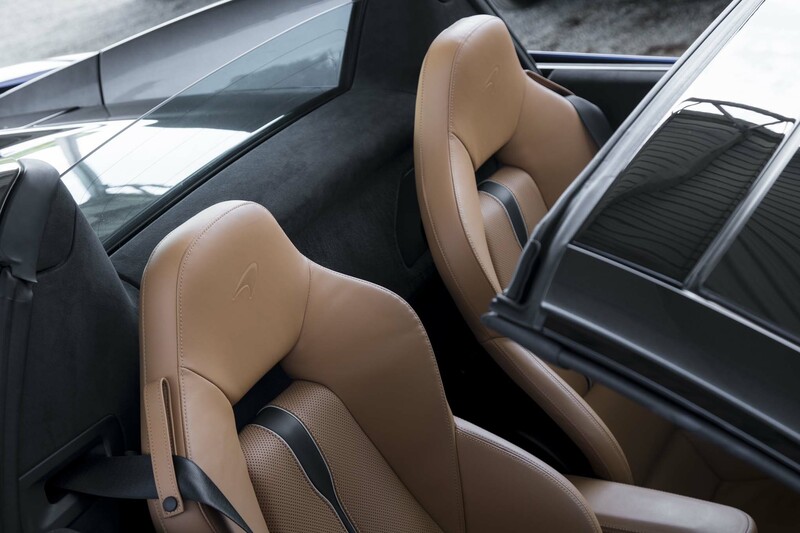 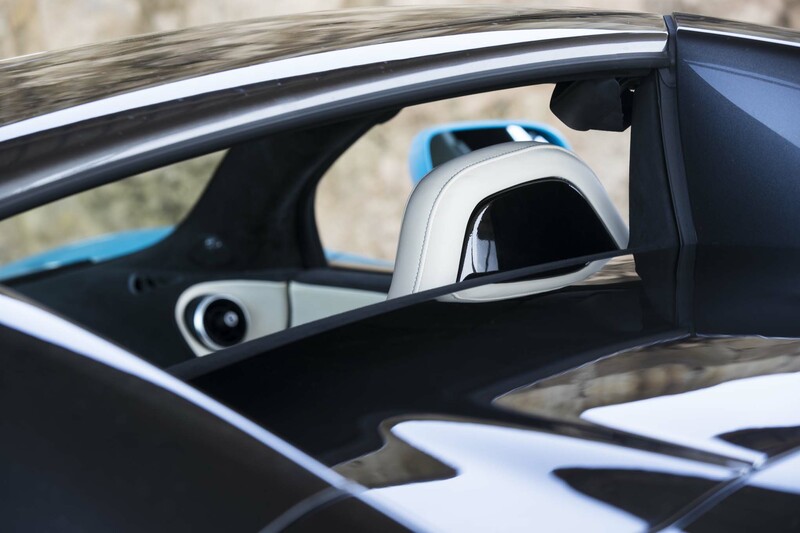 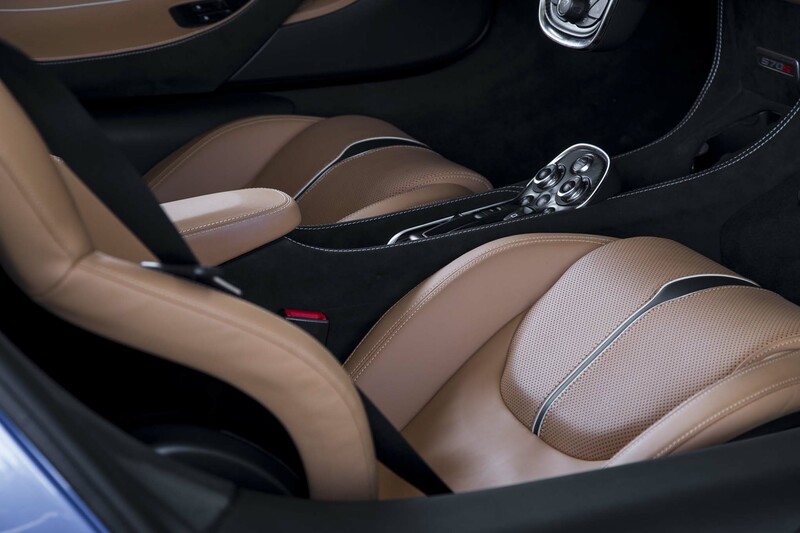 For the slow crawl through Barcelona, the two-piece roof remains in place and I remind myself what I like about the 570S already: The simple, elegant cabin architecture is as appealing now as it was back in late 2015, but the quality has taken a huge leap forward. 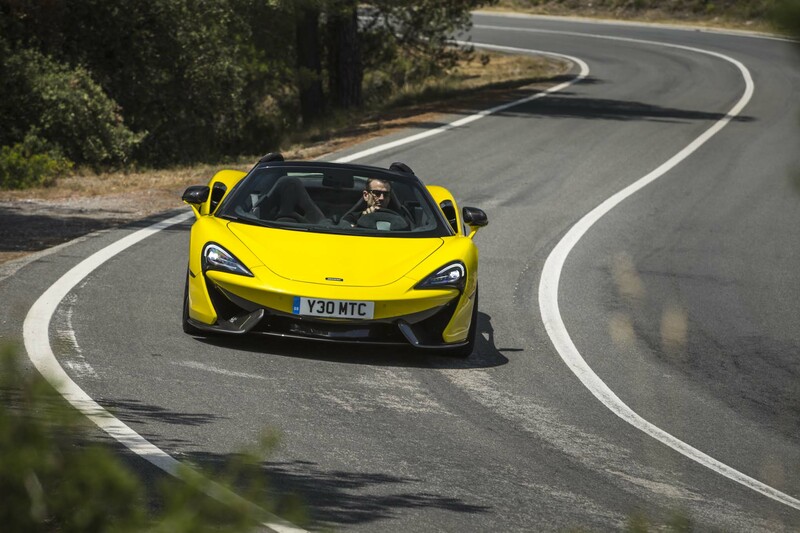 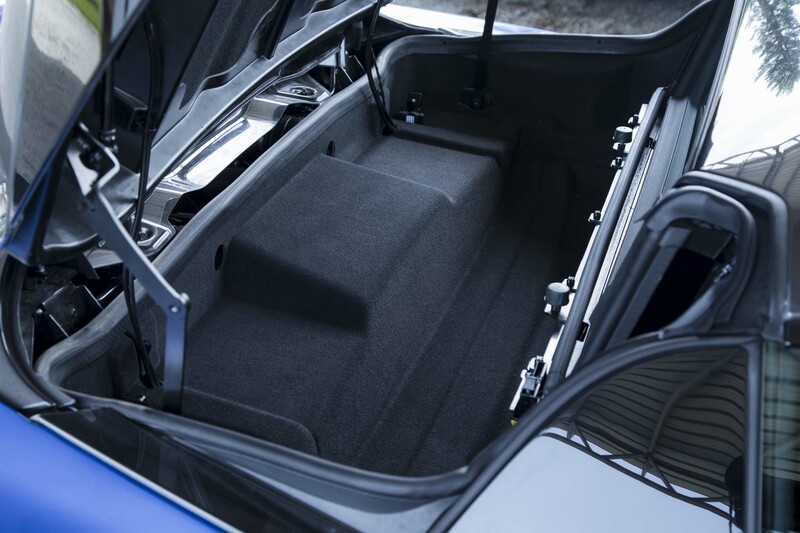 The ride, despite the “cheaper” solution of conventional springs, dampers, and anti-roll bars for the Sport Series cars as opposed to the hydraulically-linked ProActive chassis control of the 720S, is also beautifully resolved. 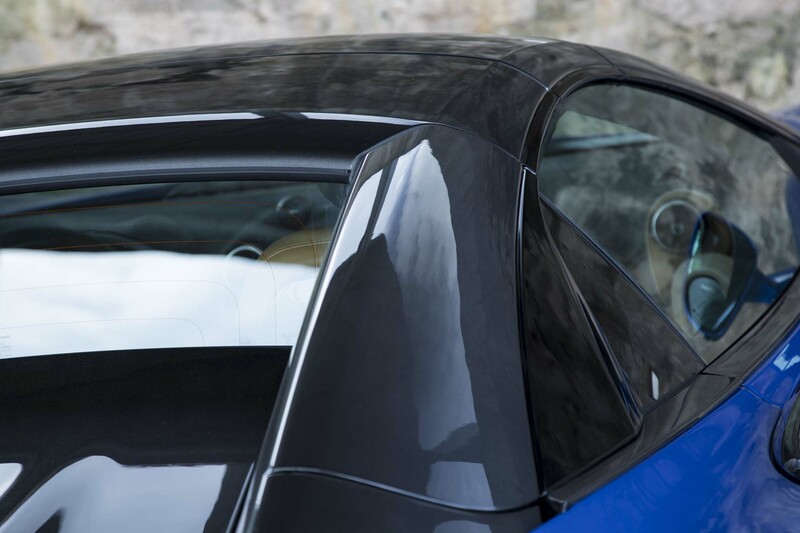 It will patter over really broken surfaces but it rarely jars and has a lovely polish to the way it rounds off the worst bumps and lumps. 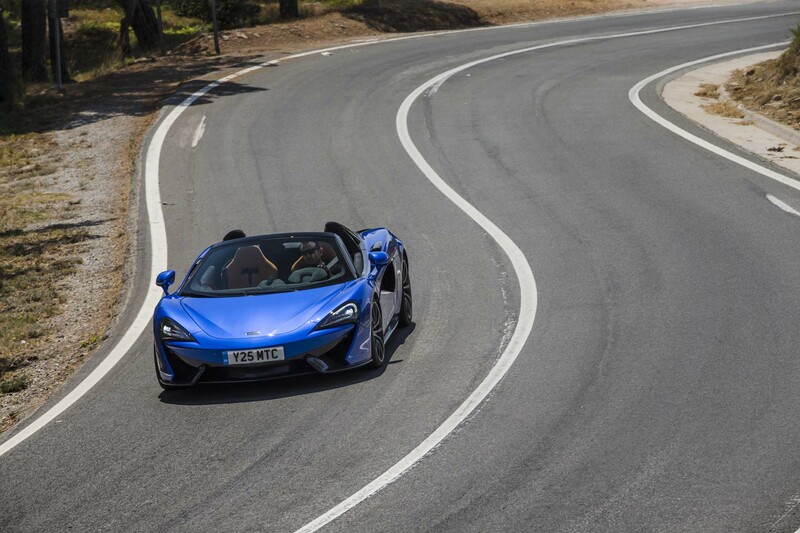 The suspension settings between Normal and Sport modes are pretty close and on the smoother roads we’ll find later, even Track mode is perfectly usable. 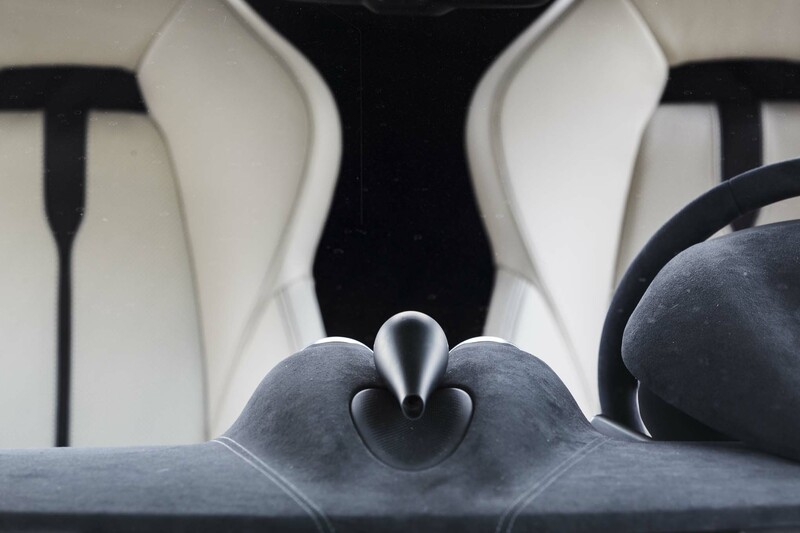 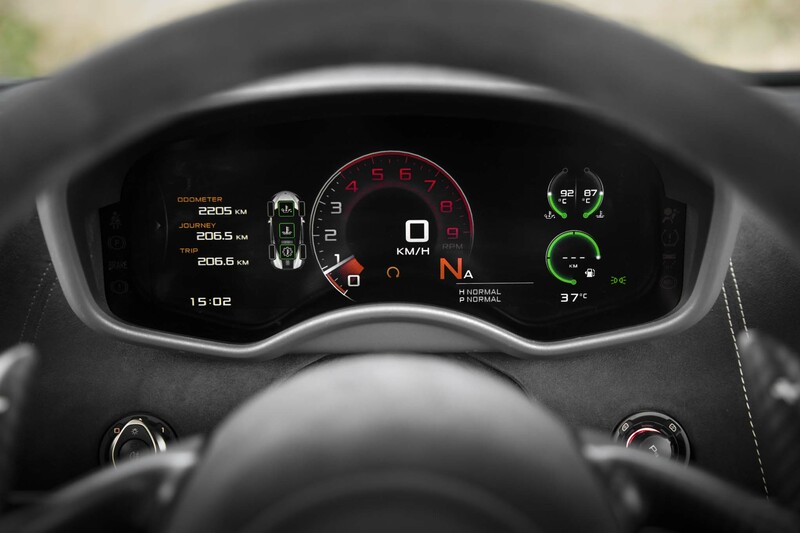 Whichever setting you choose though, you feel connected to the surface but it’s not dictating the car’s behavior. 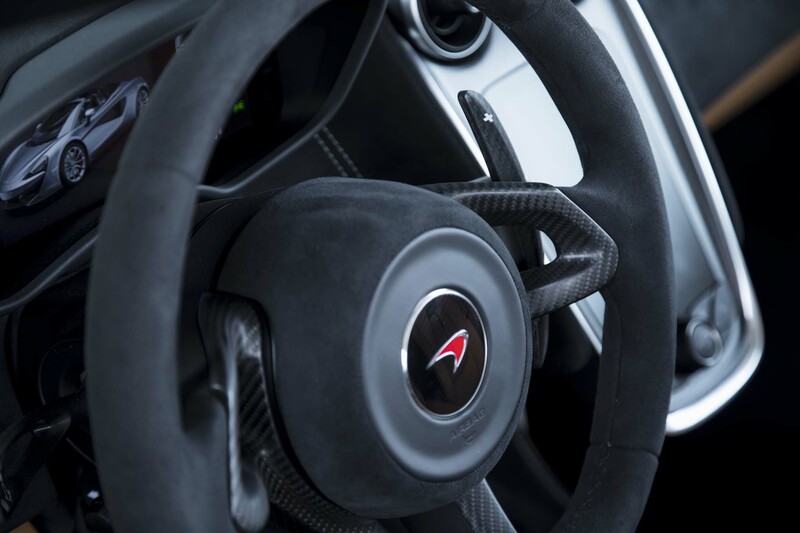 Another highlight felt even at little more than walking pace is the steering. 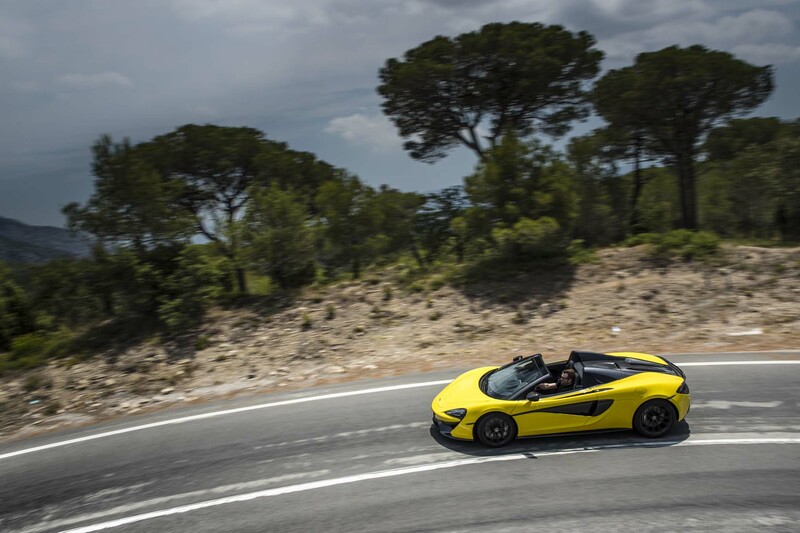 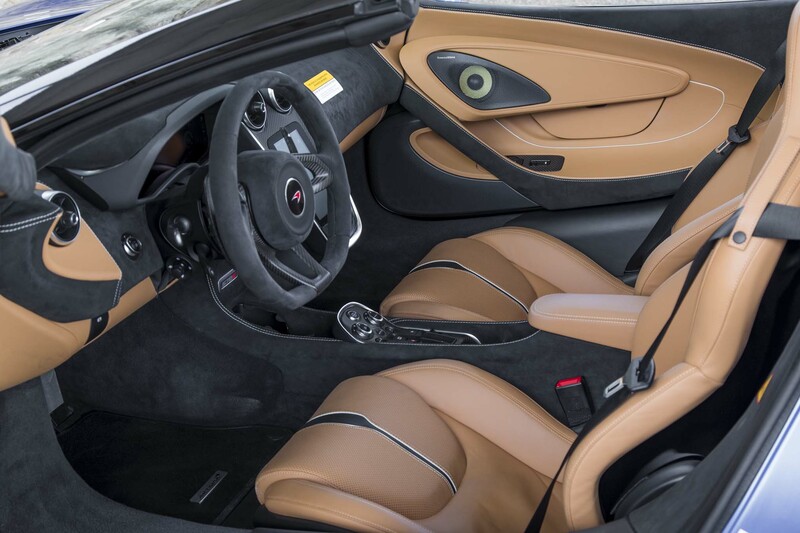 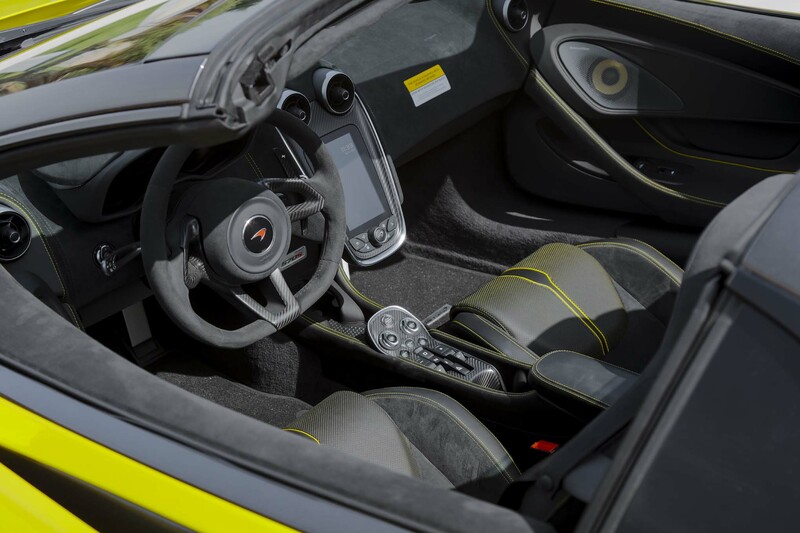 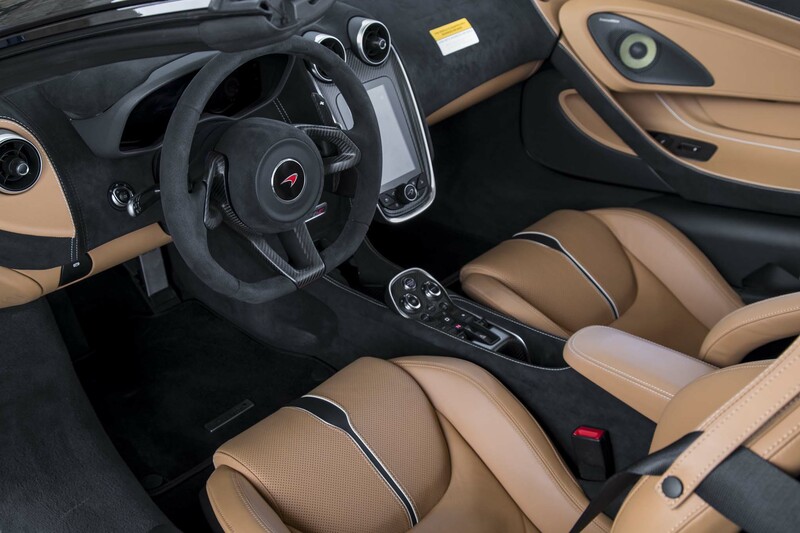 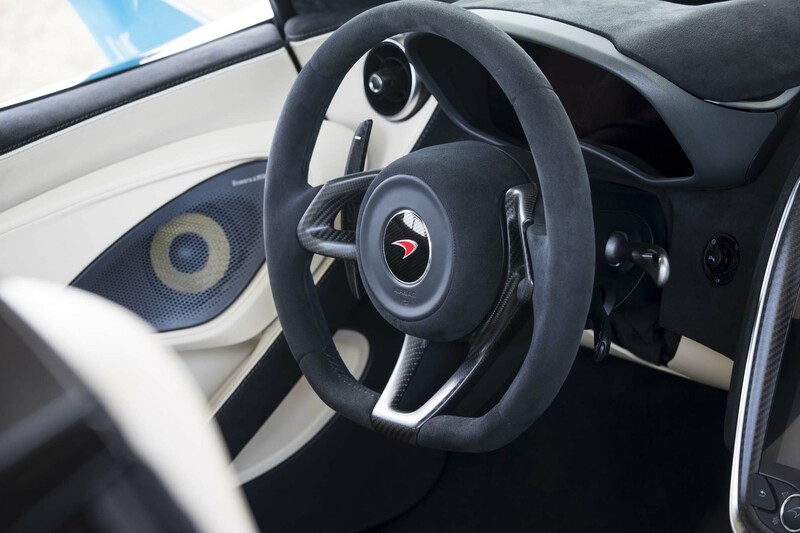 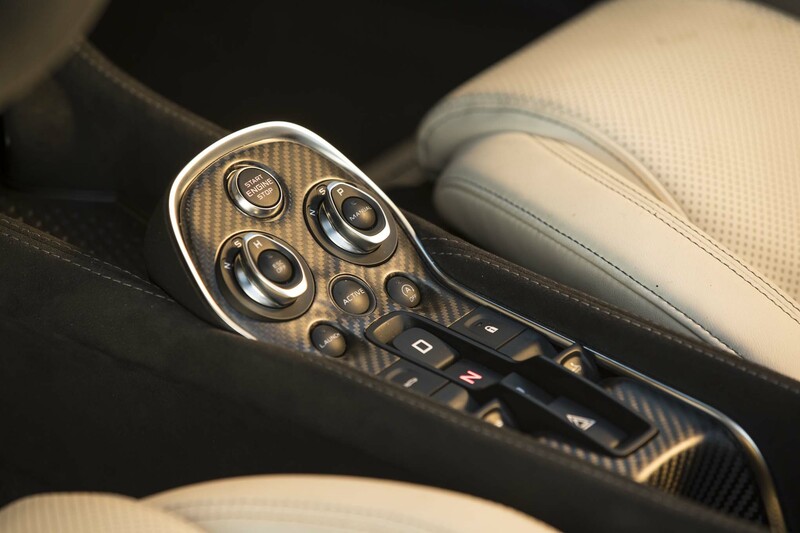 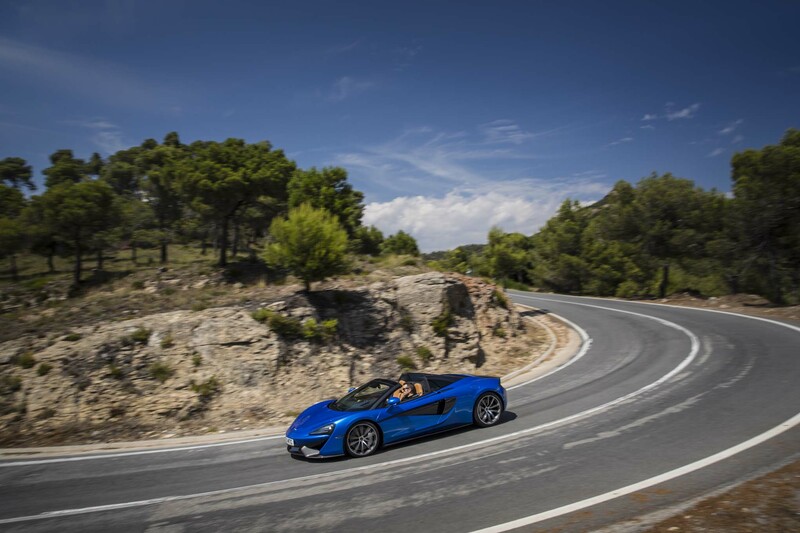 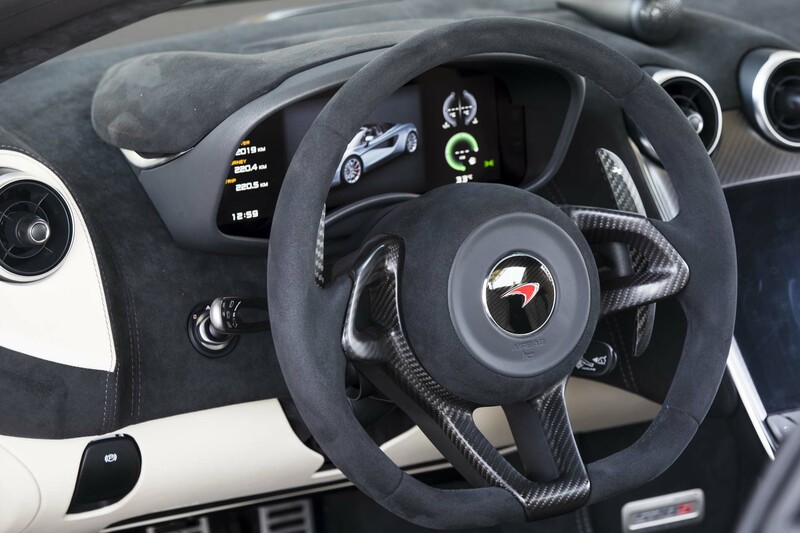 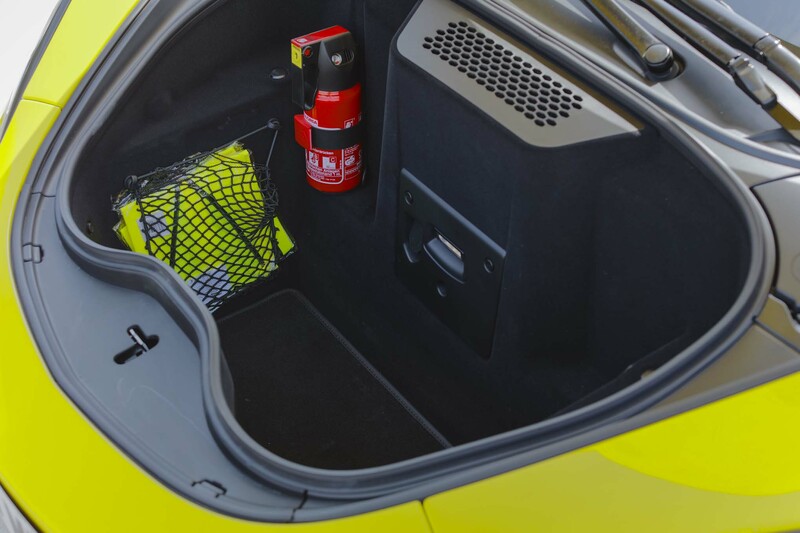 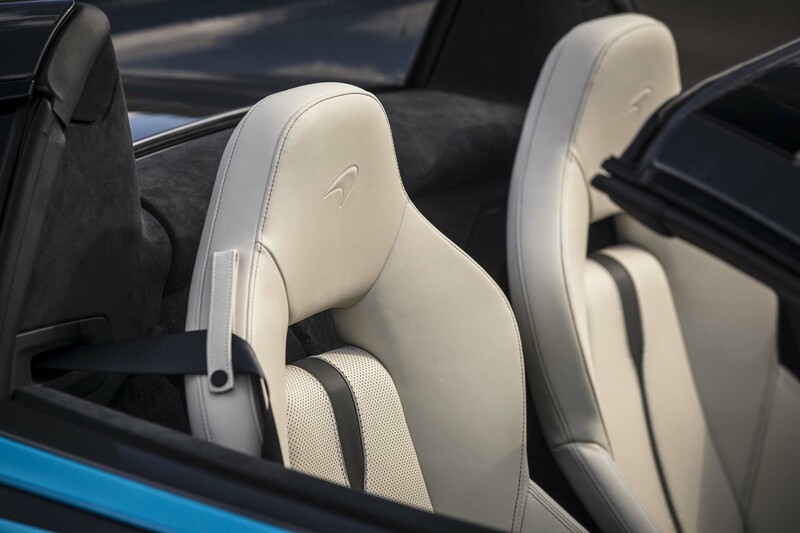 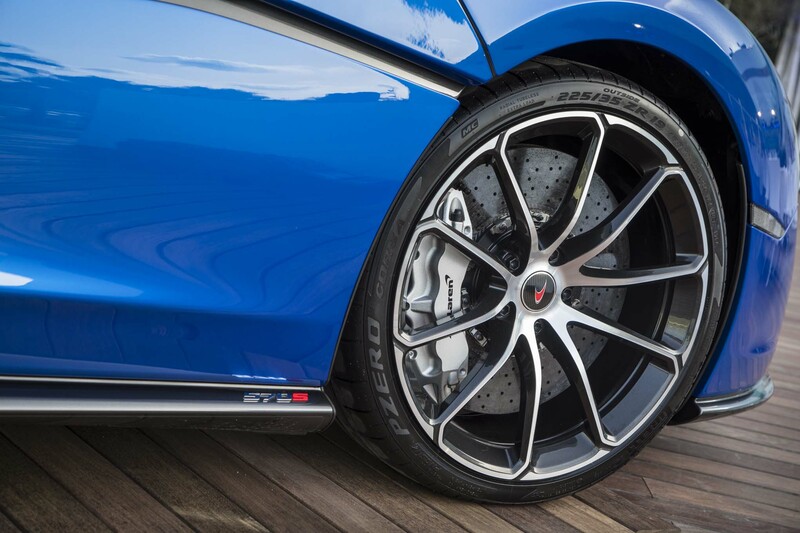 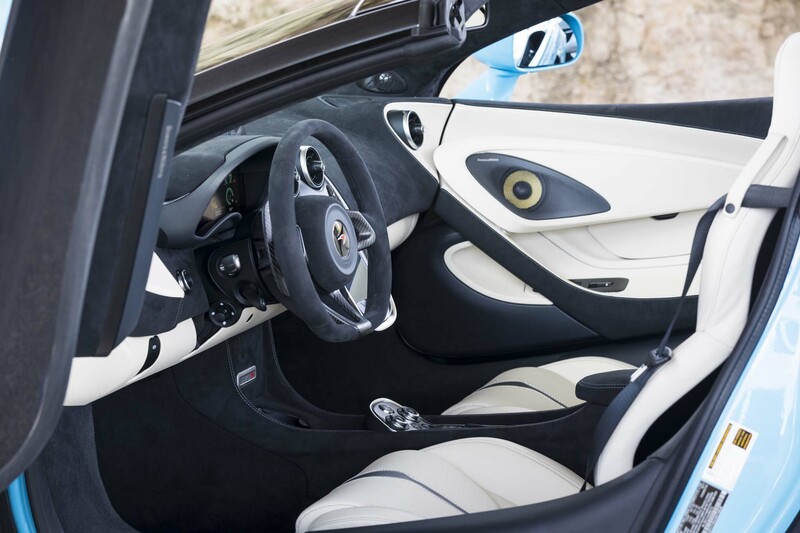 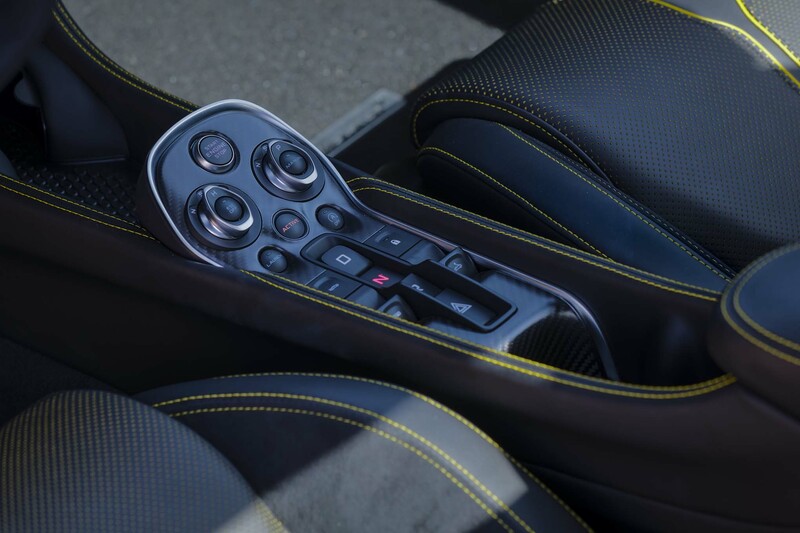 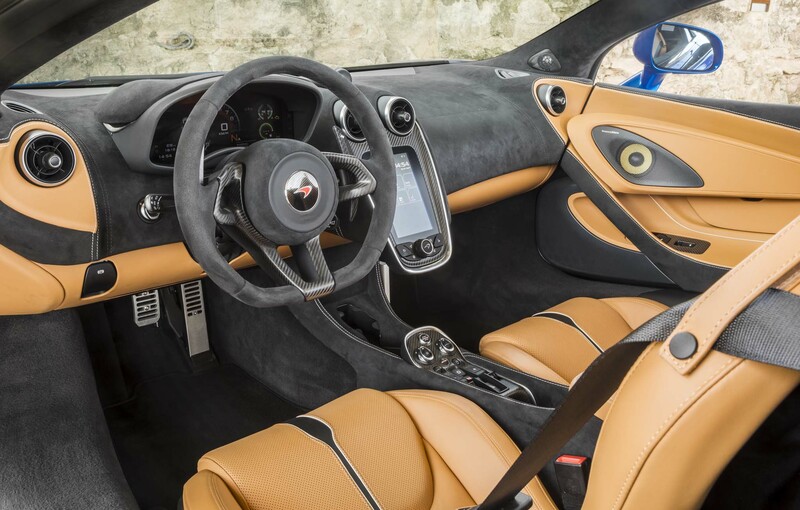 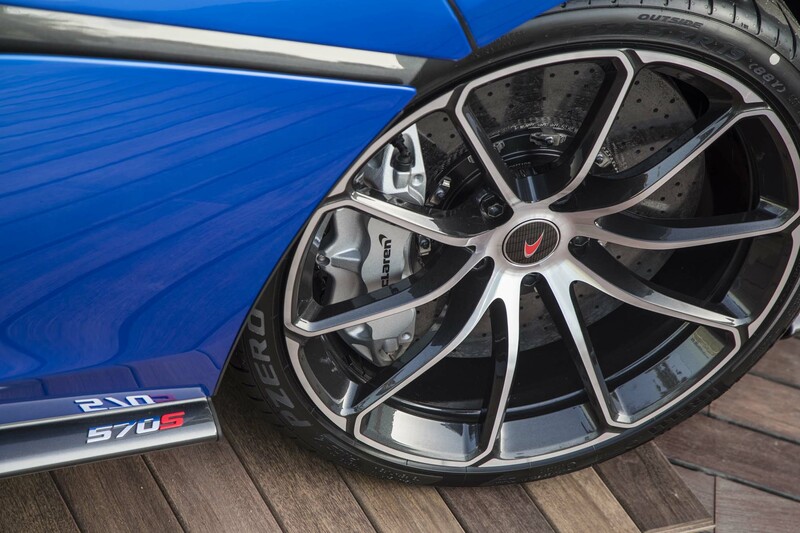 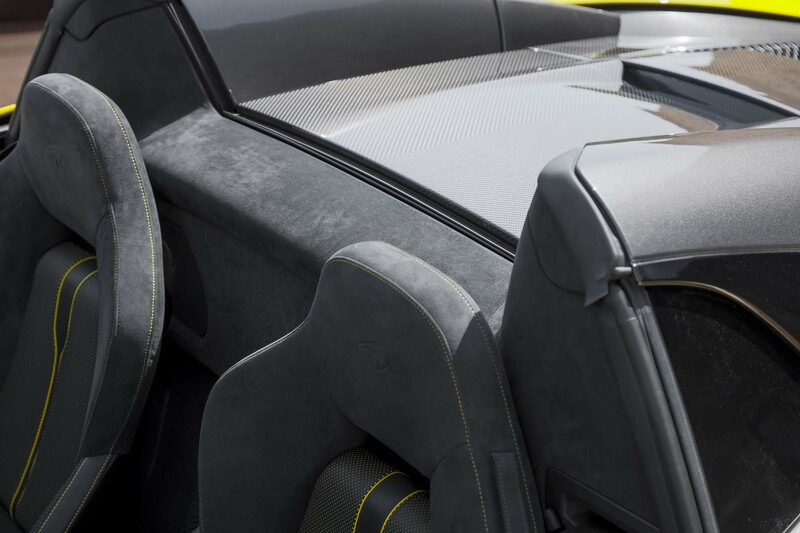 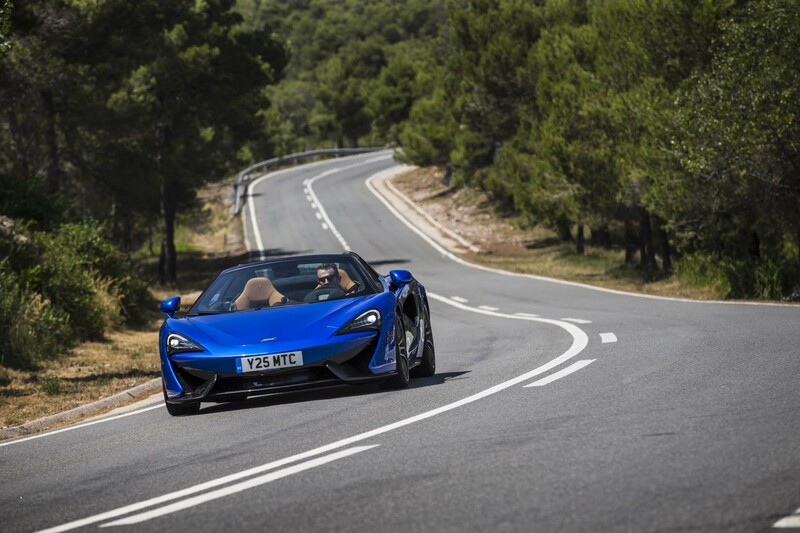 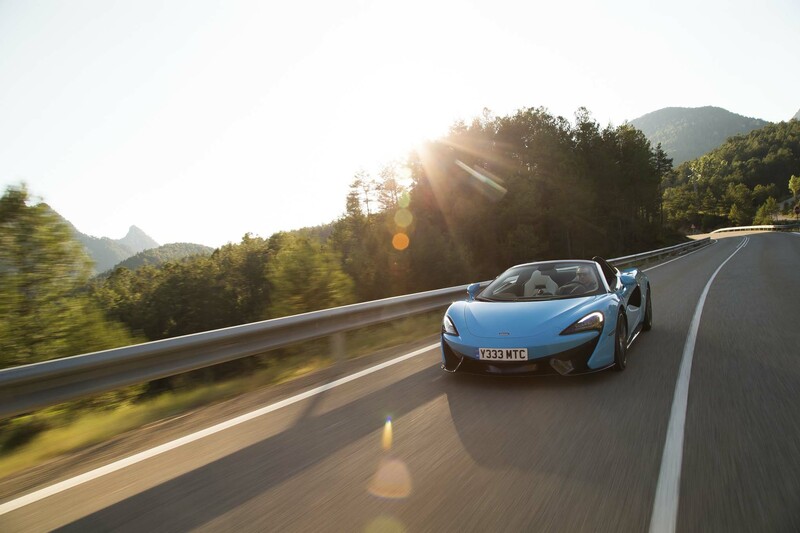 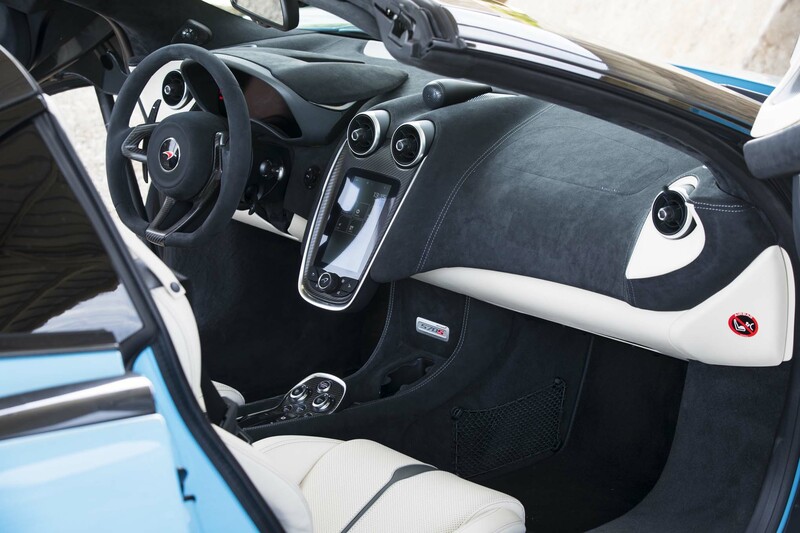 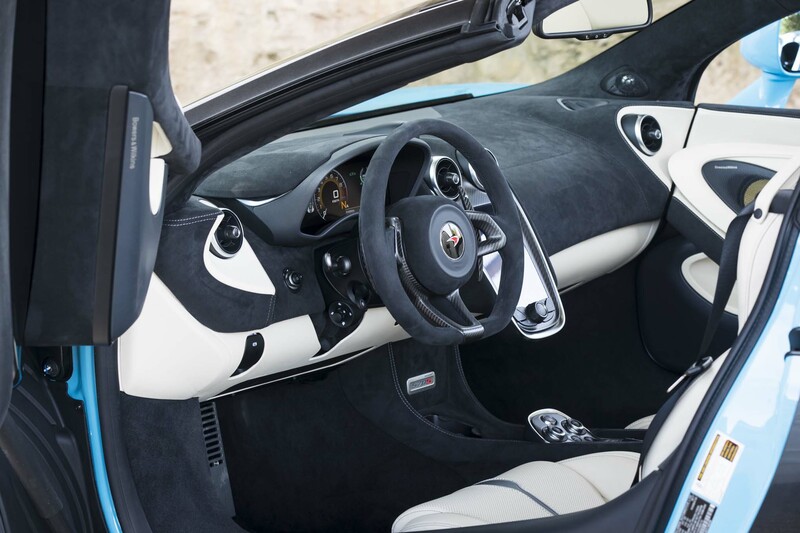 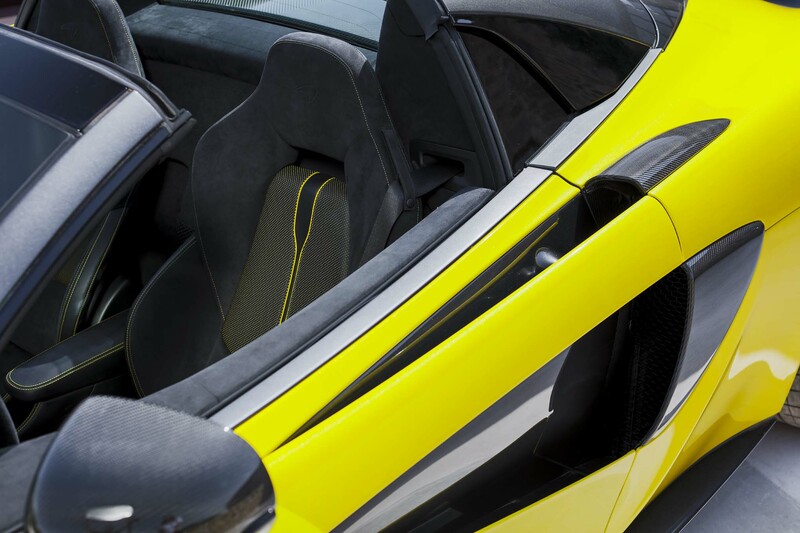 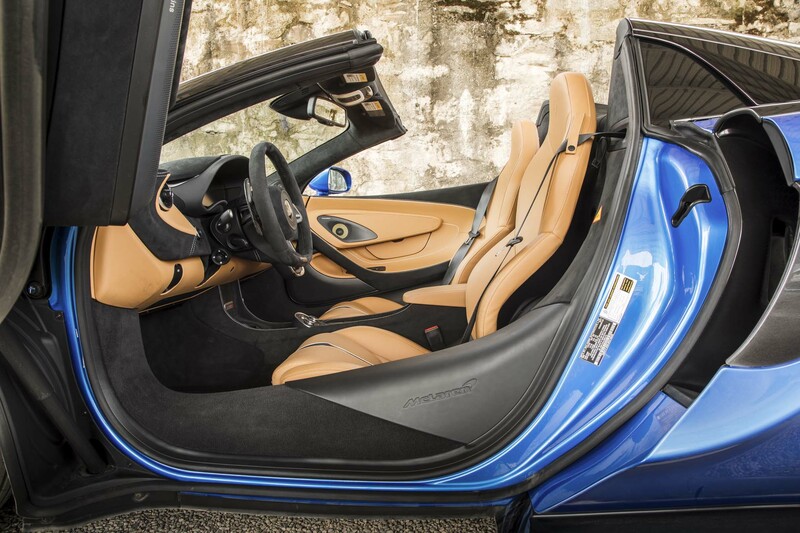 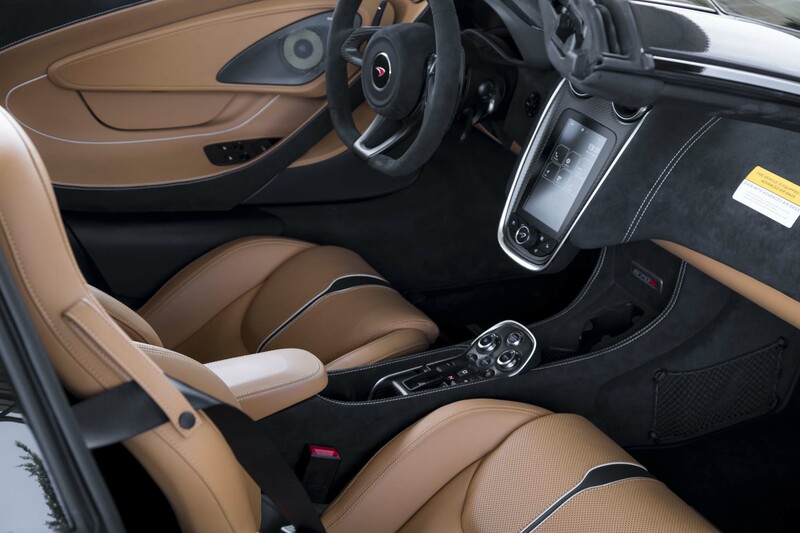 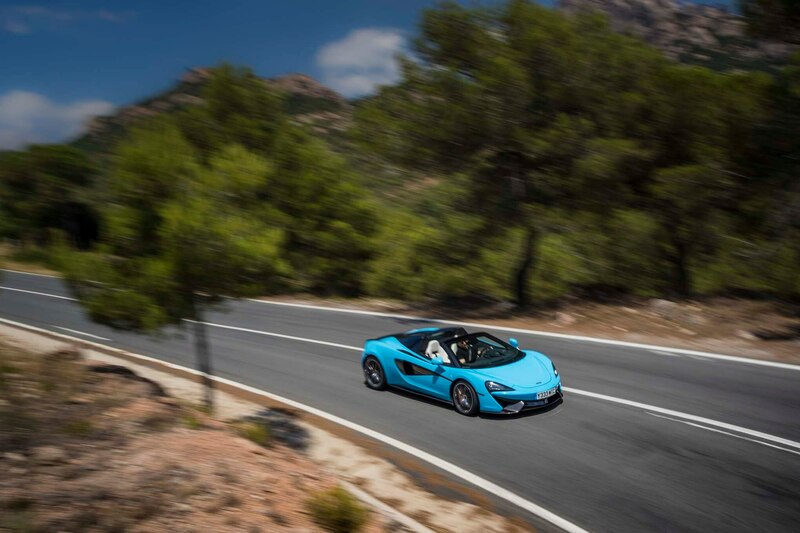 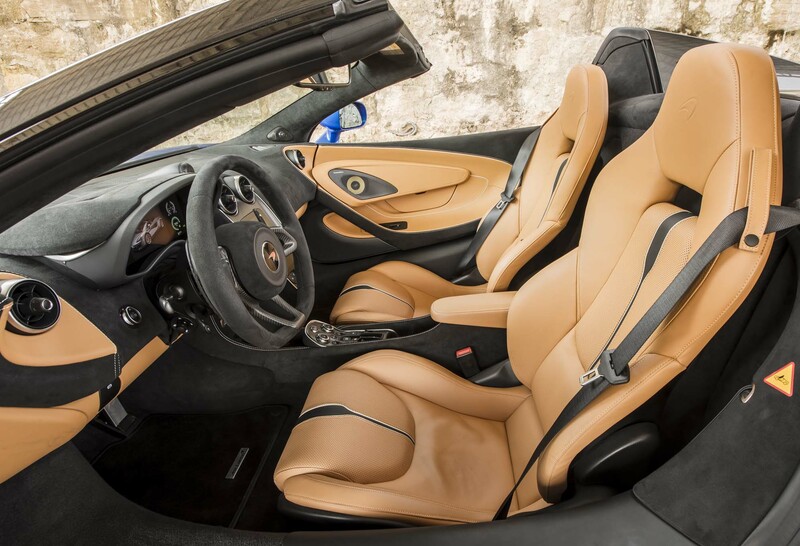 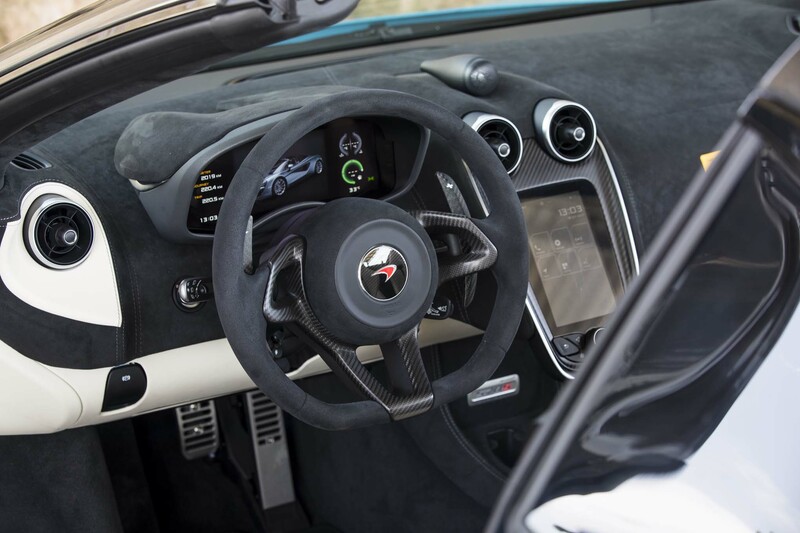 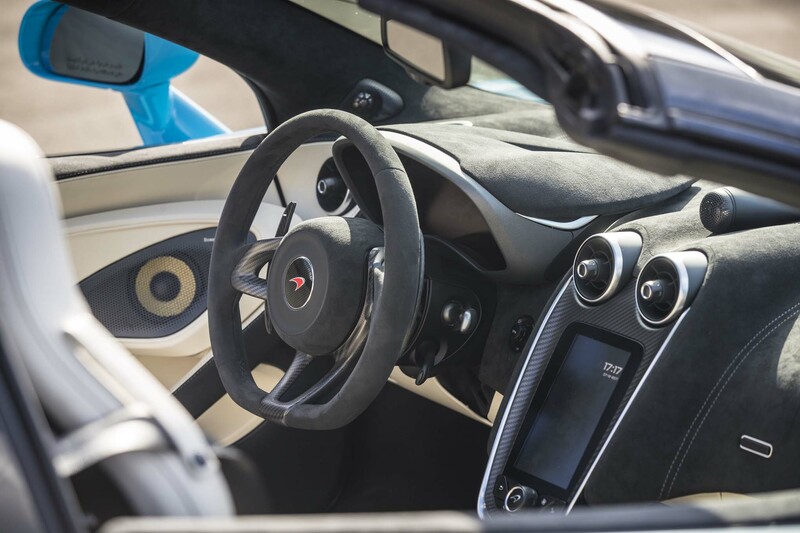 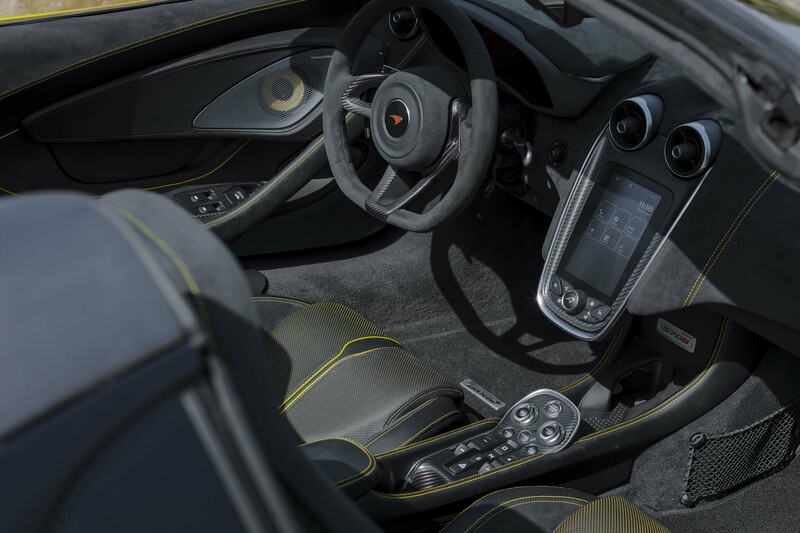 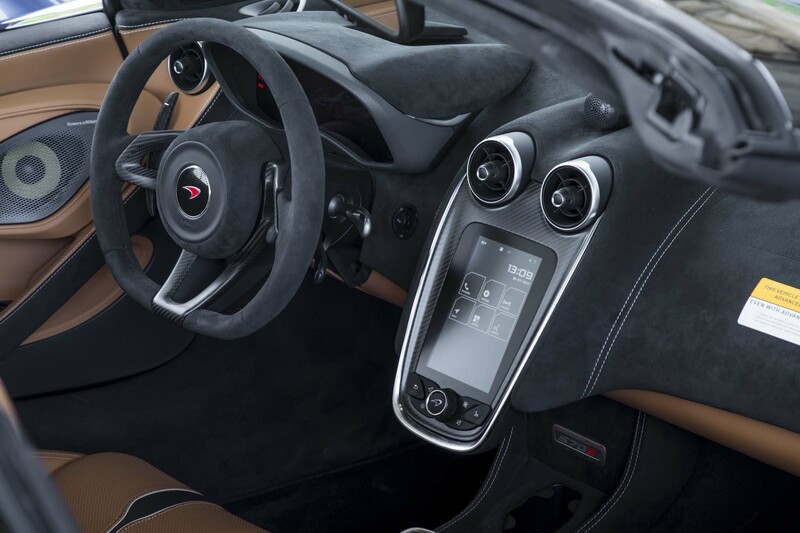 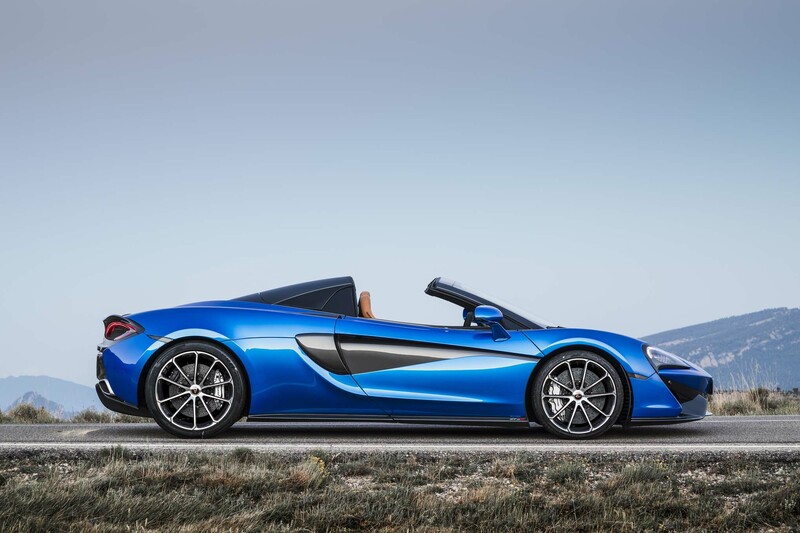 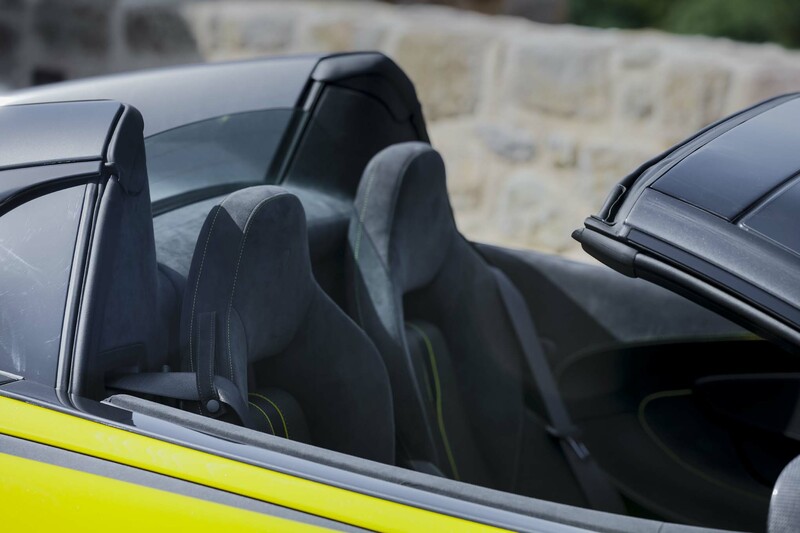 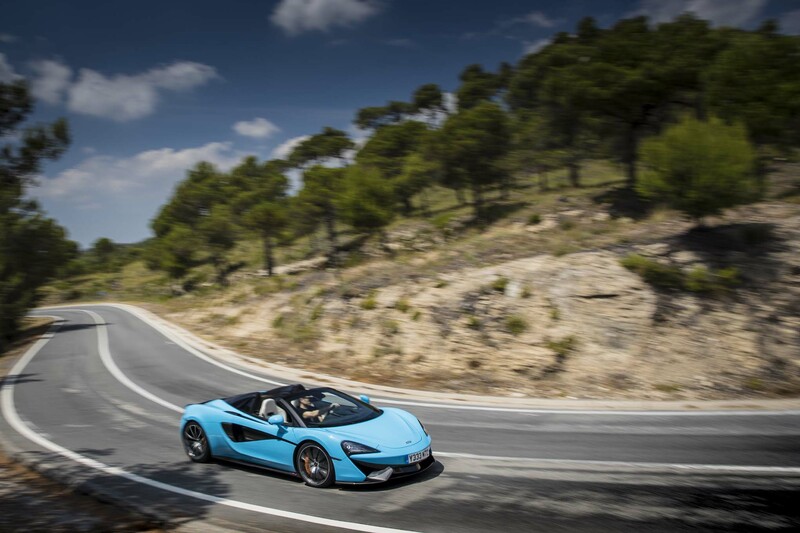 McLaren continues to resist electronic power assist steering systems and its faith in hydraulically assisted racks is absolutely justified in the Spider. 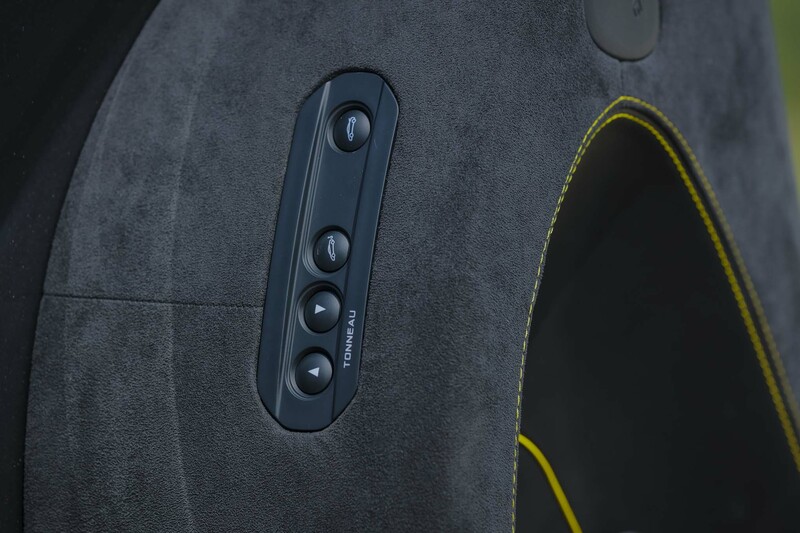 It positively sings with feedback and the weighting and response feel so natural. 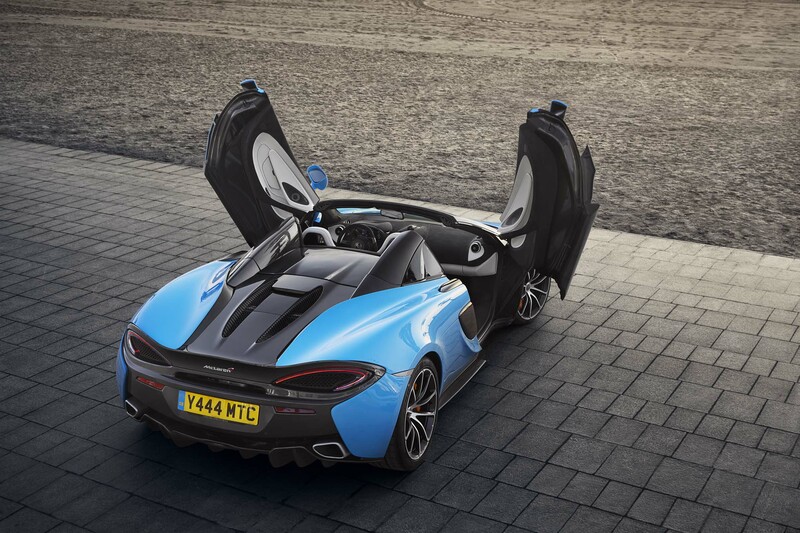 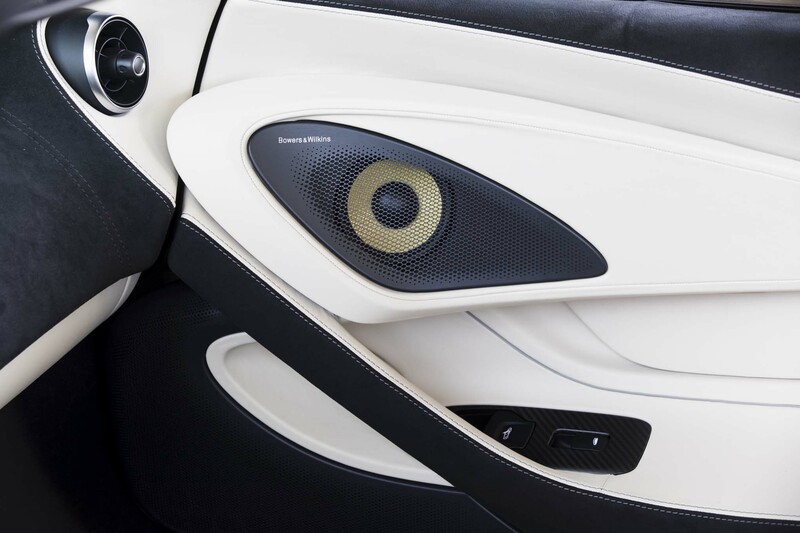 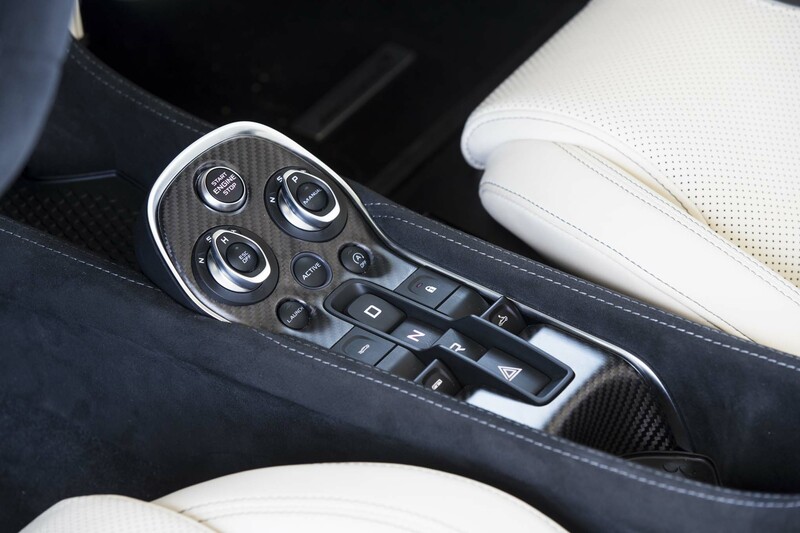 It also helps this car to connect with the driver immediately, which in itself marks the Spider out as something special. 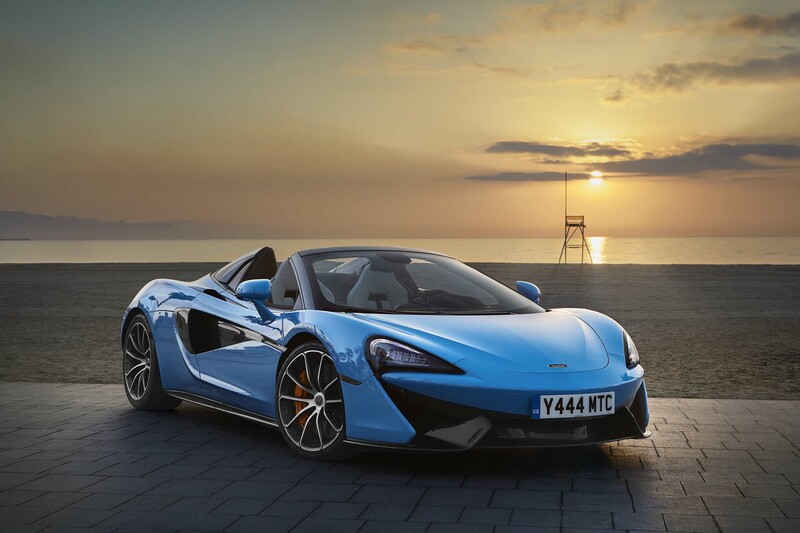 A sports or supercar should engage you from the moment the wheels roll, and McLaren seems to really understand that now. 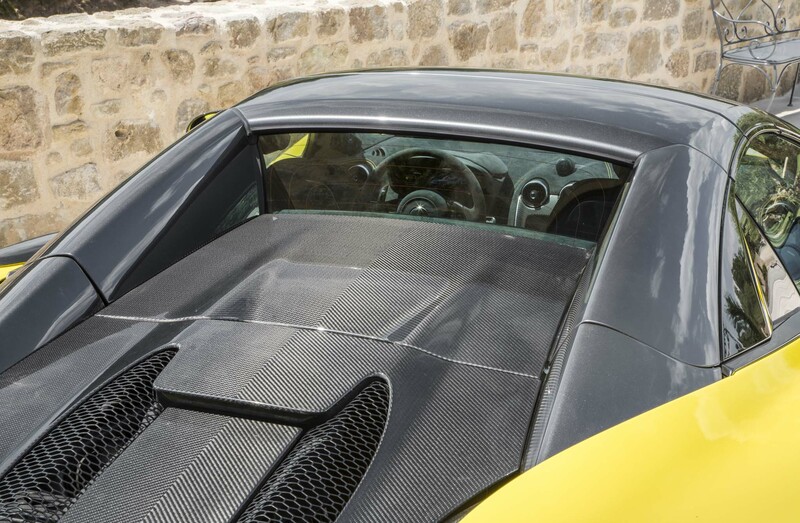 With the city slowly receding in the rear view mirror it’s time to lose the roof and get closer to that 3.8-liter V-8. 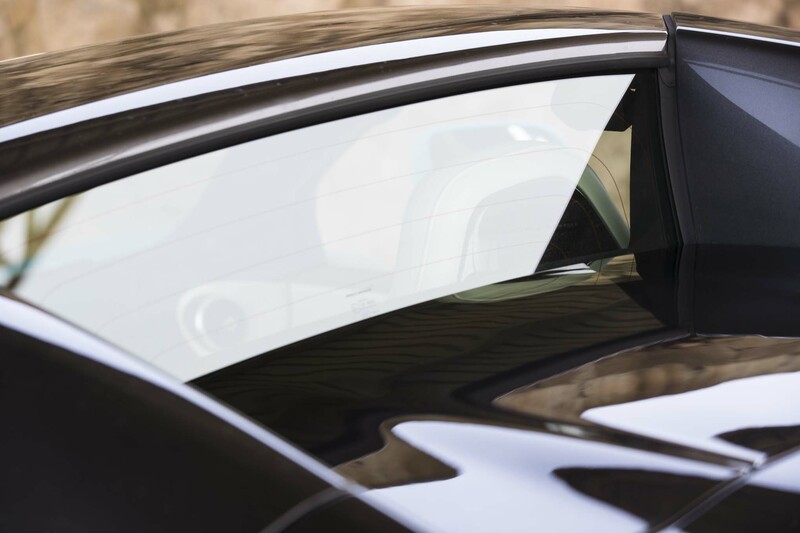 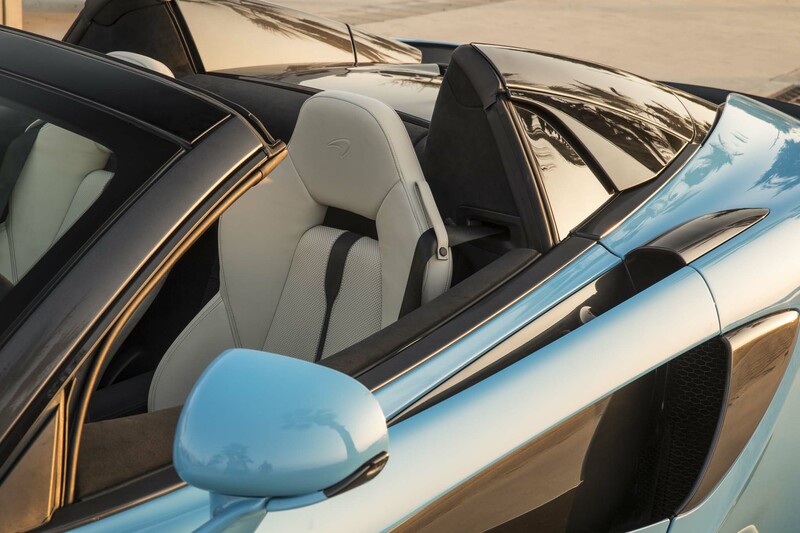 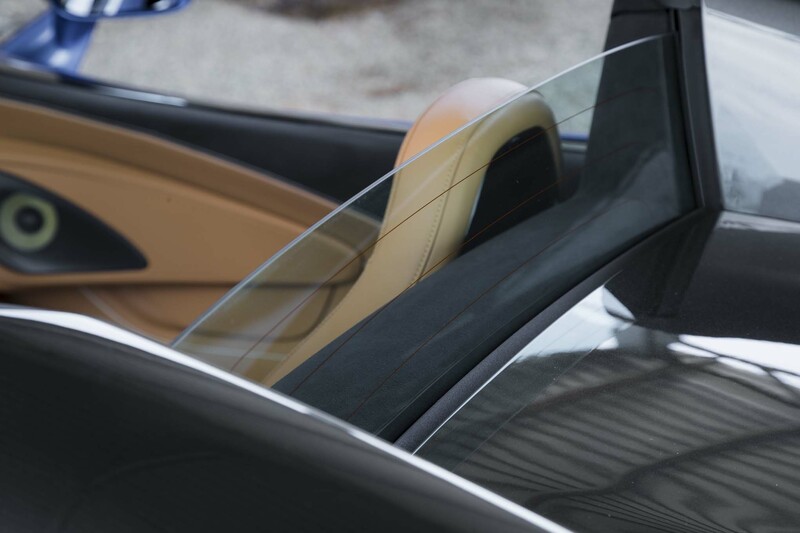 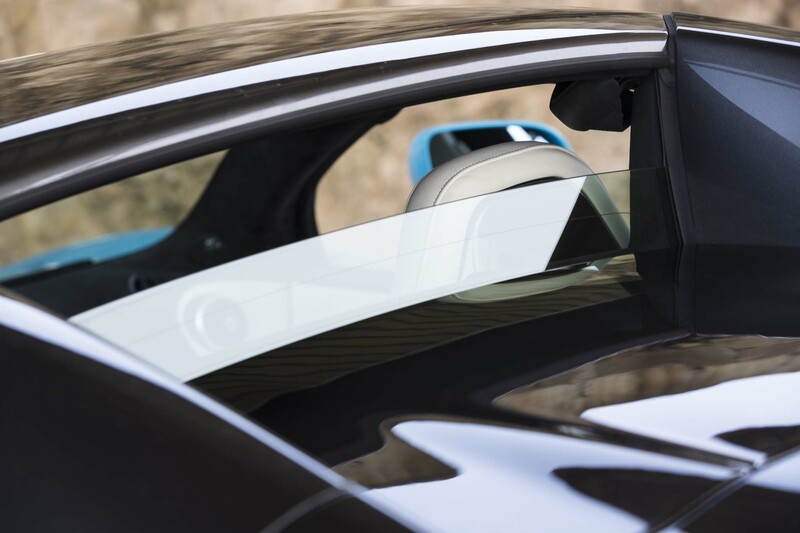 The two composite panels stow away in 15 seconds at speeds of up to 25 mph and the glass wind deflector drops to 75 percent of its full height. 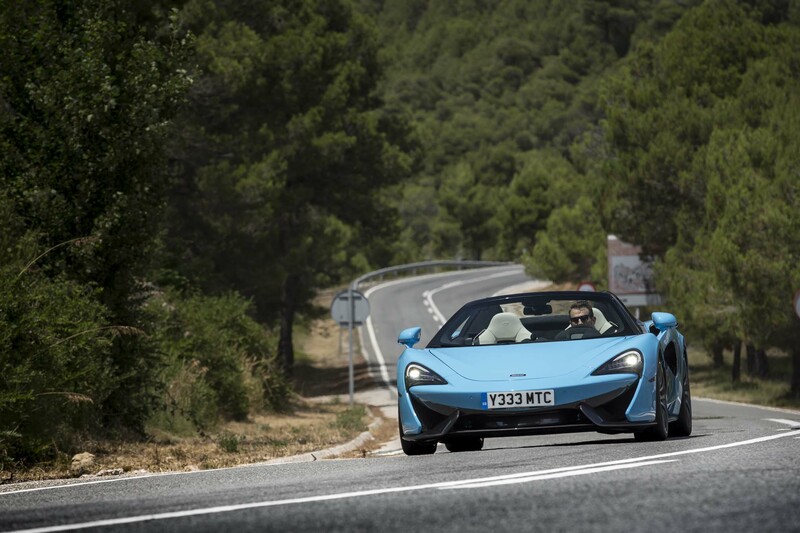 With the windows up the wind swirls a little but it’s perfectly pleasant even at Policia-worrying speeds. 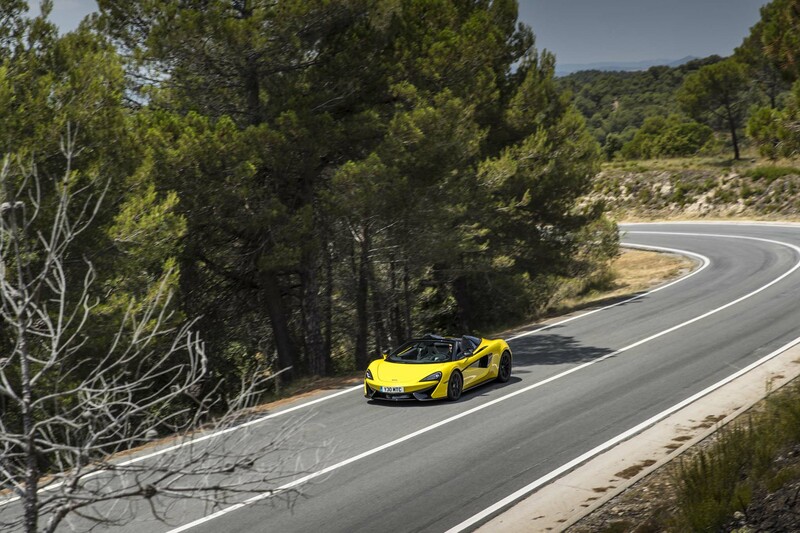 And the noise? 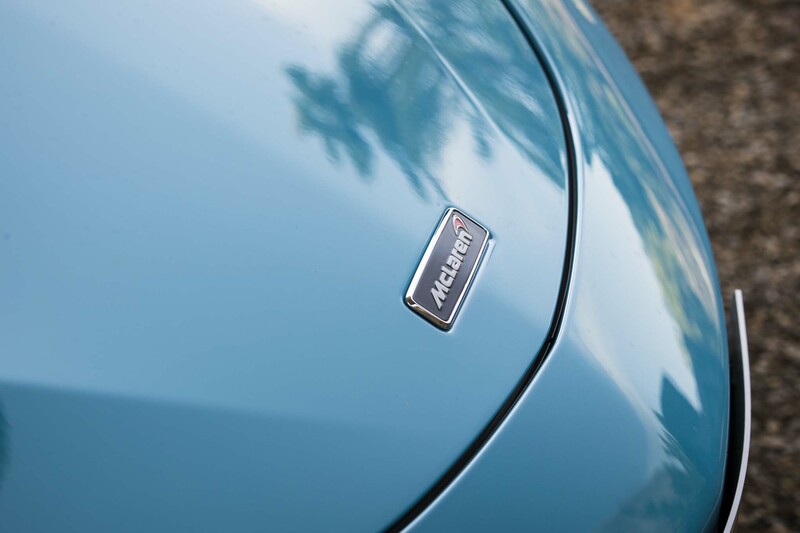 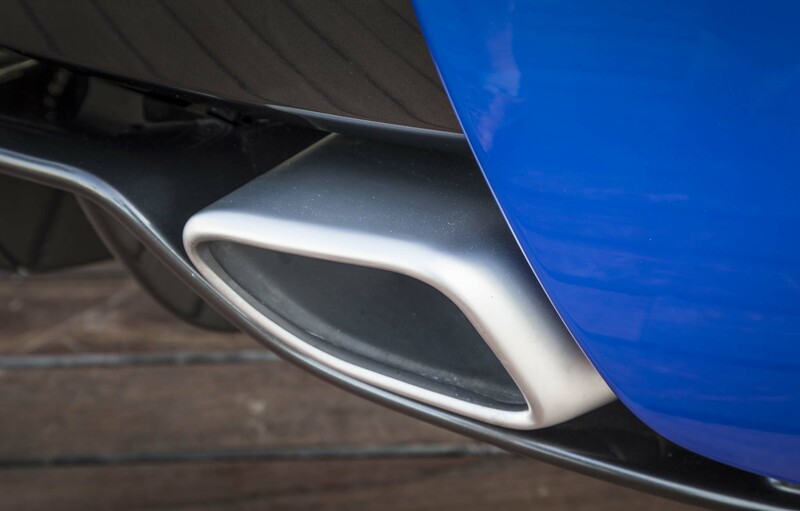 There’s plenty of it with our Sports exhaust-equipped car (a $4,090 option). 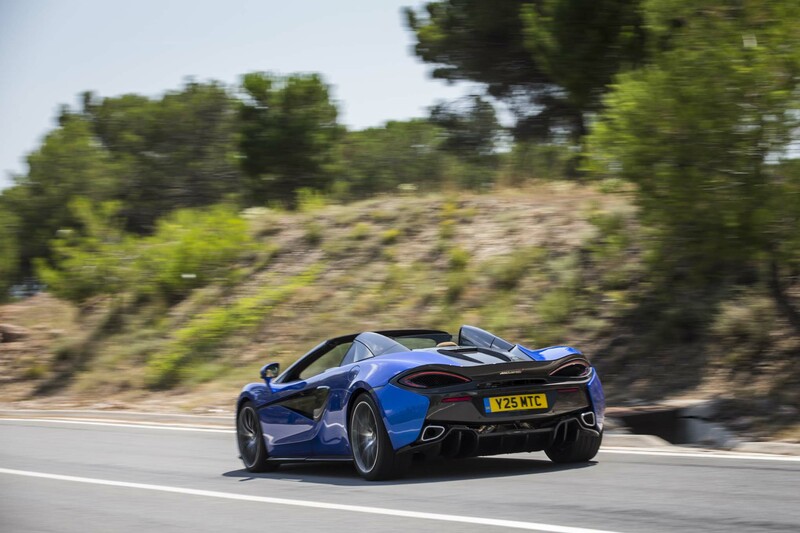 The deep, frenzied blast of hot gases mirrors the simply phenomenal intensity of the acceleration. 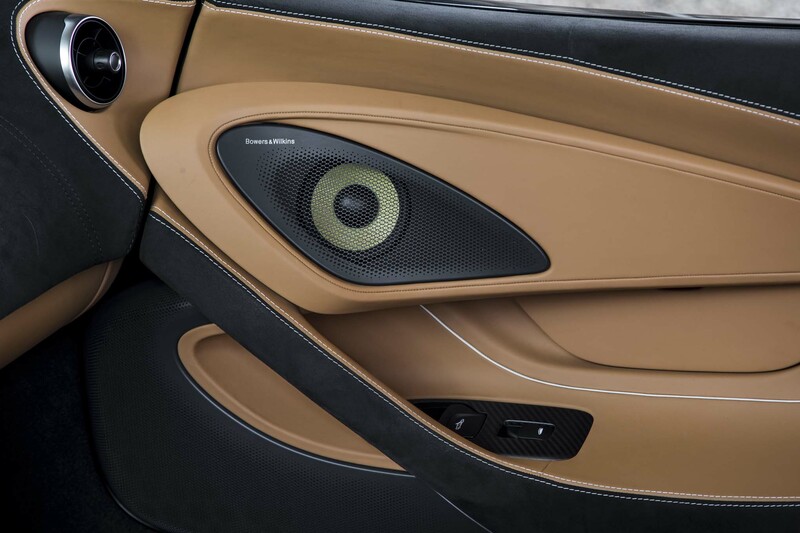 It’s not a beautiful sound. 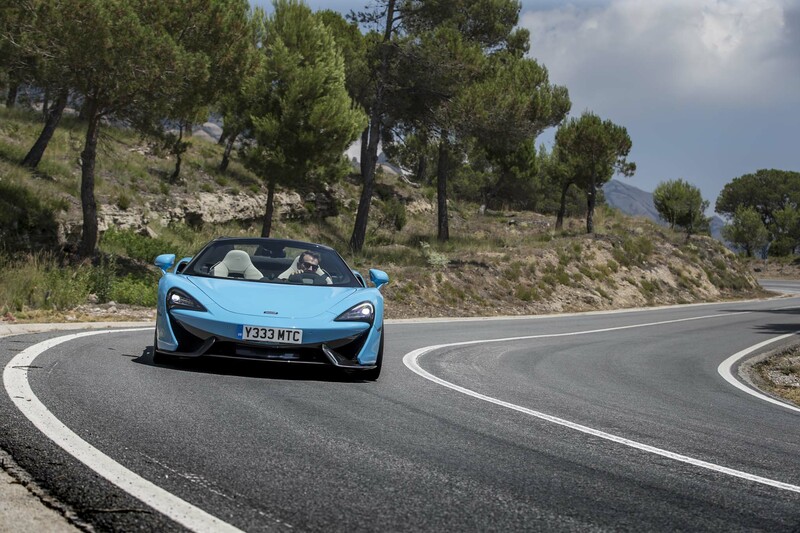 Even so, as the V-8’s angry voice reflects and bounces it ways up rock faces as the twin-clutch 7-speed gearbox punches in shifts with a wicked ignition crack, you know the 570S Spider is a pretty serious supercar. 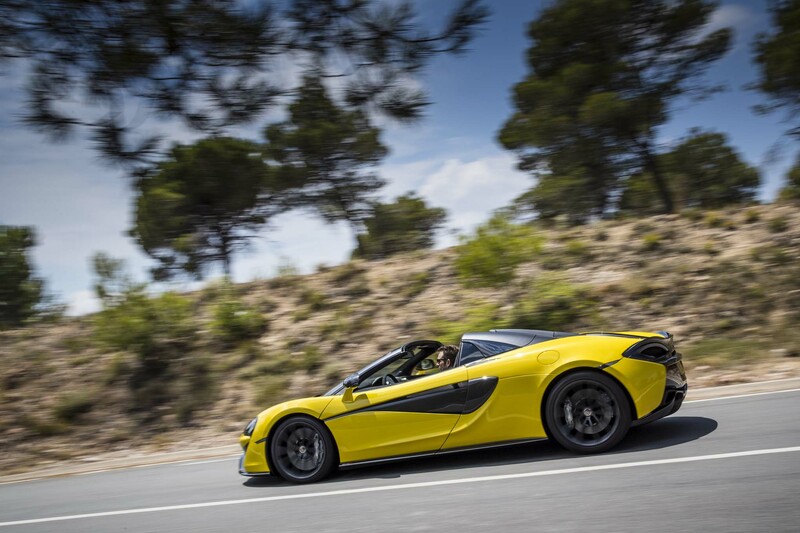 Yes, I said supercar. 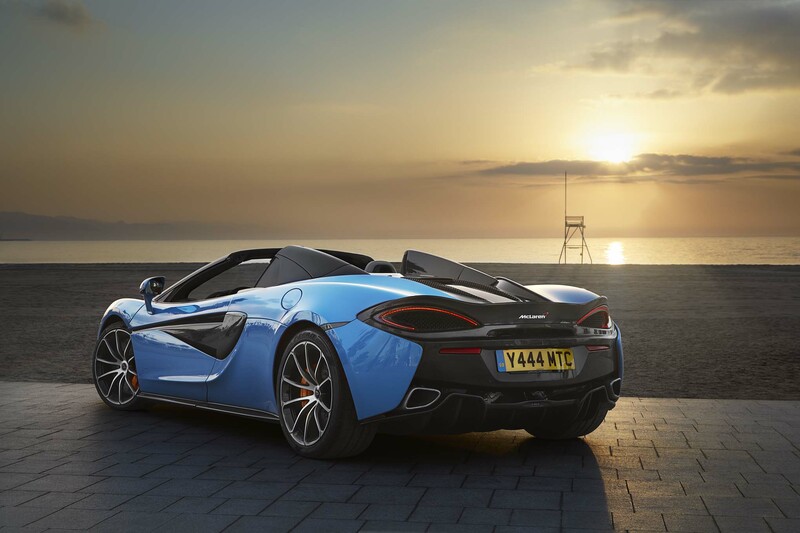 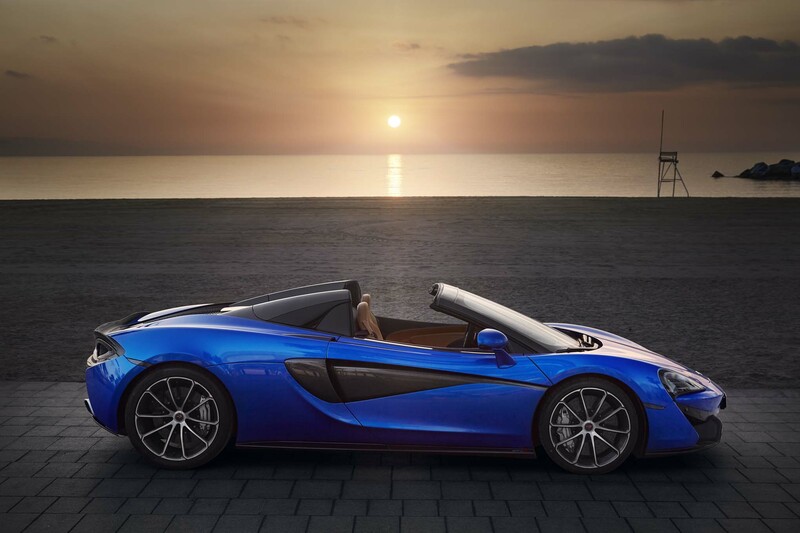 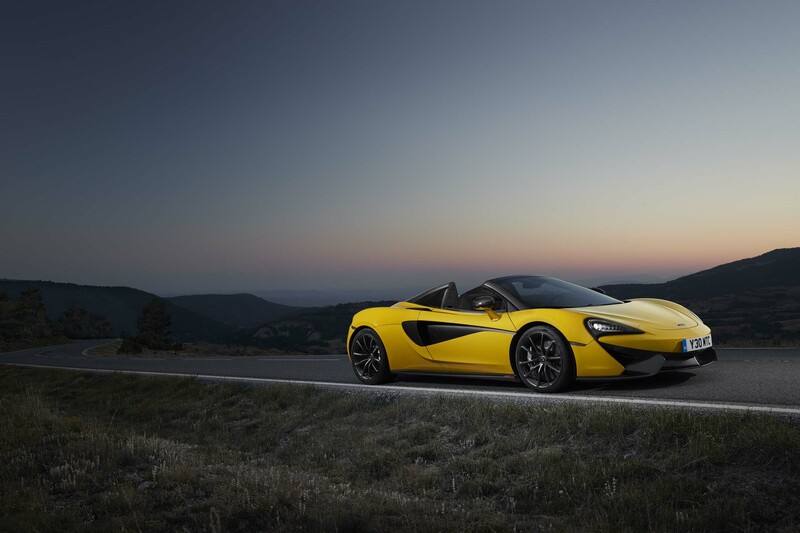 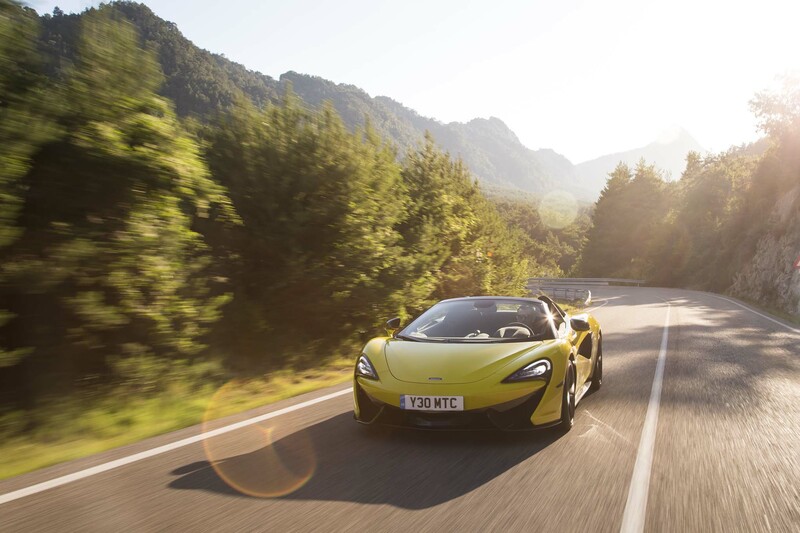 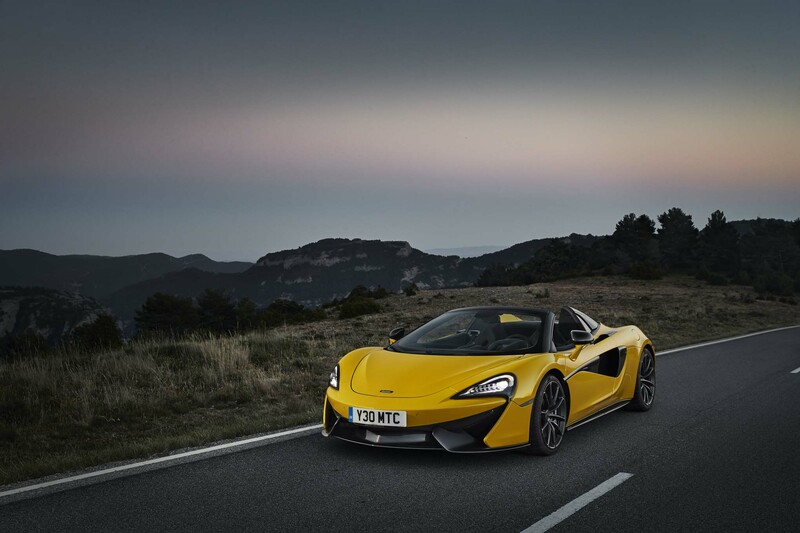 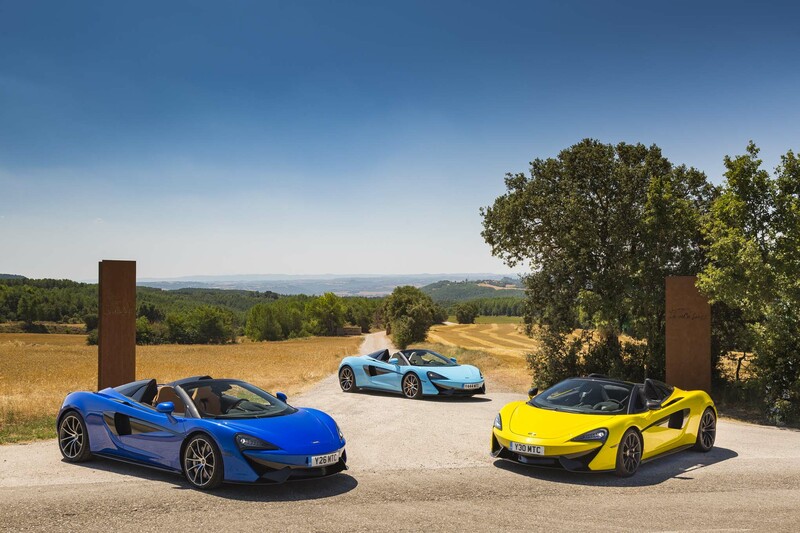 McLaren likes to assert that the Sports Series cars are mere sports cars, but the speed, agility, and focus of the Spider feels pretty damn super. 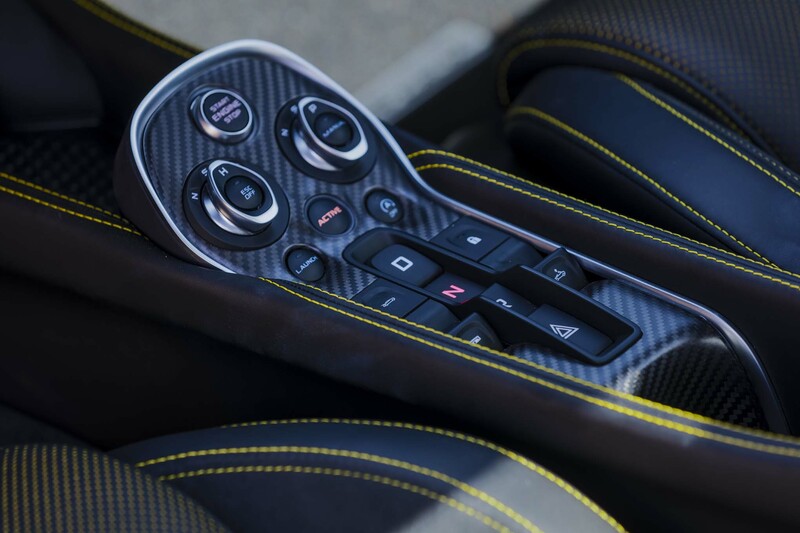 You really do feel the benefits of its lean carbon fiber physique compared to rivals like the R8 because it changes direction so cleanly, rides with such poise and fires along the straights with a real ferocity if you wring the engine right out. 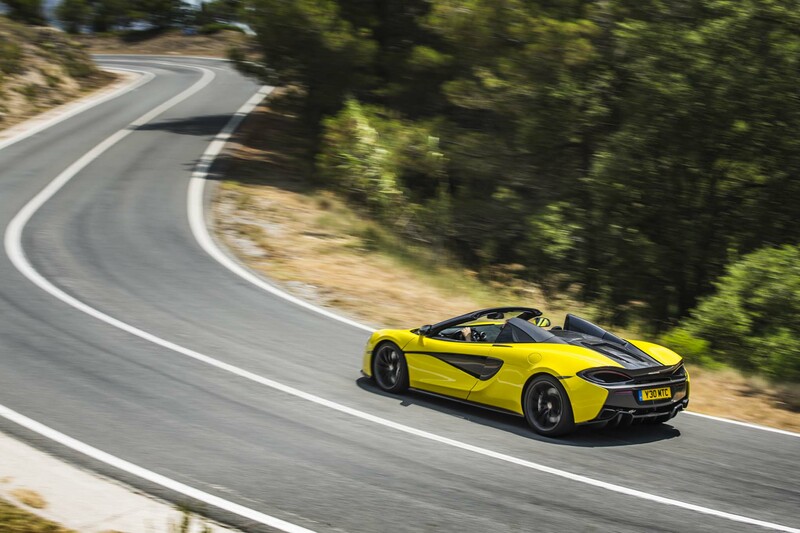 But what’s especially impressive is that there’s a delicacy to everything it does. 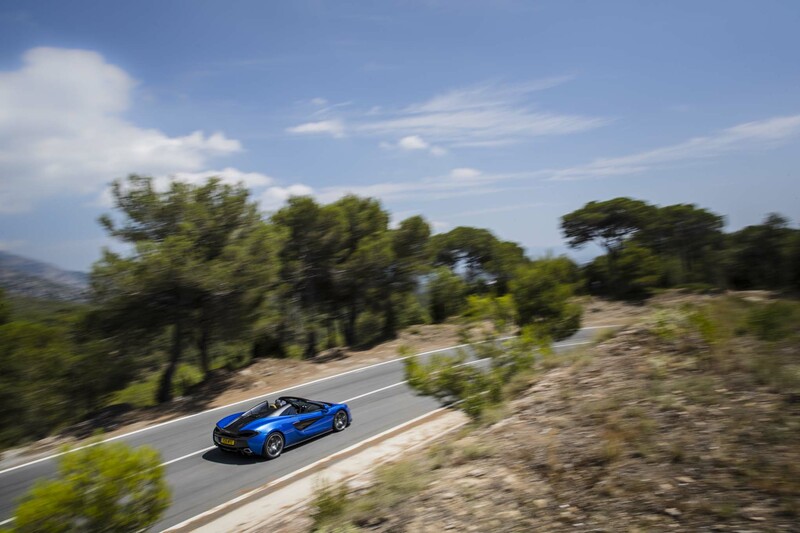 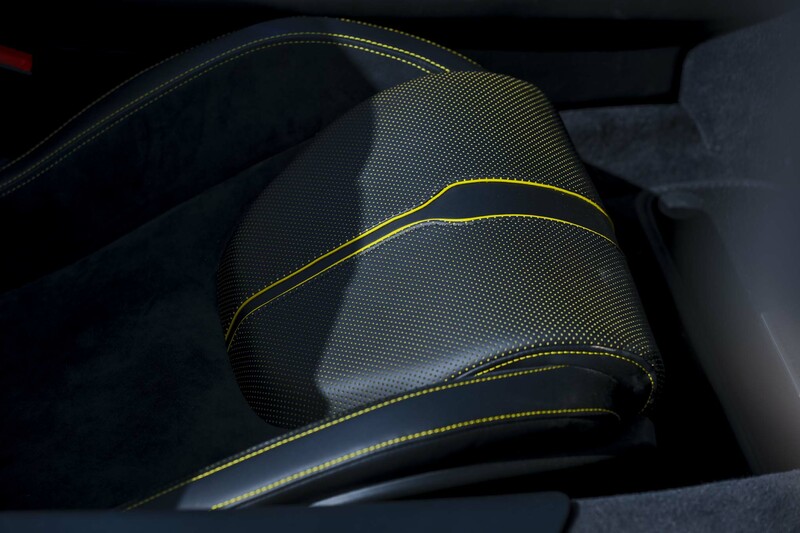 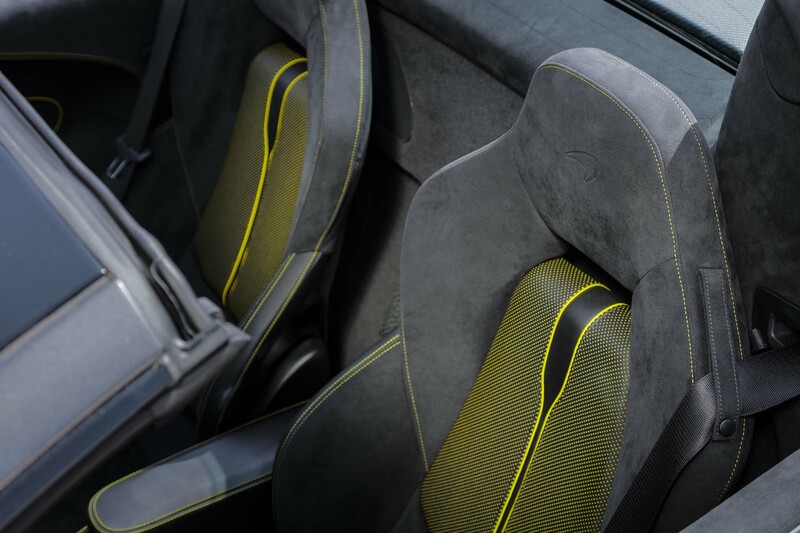 Something like a 911 Turbo S batters a road into submission and makes progress in a series of frantic lunges. By comparison, the 570S Spider glides. 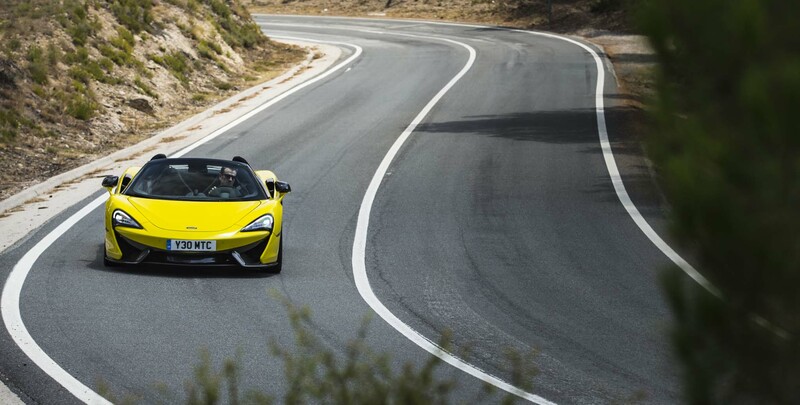 That almost balletic approach makes you want to be smoother, neater, and better, too. 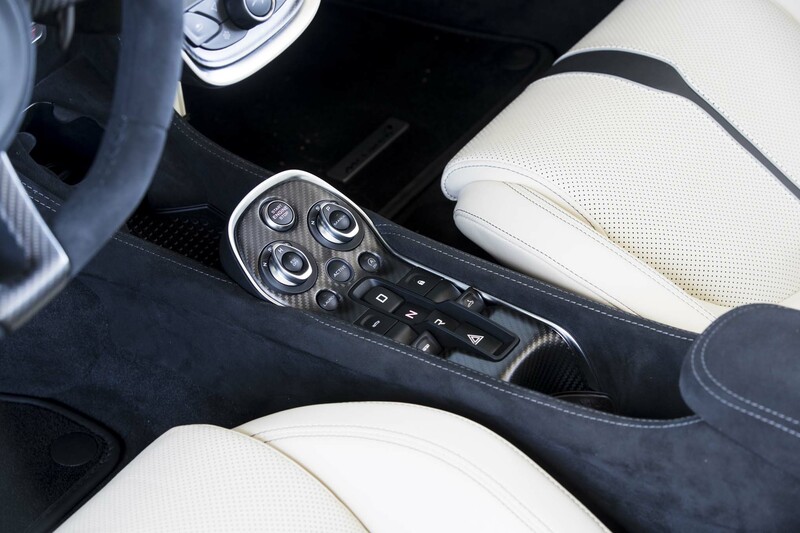 The pedals are perfectly placed to practice left-foot braking. 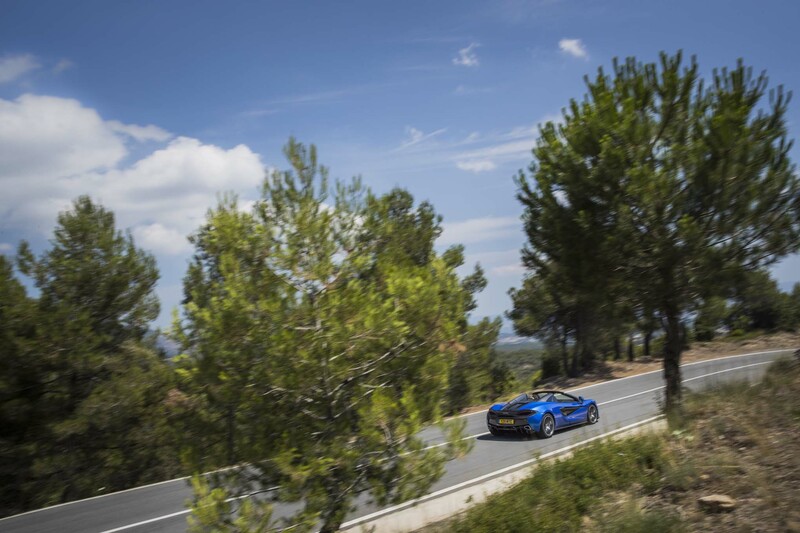 When you try you find that what felt like slightly too long of a pedal travel with your right foot suddenly feels perfect. 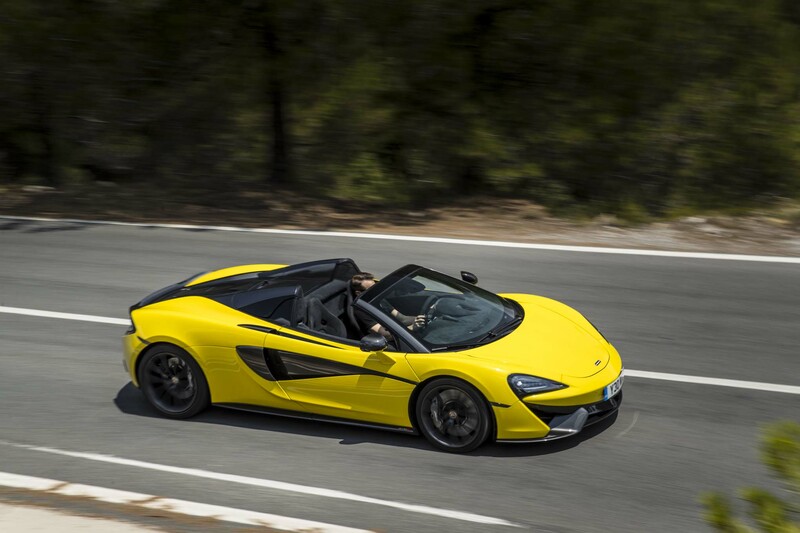 I love that you can unpeel layers of the 570S Spider’s character and abilities over time like this. 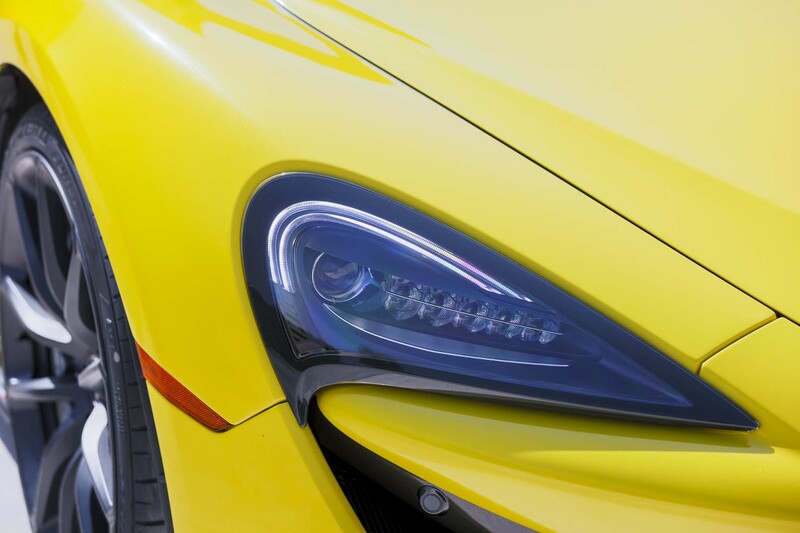 It’s one of those cars you know you’d be learning new things about for months, maybe years to come. 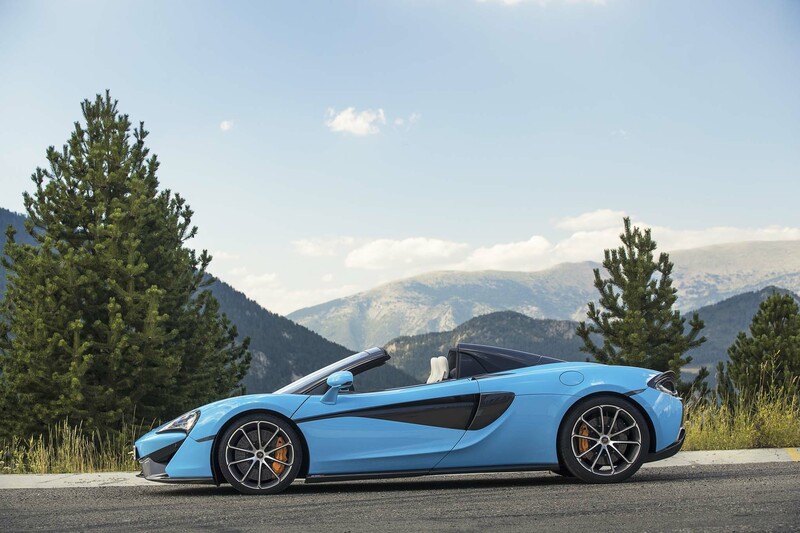 My only problem with the 570S Spider is that there’s a slight mismatch between the magic of the chassis and the response of the twin-turbocharged V-8. 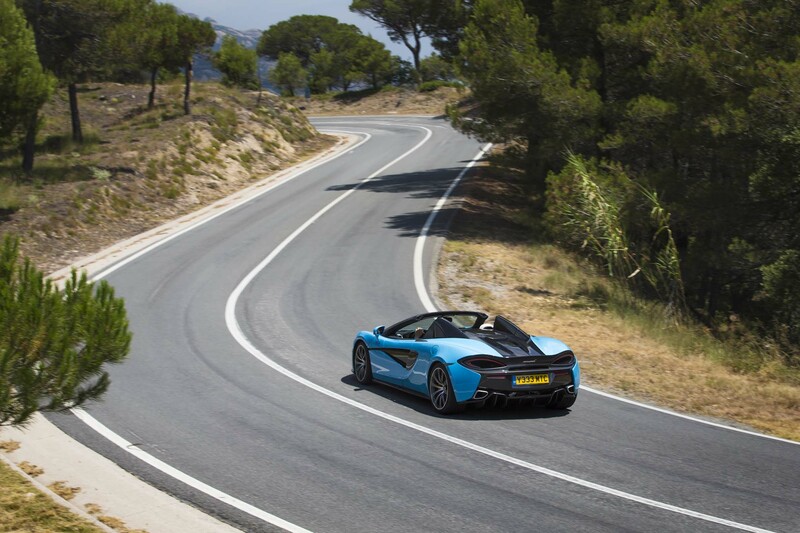 You want to pour the car down a road, using its agility, mid-corner stability, and carrying speed. 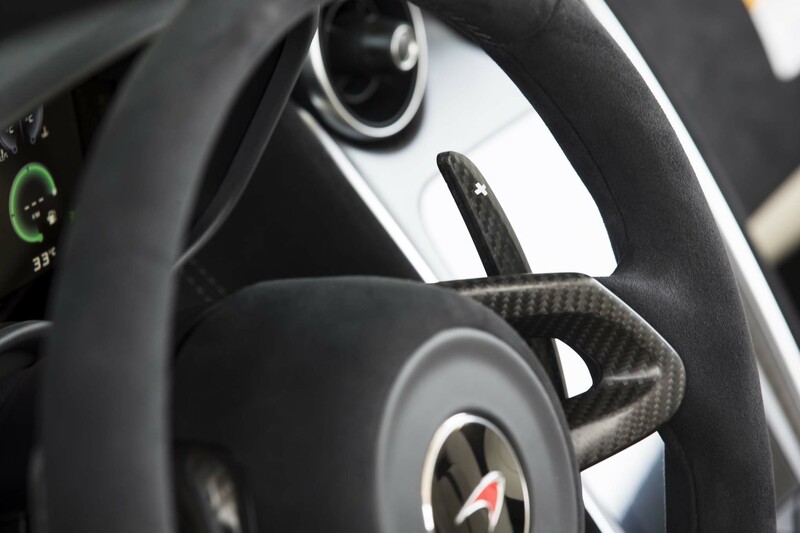 So your instinct is to stay in a higher gear and let the car take the strain, but when you do the Spider’s balance disappears on corner exit. 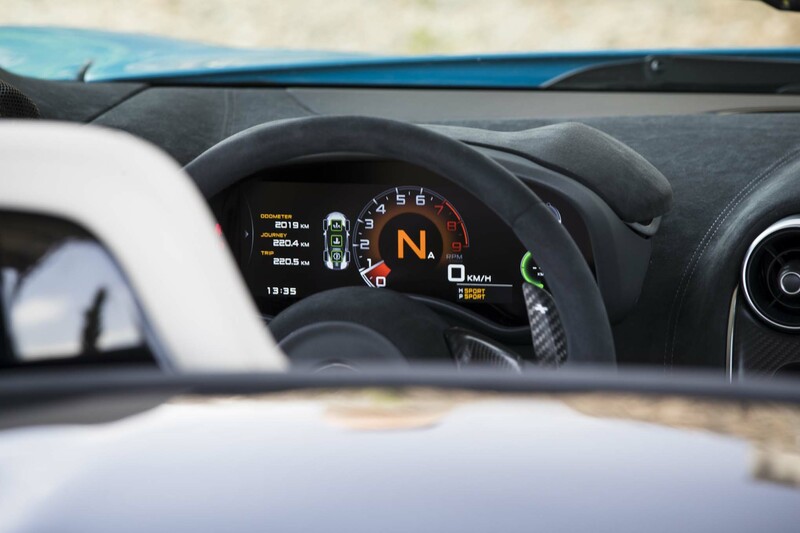 You expect instant throttle response – every other control is almost telepathic – but don’t get it as the power comes in relatively slowly. 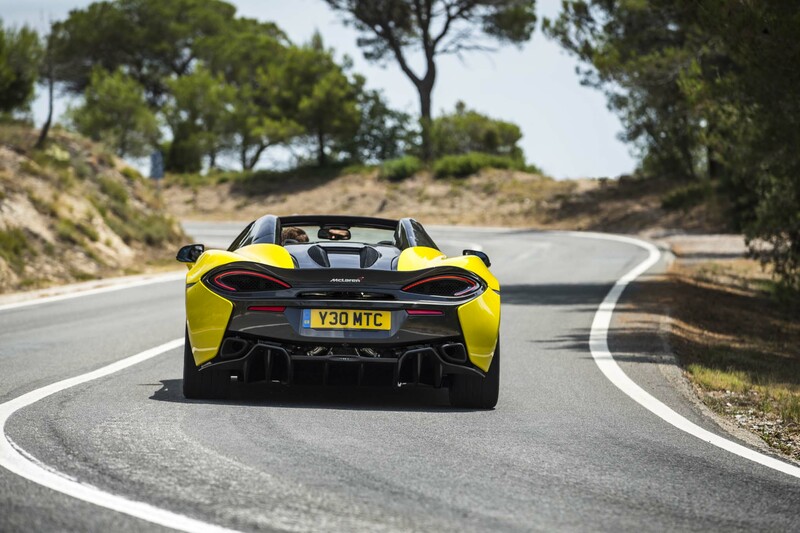 The rear can’t help but steer the car and instead the nose pushes wide. 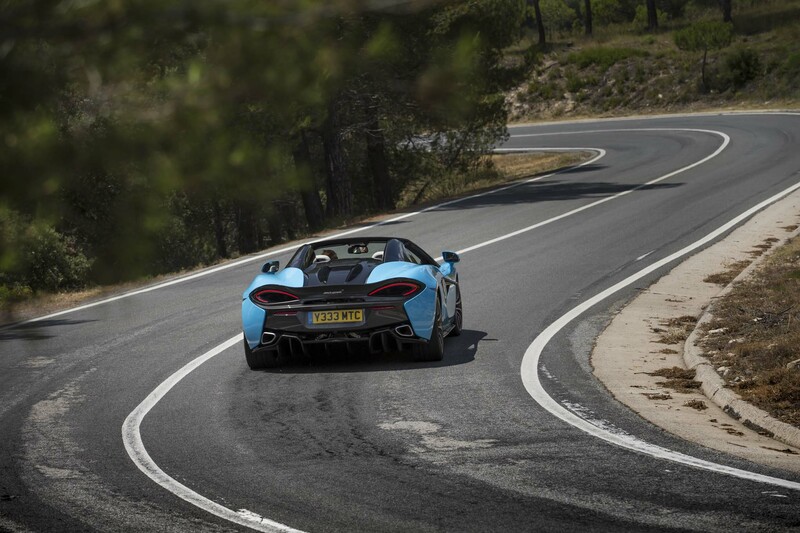 Try a gear lower and the problem remains: You’ve nailed the corner entry thanks to those lovely carbon-ceramics, turned the car in, and felt the grip levels intimately thanks to that feelsome steering. 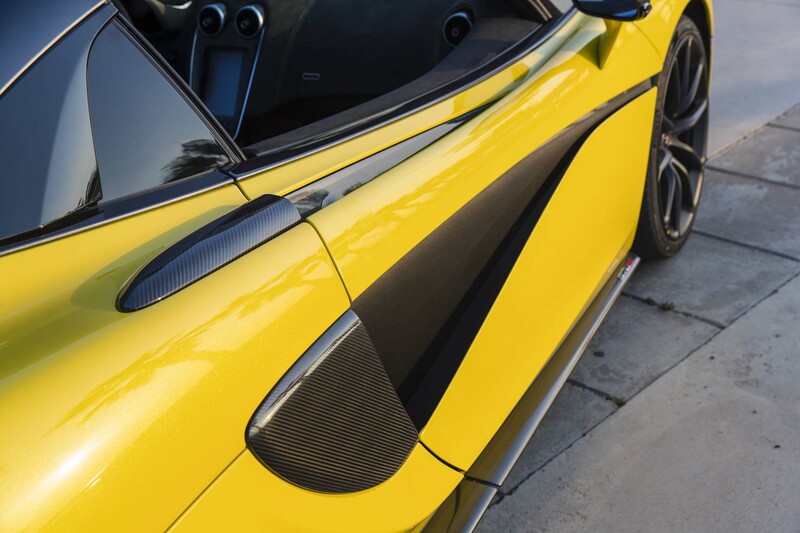 At this point the Spider is balanced, right up on its toes. 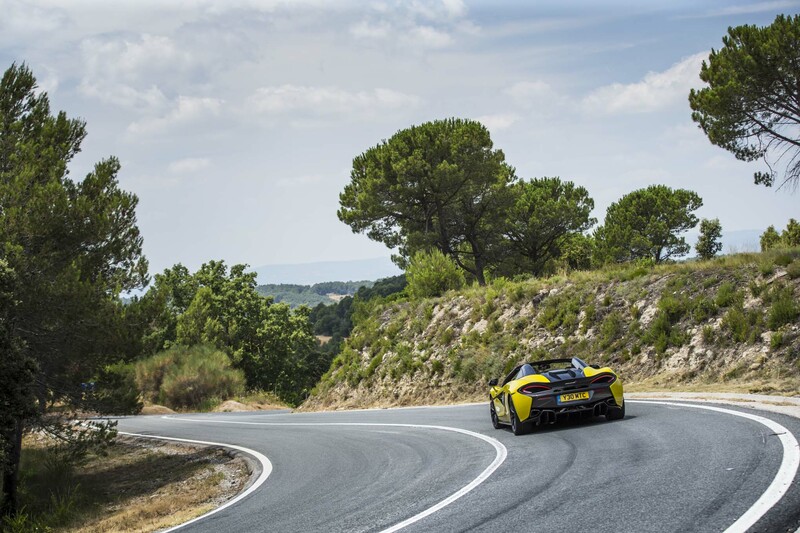 You spot the road straightening and want to pop out onto it like a champagne cork, but you pin the throttle and not much happens… then, maybe a half-second after you’d wanted it, the power comes in hard but the corner is over and you feel like you only got to enjoy half of it. 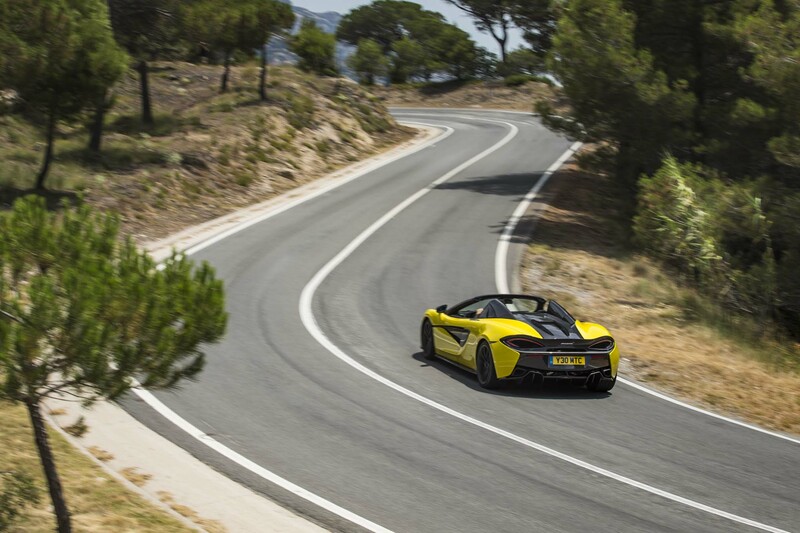 Okay, maybe an even lower gear? 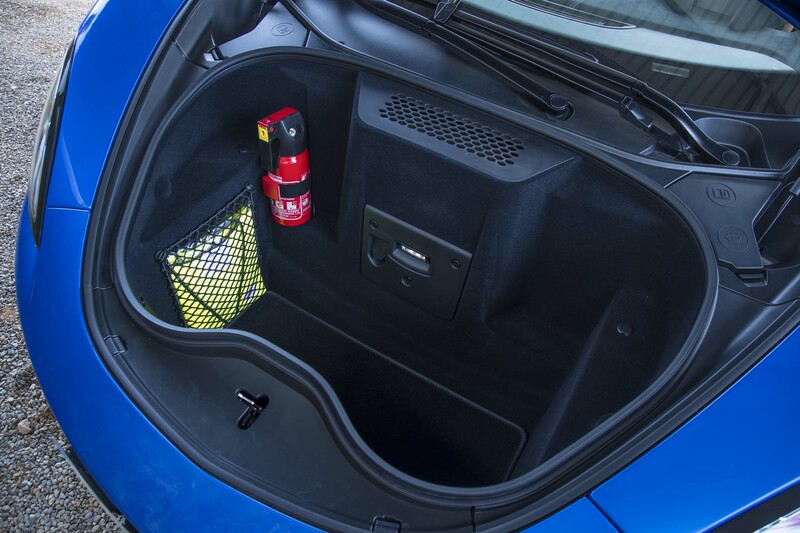 Yep, that works. 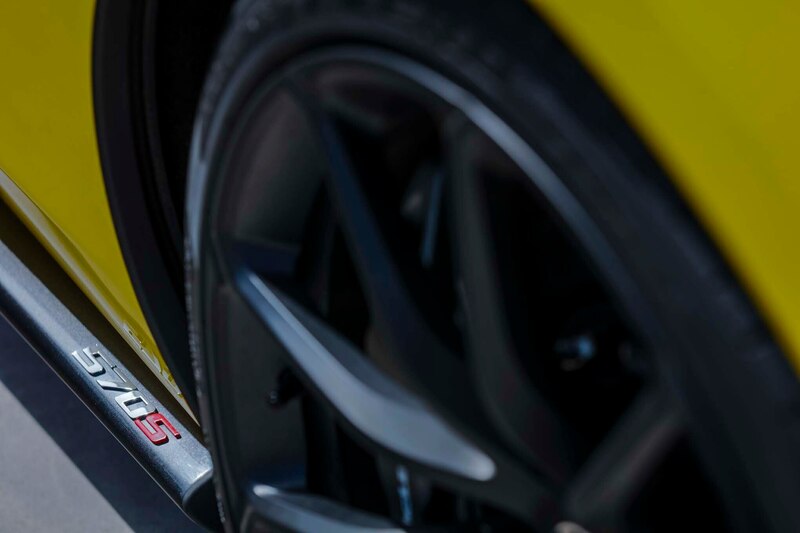 There’s still some waiting for the turbos to really start working hard, but now you can use the chassis balance and feel how well calibrated the Dynamic mode for the ESC systems is. 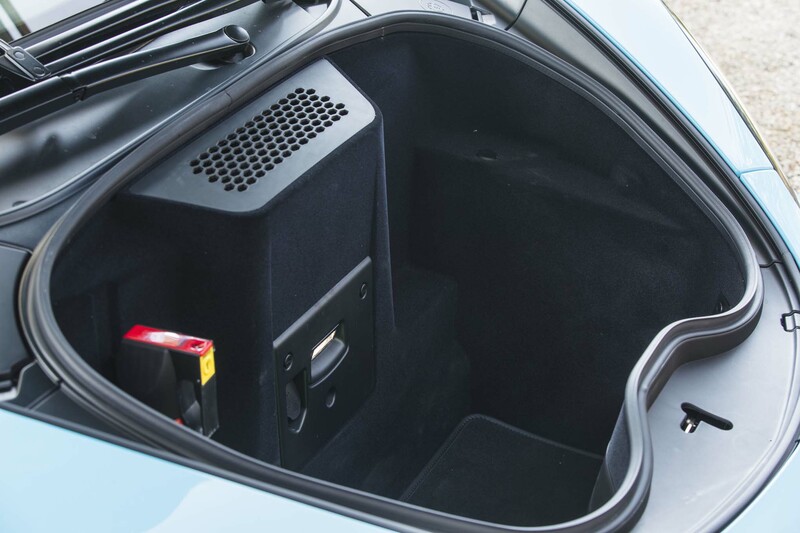 It lets you push right to the edge but subtly manipulates the rear back into line should you over commit. 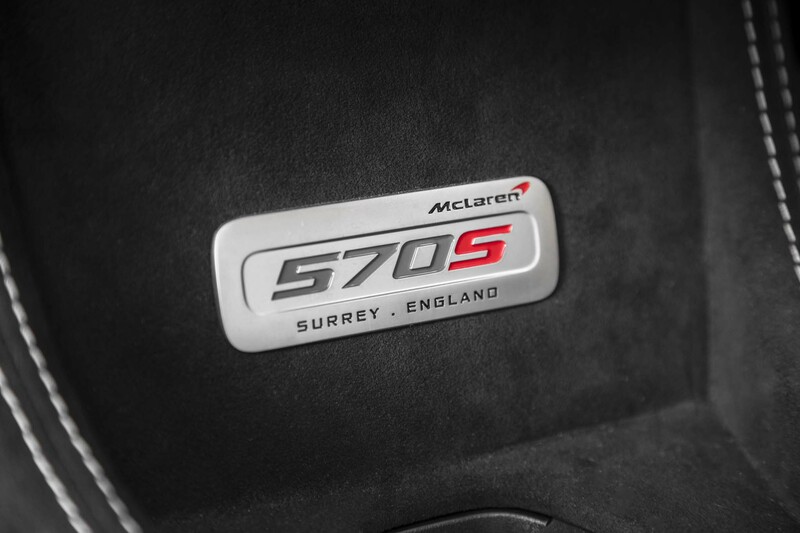 Even so, there’s something slightly out of kilter here. 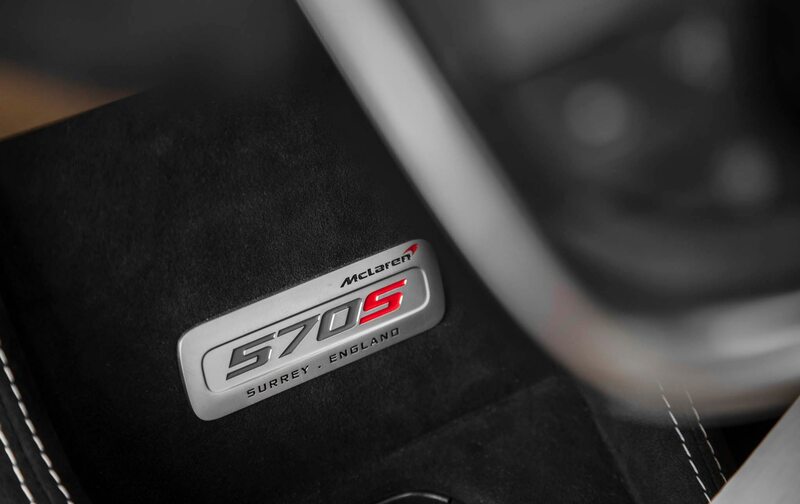 The handling allows you to be smooth, measured, and accurate, but the engine demands you absolutely beast it to really maximise the car’s inherent poise. 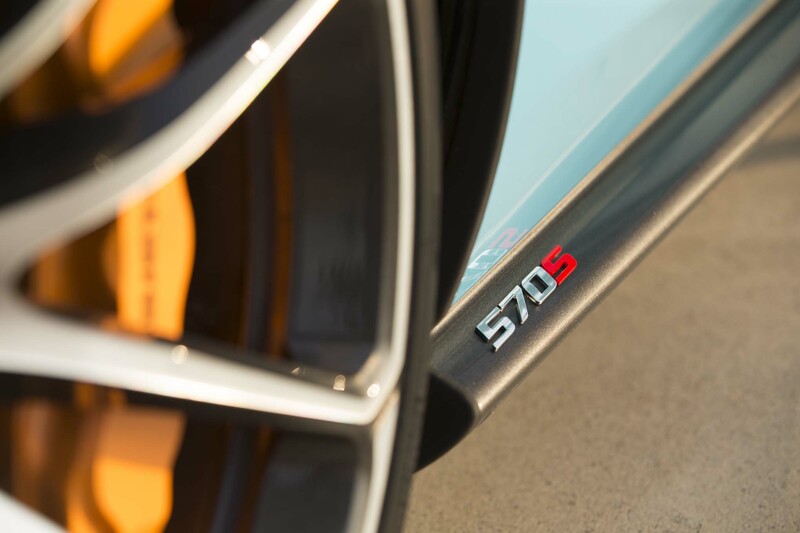 I keep daydreaming about how special a 570S Spider fitted with an Audi R8 Plus engine might be. 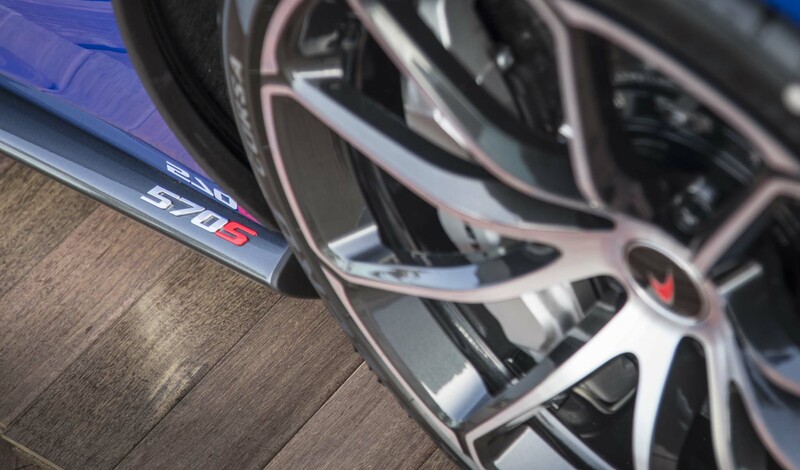 Of course, that’s never going to happen. So back in the real world (well, for some people), should you take a 911 Turbo S Cabriolet, R8 V10 Spyder or McLaren 570S Spider? 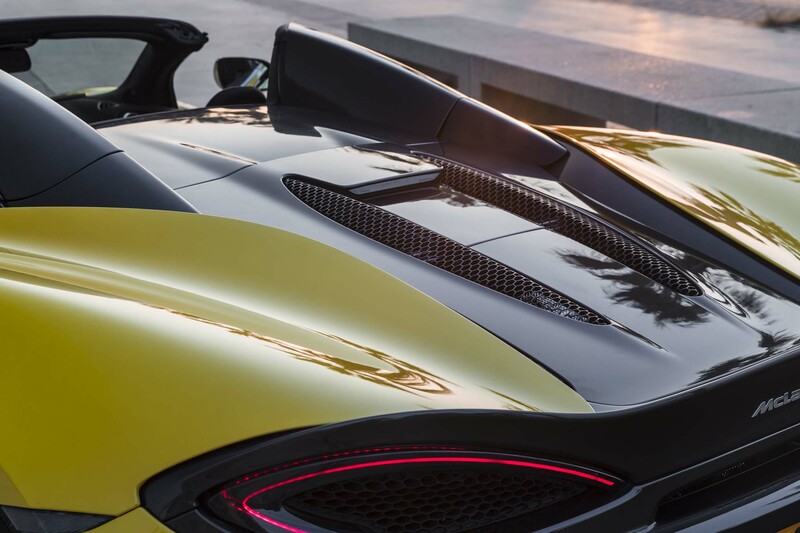 I think the McLaren wins. 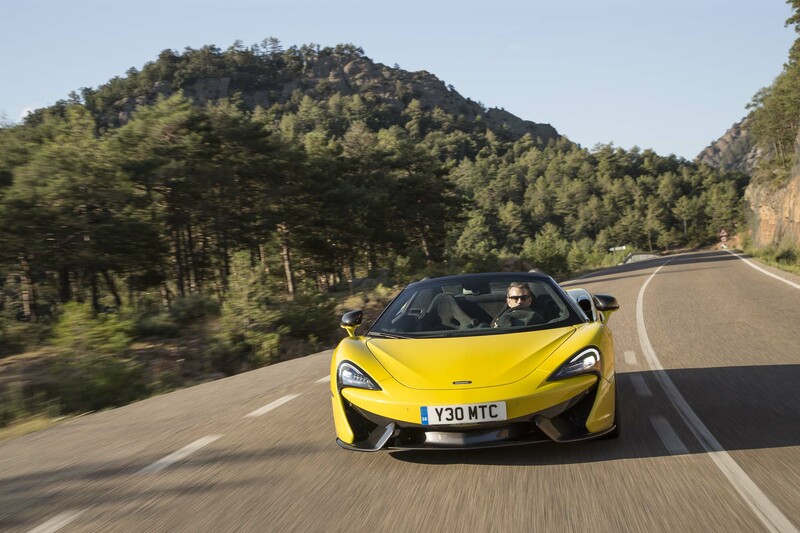 And by a pretty decent margin.